The events leading up to the capture of the Ludendorff Bridge at Remagen in March 1945, and the fierce fighting and unconventional German counterattacks that followed, have been overlooked in most accounts of the battle. 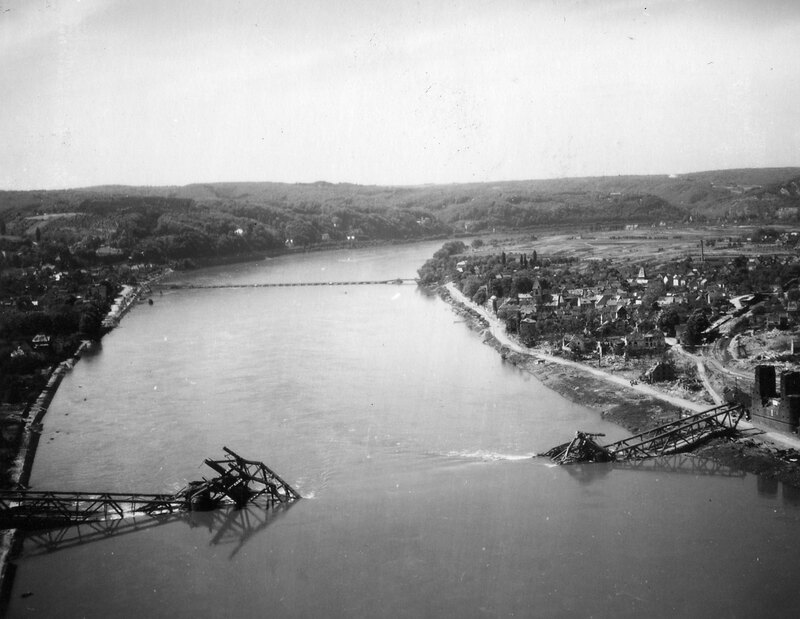 The crossing of the bridge at Remagen by the Americans was only part of the story as the GIs moved into the Westerwald region of the Rhineland. 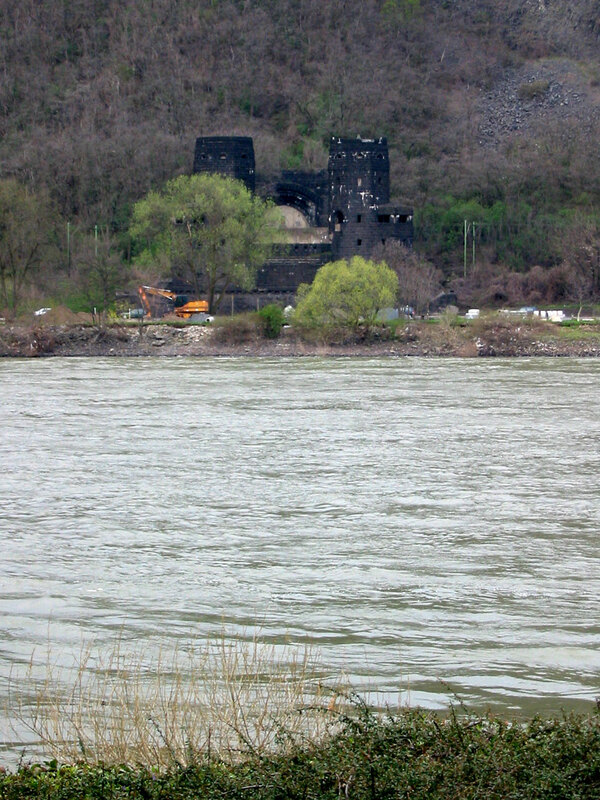 Hitler's insistence the Ludendorff Bridge be destroyed by any means resulted in the first tactical use of the V-2 ballistic missile against a strategic target. Also, the Allied advance in the region, along with dwindling rocket fuel supplies, resulted in the retreat of V-2 Battalion 836 (Art. Reg. 901) from the Westerwald area. As Lieutenant Karl Timmermann looked out from his vantage point on top of a hill to the northwest of Remagen, Germany, he was stunned to see a beautiful steel structure—a still-standing railway bridge over the Rhine River. As he peered through his binoculars, Timmermann could see thousands of fleeing German soldiers and civilians. Wehrmacht troops had already prepared the bridge for demolition. The masses were crossing to the east in an attempt to escape the American forces that were descending on the resort town of Remagen. It was March 7, 1945. A cold, gray, chilly day. It was only hours before, because of casualties among ranking officers, that Timmermann, from West Point, Nebraska, had been promoted to commanding officer of Company A, First Battalion, 27th Armored Infantry Regiment, 9th Armored Division. Timmermann's company represented the lead elements of a large American push to the Rhine. 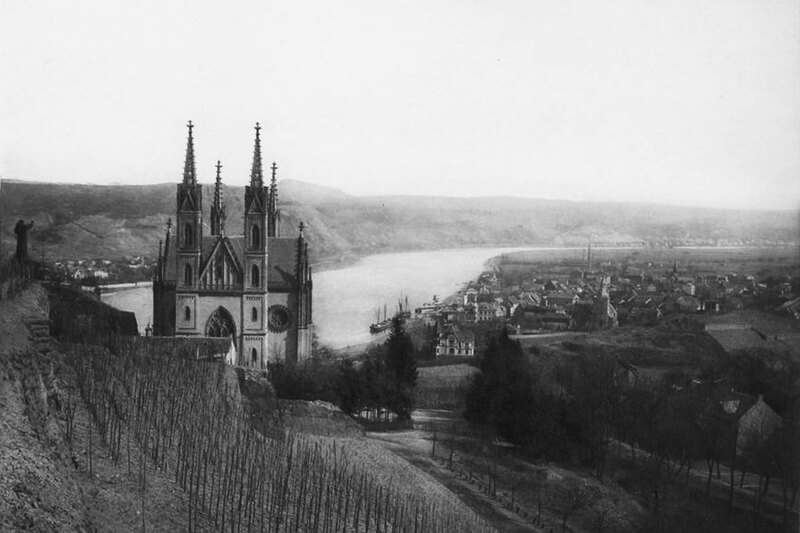 They had arrived at a high point overlooking the scenic resort town on the west bank of the Rhine River, halfway between Cologne and Koblenz. Ever since it had crossed the border farther north a few weeks earlier, the 9th Armored had been locked in fierce fighting against German resistance. They had seen comrades wounded, maimed, and killed. Timmermann's men were exhausted, cold, angry, and frightened. There seemed to be little reason for unwarranted heroics, no one wanted to get killed now, since it seemed Allied victory was inevitable. 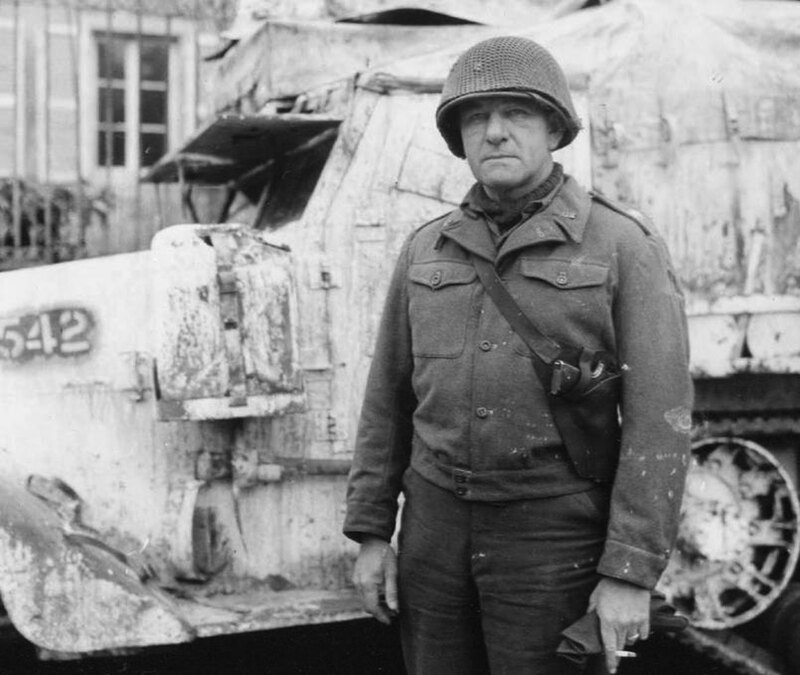 Major General John W. Leonard's 9th Armored Division had left Fort Riley, Kansas, in August 1944. They crossed the Atlantic on the Queen Mary liner, and then spent September in training in England. After crossing the English Channel, the 9th joined the fight during the Allied drive eastward across France. Many of the men felt they had already experienced their fair-share of combat. During the German counterattack in December 1944—the Battle of the Bulge—portions of the 9th Armored and been used to fill gaps in Allied front lines. Following the battle in the Ardennes, the Allies began steps for the final assault into Germany. 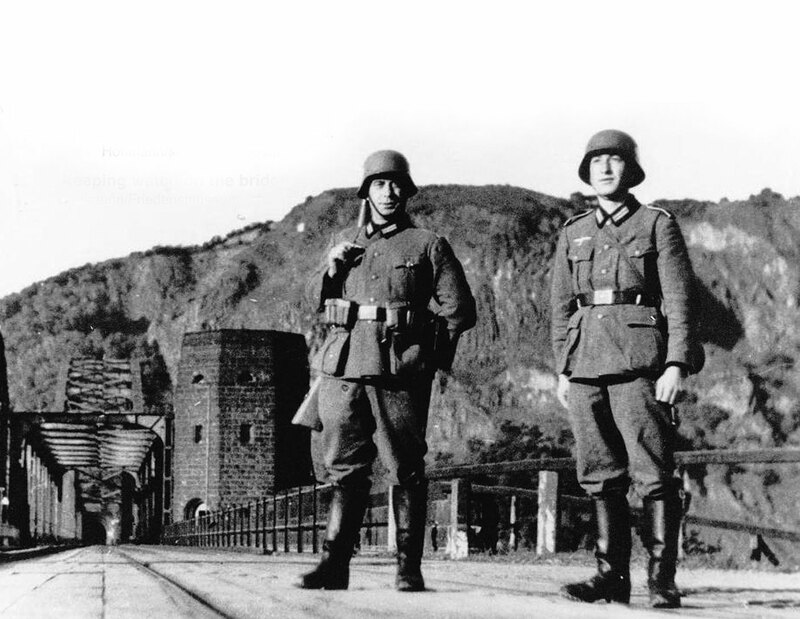 The Siegfried Line and the Rhine River were the last great barriers into Germany. The long-delayed US Army thrust over the Röer River, Operation Lumberjack, finally took place in February, placing the US Army along the Rhine. The Rhine represented the last major geographical barrier to the Allied advance into Germany. The 9th Armored Division had been in training during the early weeks of 1945. They returned to the front lines in late February joining III Corps as it prepared to cross the Röer River. The First Army was headed to Cologne and the industrialized Ruhr Valley. In the greater scheme, Montgomery's troops were given the task of forging a Rhine crossing north of the Ruhr in February, and the Americans were given a supporting role. The 9th Armored was part of 12th Army Group, under Lieutenant General Courtney Hodges First Army—south of Field Marshal Bernard Montgomery's British 21st Army, and north of Major General George Patton's Third Army. Each of these were moving eastward towards Nazi Germany with enormous supply lines behind them. Bradley's 12th Army Group would support General Montgomery by capturing dams on the Röer River and then pinching the Germans into a trap west of the Rhine. Supporting the attack to the Rhine, the 9th Armored's job was to push across the Röer. However, the Germans countered by demolishing the Röer dams and flooding the valley. This made the Americans progress dangerous and slow. Month's earlier; the purpose of General Montgomery's Operation Market Garden had been to capture bridges over the Rhine River. 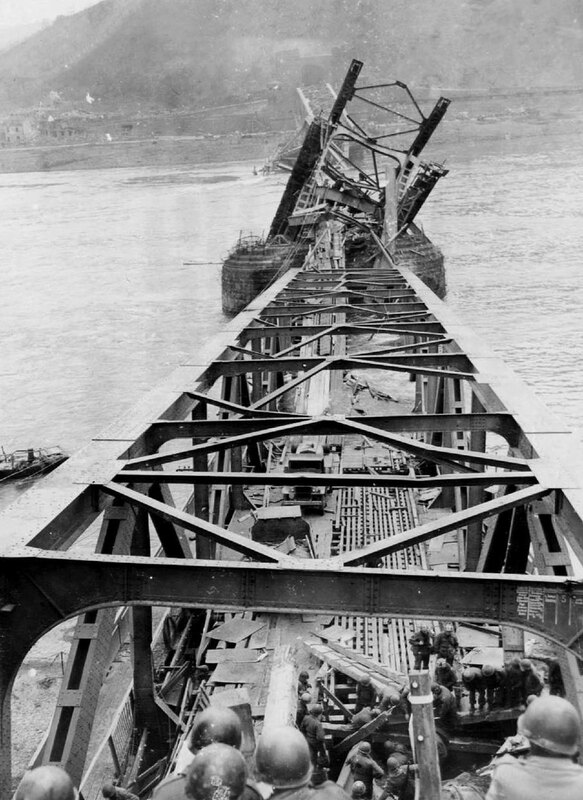 While some Allied commanders had given up any aspirations, a small contingent of Allied officials still held out hopes of capturing an intact bridge over the Rhine. It was in February of 1945 that General Milliken's III Corps, part of Hodge's Army Group, asked if there were any remaining bridges over the Rhine? Milliken was told there would be no bridges remaining intact by the time he reached the Rhine River. The Germans were demolishing them before they could be captured by Allied forces. Just as predicted, on March 2nd two Rhine bridges—one at Oberkassel, near Düsseldorf, and another just south of Uerdingen—went up in a cloud of smoke as the Americans approached. 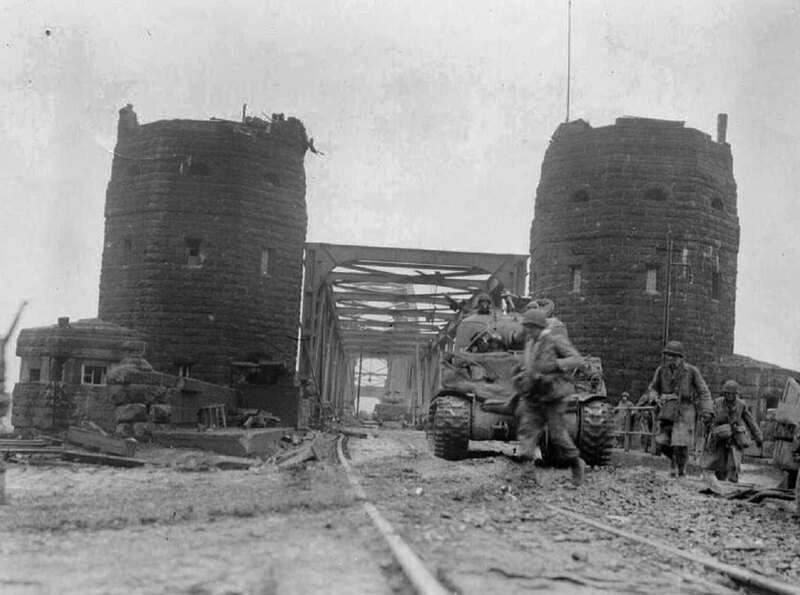 Two standing bridges over the Rhine were discovered—one at Bonn and another about 12 miles south at Remagen. Both bridges were in the zone of the III Corps. American commanders began planning a quick thrust in the hopes of capturing at least one of these spans intact. However, the Germans were fully aware of the American aspirations to capture a bridge. For the men in charge of the demolition the timing was sometimes precarious. With German troops in retreat, the bridges could not be blown too early as this would trap German forces on the wrong side of the river. The demolition could not be postponed too long, lest the Germans risked enemy capture of the bridge. The advance to the Röer started in difficult weather conditions. Allied divisions churned through the mud caused by the recent thawing snow. Before reaching the Röer, German engineers released reservoirs that turned the river into a rolling torrent.On February 28, 1945, Allied landing craft carried the first wave of troops across the Röer River. The first amphibious tanks and DUKWs came through the swift currents. The was the start of Operation GRENADE. Soon engineers had also built ponton bridges at various points. 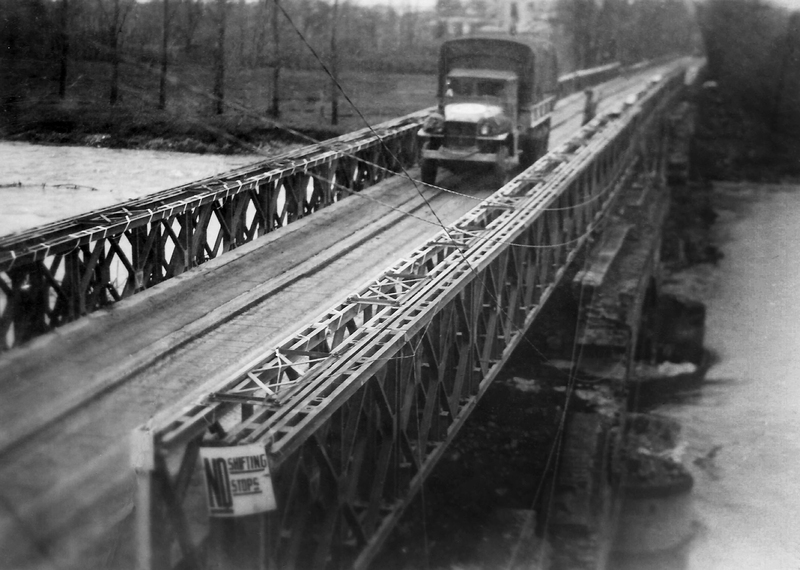 C Company of the 284th Engineer Combat Battalion put in a Bailey bridge in Kreuzau, Germany (over the Röer River), under artillery and small arms fire. This was the longest Bailey bridge in the ETO to date. It was 254-foot long, built on the crumpled arches from a previous bridge the Germans had destroyed. 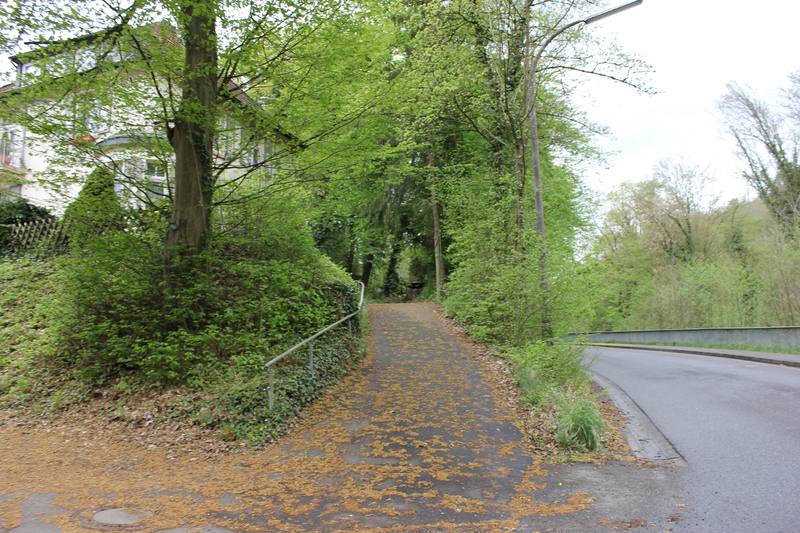 This is where the 9th Armored crossed and moved down the Rhine plain towards Remagen. Later on, 284th Engineer Combat Battalion would play an unwitting part in the story of the V-2 attacks on Remagen. 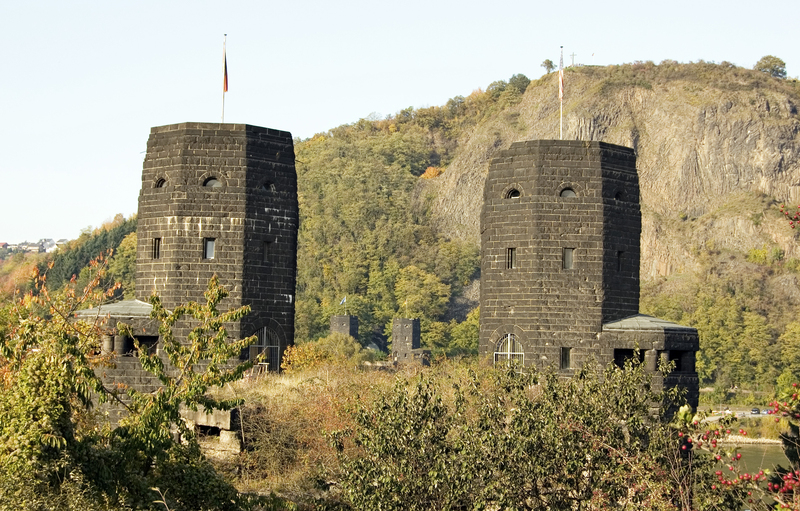 The Romans had first settled in Remagen some 2,000 years earlier. During its long history, the town was destroyed by invading armies many times. Troops from several nations had planted their flags in Remagen and each time town was rebuilt. 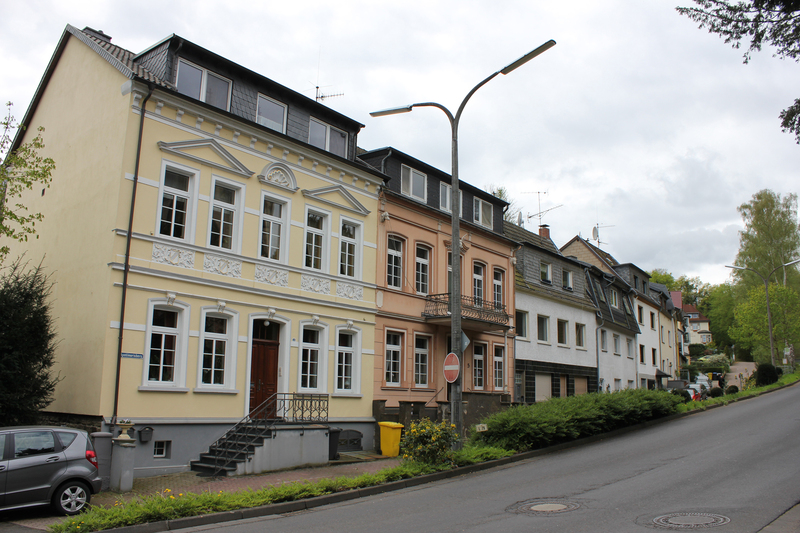 In 1945 Remagen was a community of approximately 5,000 inhabitants. 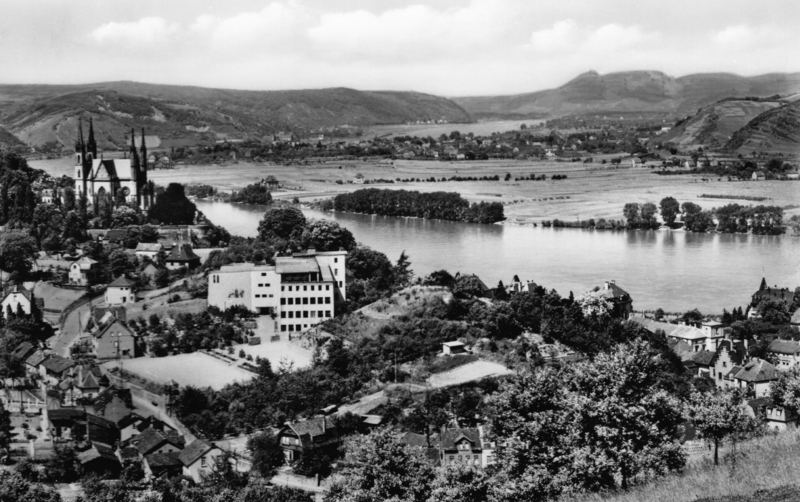 For many years the winding currents of the Rhine, the fine hotels and river-side restaurants had brought resort tourists to Remagen. 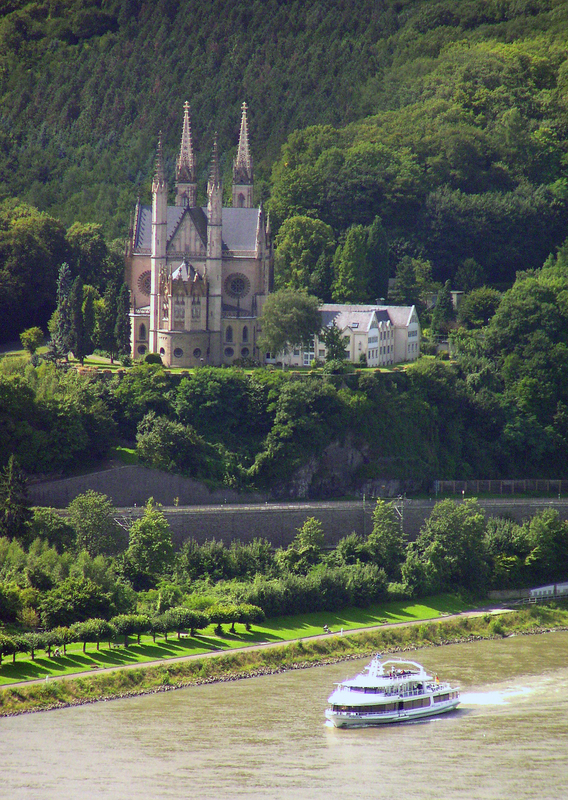 On the east bank a 600-foot cliff, known as the Erpeler Ley (named after the town of Erpel across from Remagen) juts skyward from the east bank, and provided scenic views for the tourists. 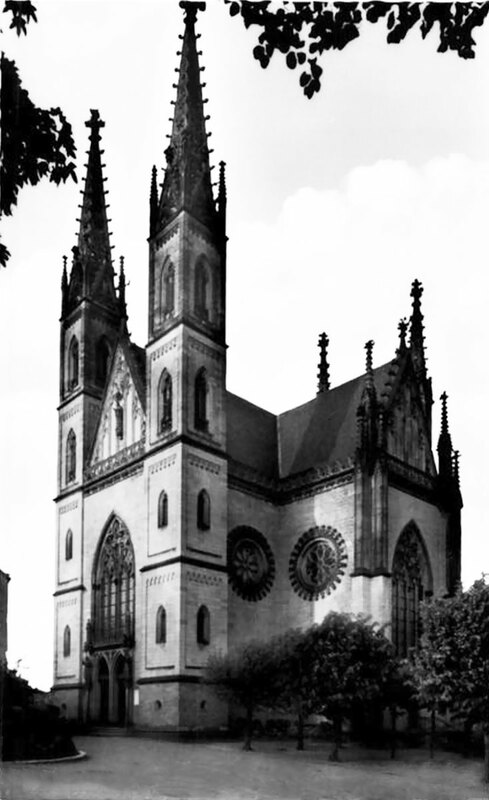 But for centuries the main attraction had been the majestic St. Apollinaris Church with its four spires, built on the ruins of the Roman fort during the middle ages. 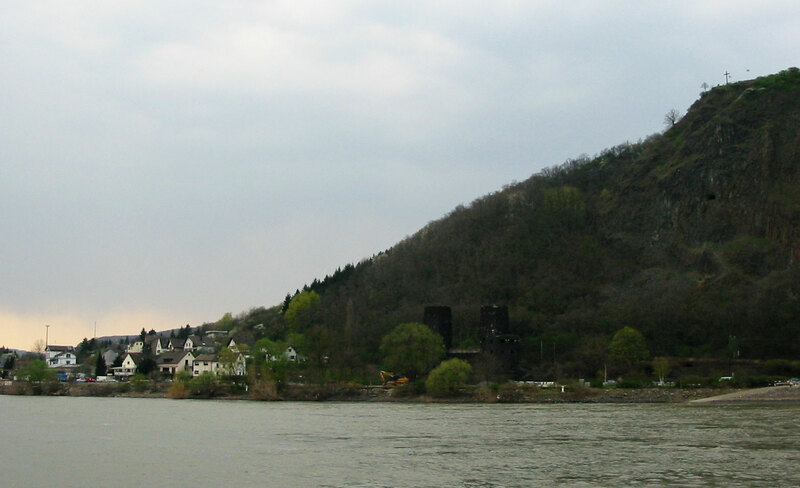 At Remagen the Rhine River is swift and about 300 yards wide. Upstream a bit (Rhine River flows south to north), a tributary, the Ahr, flows into the Rhine about one mile from Remagen. 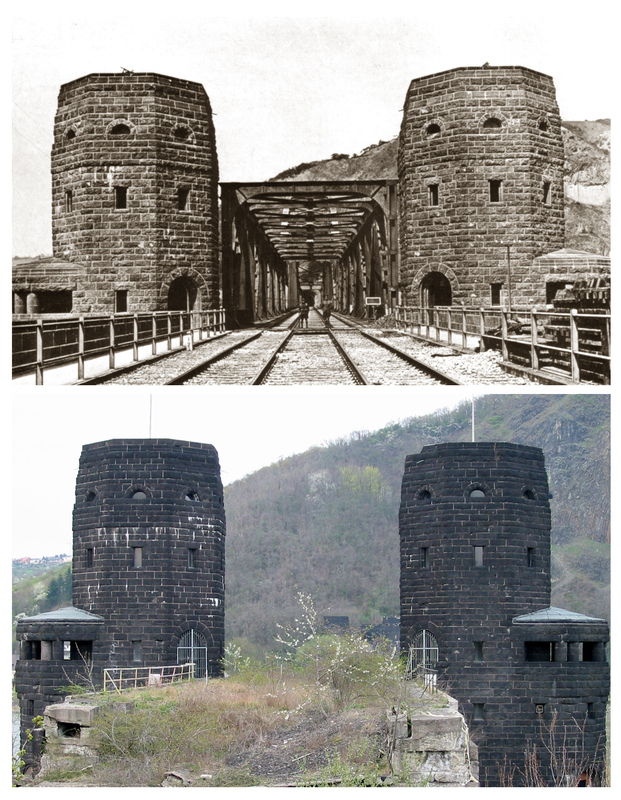 A railway bridge, down the western slope from the town—the Ludendorff Bridge—was the pride of Remagen's inhabitants. 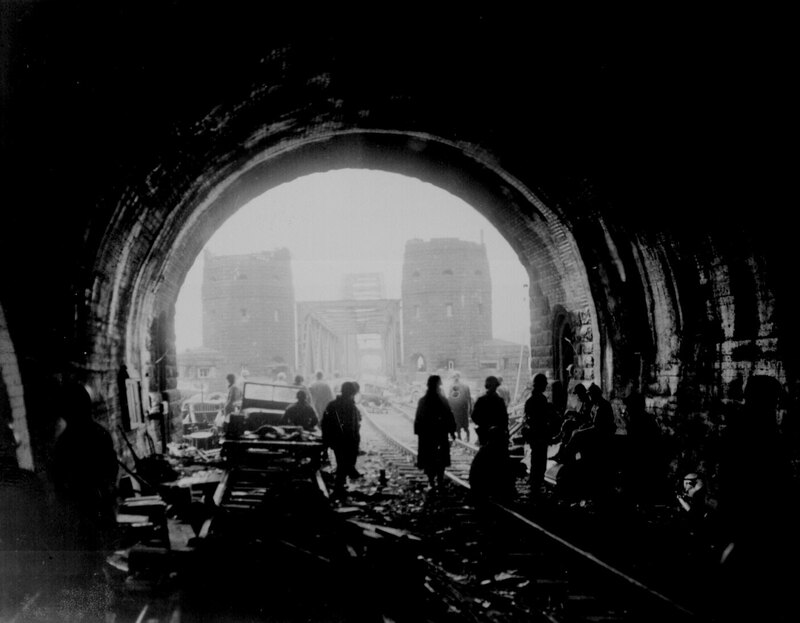 The bridge was one of three bridges built to improve railway traffic between Germany and France during World War I. Constructed between 1916 and 1919, the bridge consisted of two railway lines and pedestrian catwalks. Russian prisoners of war were used in the construction work. The bridge section had a total length of over 1,300 feet and it had two massive foothills on the left bank vault openings, each 100 feet in internal diameter. The main part of the bridge formed a 1,066-foot-long steel structure which consisted of the central two-hinged truss arch bridge, flanked on both sides by parallel anchor arms. The arch span was 511-foot-long with arms each measuring 278 feet. The highest point of the arch bridge was 93 feet above the water. 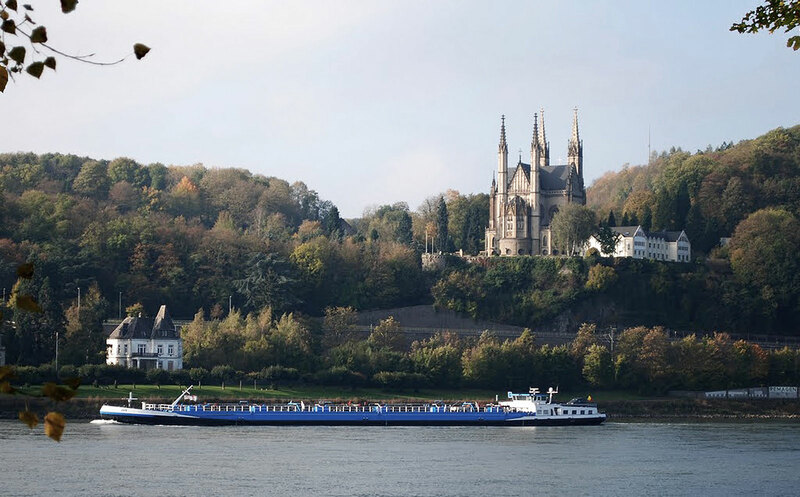 The height above the normal water level of the Rhine was 48 feet. It was named for the World War I German General Erich Ludendorff, one of the proponents of this bridge. 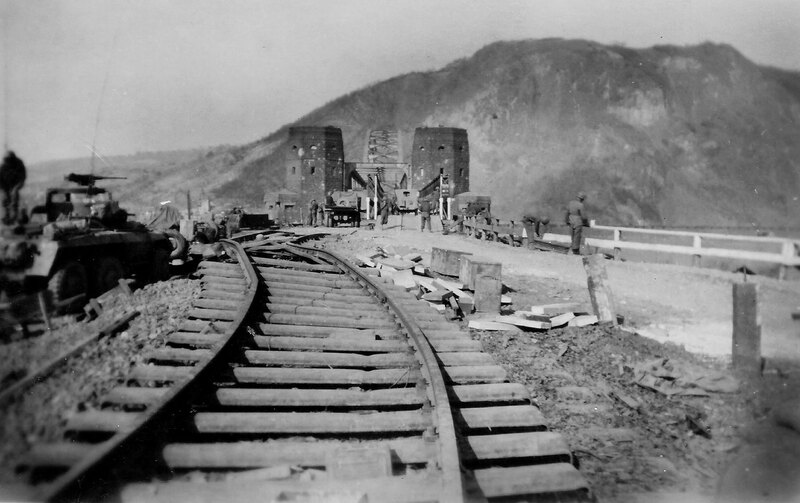 The Ludendorff Bridge was designed to connect the Right Rhine Railway, the Left Rhine Railway and the Ahr Valley Railway (Ahrtalbahn) to carry troops and supplies to the Western Front. The 4,640-ton structure cost about 2.1 million marks during World War I. Since the bridge was a major military construction project, both abutments of the bridge were provided with fortified foundations. These towers were equipped with loopholes for the bridge crew, storage, and accommodations for troops. From the flat roofs of the towers there was a wonderful view over the valley. During the design of the Ludendorff Bridge, the architect was ordered to accommodate the use of demolition methods, in case of eminent enemy capture. The two bridge piers were built as hollow shells, complete with demolition chambers. Explosives could be installed at the base of the piers in case it came under attack. Electrical circuits, protected by steel tubing, had been included so engineers would be able to detonate the bridge from the safety of the rail tunnel beneath the Erpeler Ley. After WWI, French authorities filled the demolition chambers with concrete. In 1938 German engineers took steps to prepare the bridge once again for an emergency demolition. Zinc-lined explosives containers were installed at key structural points, while ignition wiring was laid in steel tubing. In addition, primer cords that could be ignited by hand were installed as a backup. The bridge should be easily destroyed with minimal preparation. In the tunnel through the Erpeler Ley on the east bank, an electrical ignition for explosives had been installed. The control switch was located in the tunnel entrance, along with a primer cord backup. 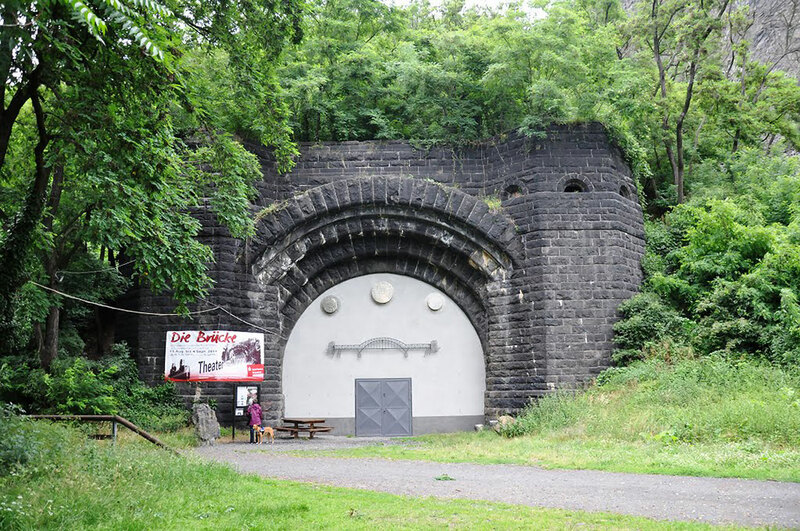 More charges had been installed under the approach road on the western side of the Rhine. A slow grade brought the railway traffic up to the bridge, to stone archways, the same height of the bridge on the west bank. Months earlier, it was American airpower that threatened the Ludendorff Bridge. In an attempt to stop the German retreat from France, the 9th US Air Force carried out a series of daylight bombing raids on the rail crossings at Düsseldorff, Cologne, Remagen, and Koblenz. 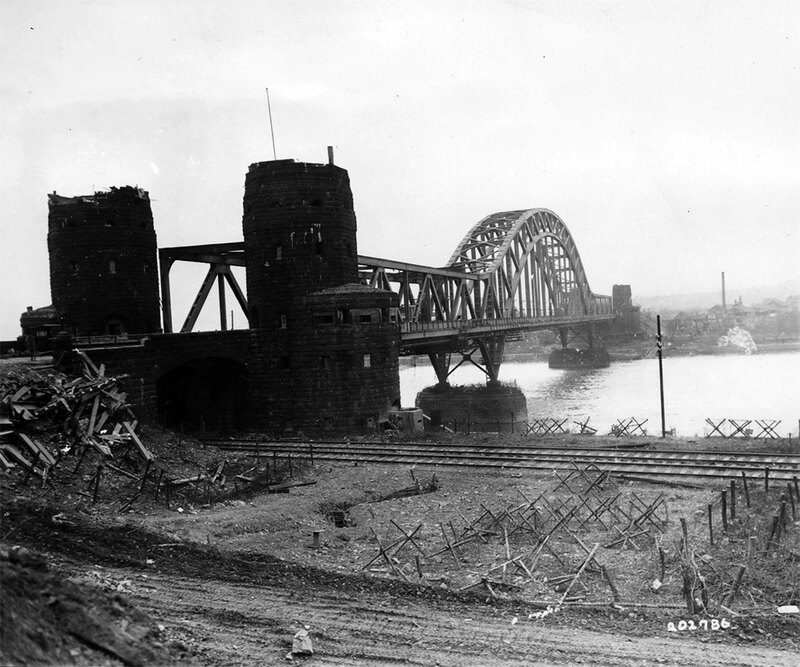 The Germans responded by deploying engineering units to maintain and repair the bridges along the Rhine. On October 19, 1944, the Ludendorff Bridge suffered damage from one of these raids, but was reopened two weeks later. Although the bridges were hard to hit, the towns nearby suffered greatly from the bombings. During the winter of 1944-45 there were over sixty residents killed in Remagen. 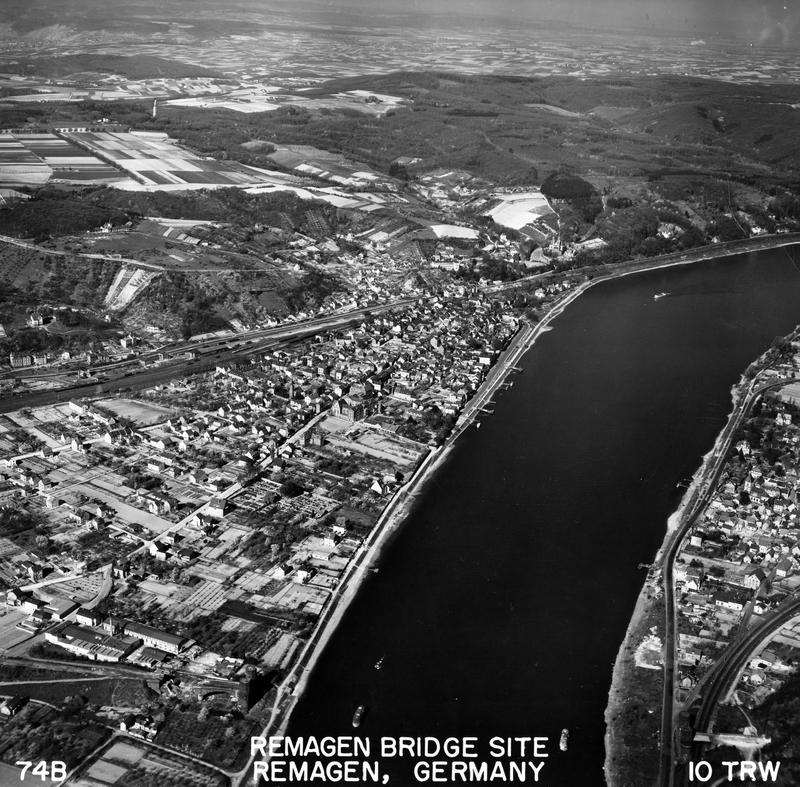 There were several men defending Remagen whose names would forever be linked to the story of the Bridge at Remagen. Captain Karl Friesenhahn was the German engineer in charge of the small group of men whose job it was to destroy the Ludendorff Bridge at the precise moment to prevent its capture. Captain Willi Bratge, a decorated German officer, was the military commander in charge of defense of the bridge. At his disposal was one company of the German 80th Infantry Replacement and Training Battalion. The men under Captain Bratge were convalescing soldiers. Over the winter months Captain Bratge managed to build a series of outposts along the Victoriasberg heights west of the town. He also set up a guardroom in the Waldberg Hotel overlooking Remagen. 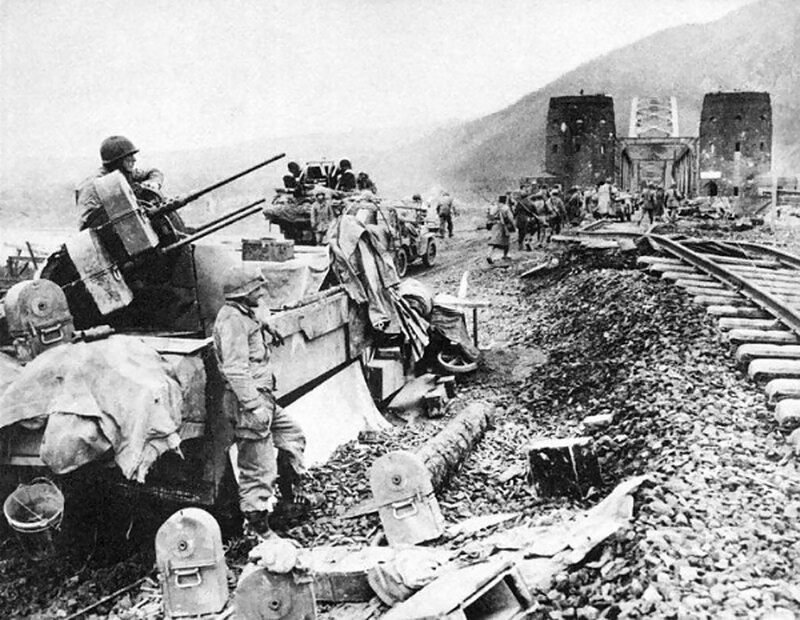 Flak units were deployed on the heights to defend the bridge, along with 1/535th Heavy Railway Detachment. 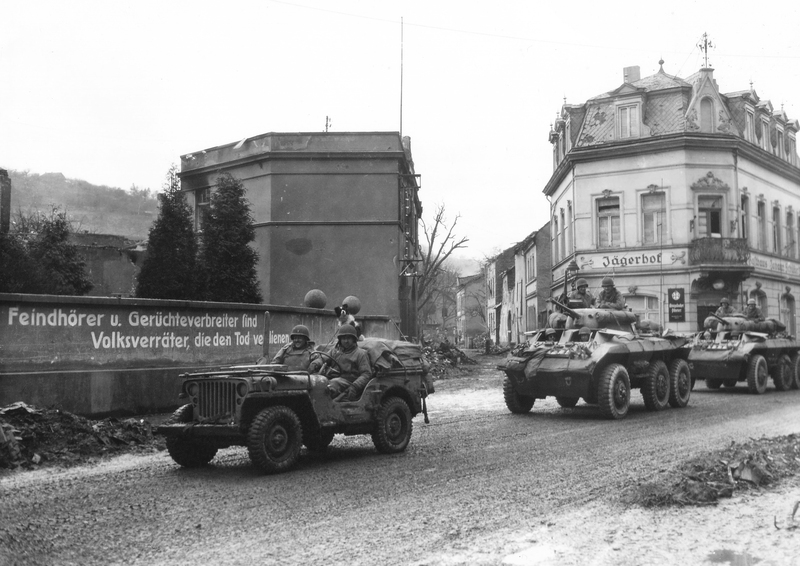 As the winter ground begin to thaw, the people of Remagen noticed increased military activity in the area. They knew soon the battle would come to their homes. 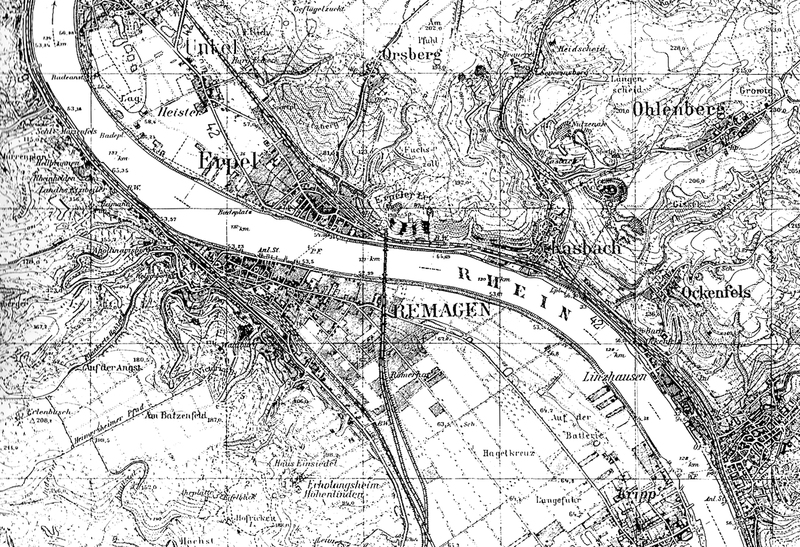 At the end of February Bratge was informed that they would, in future, report to Lieutenant General Botsch of the Field Army, the new commandant for the stretch of the Rhine between Bonn and Remagen. Fifth Panzer Army’s take over from XII Army Corps was further complicated by a reorganization of the front line. 9th Armored was now part of Combat Command B under III Corps, supporting the infantry as they advanced towards the Rhine. The "combat command" was a flexible organization that did not have dedicated battalions. Instead, tank, armored infantry, and armored field artillery battalions, as well as smaller units of tank destroyers, engineers, and mechanized cavalry were assigned as needed in order to accomplish any given mission. Brigadier-General William M Hoge ordered his troops to split into three armoured columns and managed to establish a bridgehead across the Neffel River, battling German rearguards along the way. The columns managed to reach Neiderberg on March 2, and captured a bridge in the center of the town. 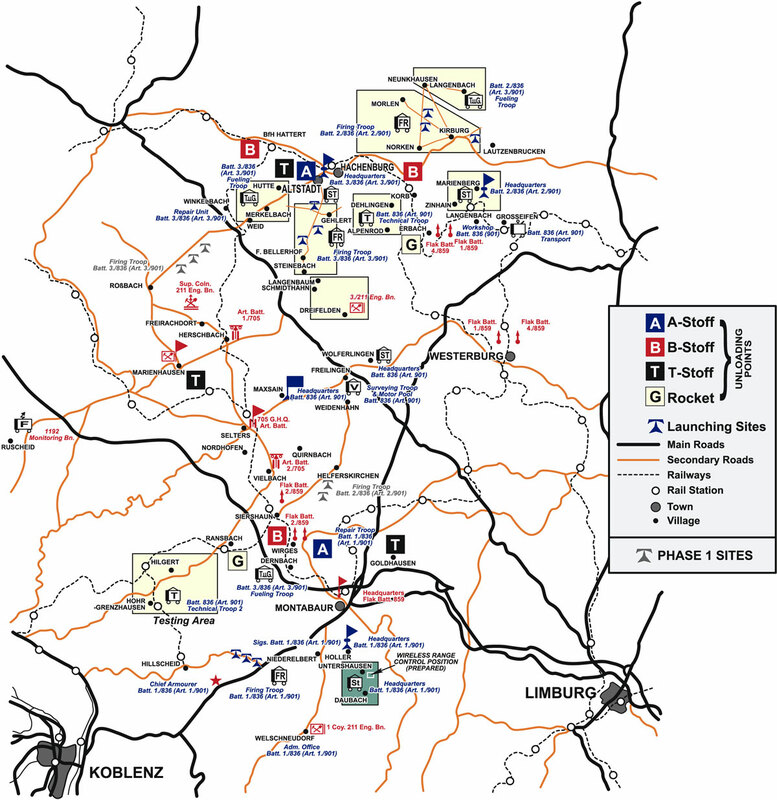 Turning south, Combat Command B went through Bodenheim and managed to cross the Erft and take Wuscheid and Grossebullesheim easily. The Germans were in retreat as 52nd Armored Infantry Battalion joined Combat Command B ready for the final stage of the advance to the Rhine. German General von Botsch traveled to the Rhineland to inspect the troops in early March. He discovered in Remagen that Captain Bratge had only thirty-six men, along with a handful of engineers and AA gun crews, to defend the bridge. Bratge would need more men. On March 5, 1945, von Botsch promised to send a battalion of men to assist Bratge. 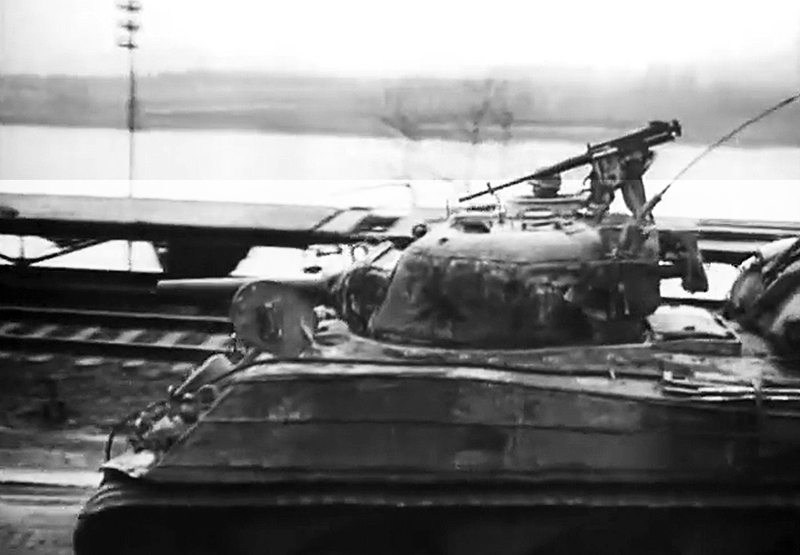 However, on March 6, the 9th Armored was already just eight miles from the Rhine. 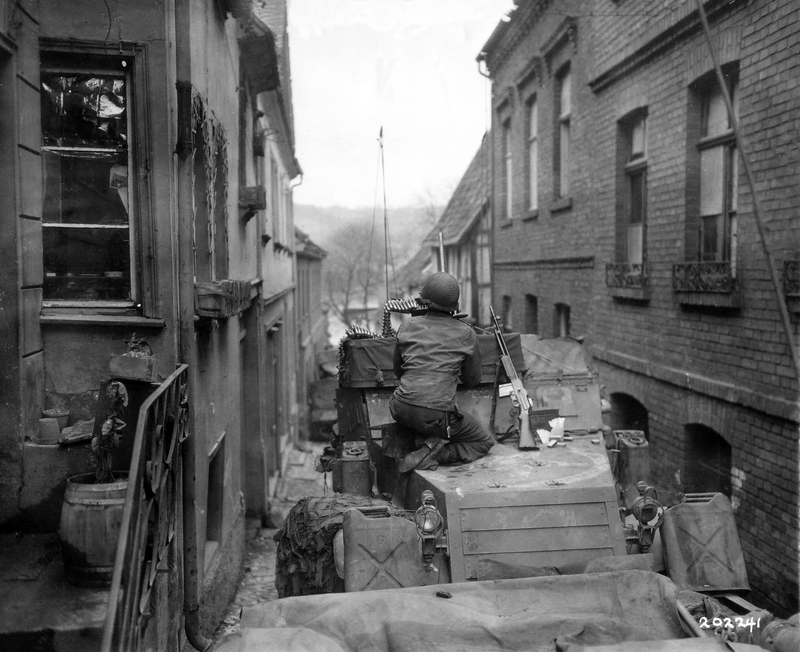 Combat Command B advanced through the town of Esch as the 27th Armored Infantry Battalion advanced towards Morenhoven. As Combat Command B entered Flerzheim they saw white flags hanging from the windows as found the German troops had fled. Ahead lay the town of Stadt Meckenheim. 27th Armored Infantry Battalion came under fire as it entered the town, but resistance quickly came to an end. Brigadier-General Hoge set up his headquarters in the town. Stadt Meckenheim had been devastated by Allied bombing attacks. Engineers had a big job to clear the streets of rubble to make way for the vehicles to pass. 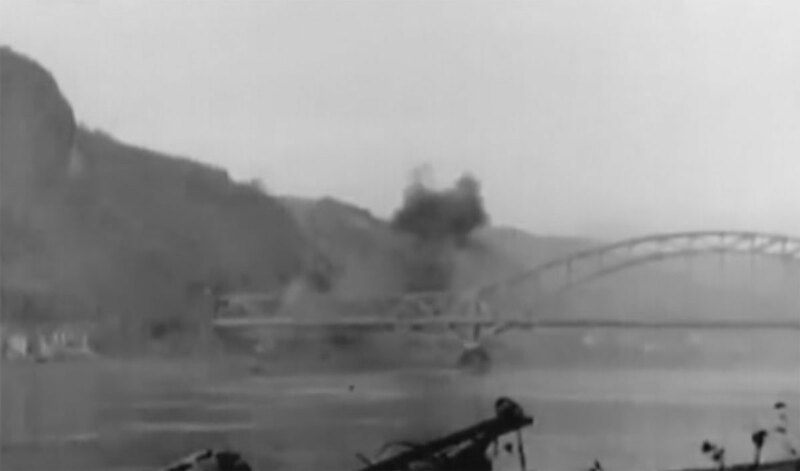 Meanwhile, in Remagen, German troops were streaming over the Ludendorff Bridge to escape the American spearheads. The next morning, March 7, Hoge decided to split his command into two task forces, each one comprising of a mix of tanks and infantry mounted in halftracks. Because of the light resistance the tanks could expect to reach the Rhine River by afternoon. Armored cars of the 89th Reconnaissance would scout the roads ahead. Whenever a German rearguard was located, the poorly equipped enemy usually surrendered with little resistance. Combat Command B had two objectives. 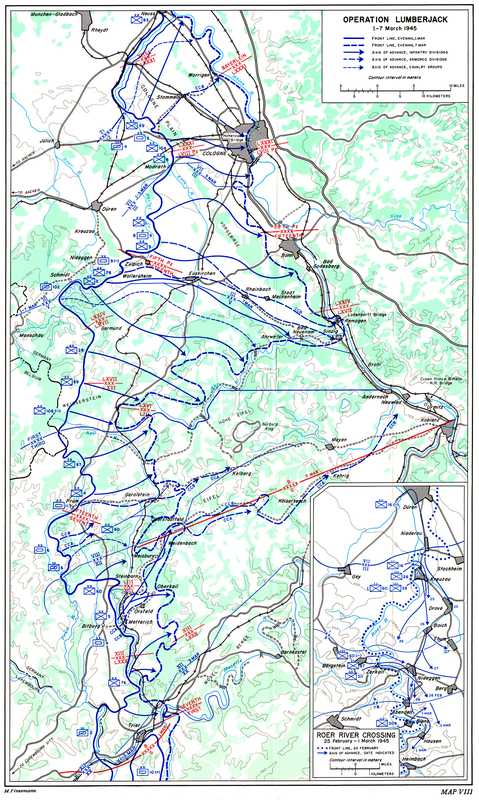 Moving southeast, they should capture the crossings over the River Ahr at Bodendorf and Sinzig. The Division would then be able to continue to push south along the Rhine towards Seventh Army. 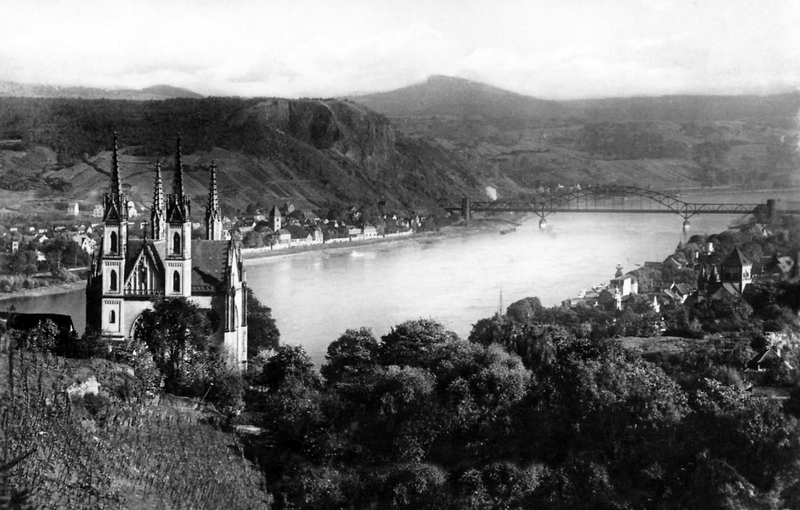 The next objective objective was to clear the west bank of the Rhine near Remagen. No one really believed the bridge would actually be standing much longer, so the orders didn’t even mention a bridge as the objective. In the early hours of March 7, 1945, a portion of 9th Armored's forces, the 60th Armored Infantry Battalion, was on the move. Under the command of Lieutenant-Colonel Collins, three groups, each containing a rifle company and a tank platoon, drove quickly through the night in the hope of cutting off thousands of German troops heading for the Rhine. The columns soon passed through Altendorf and Gelsdorf where they encountered hundreds of Germans. Collins ordered his men to keep moving and let the rear echelon units round the prisoners up. The Germans were taken completely by surprise. Soon the tanks and halftracks moved through Vettelhovgen and Bolingen, towards Lantershofen, reaching the objective at 2:00 AM. They would stop here while the rest of the division completed its advance to the Rhine. In Remagen, as the Americans approached, Hauptmann Bratge was greatly concerned. German soldiers had continued to cross the bridge to the east bank for several days. There was talk of American forces close behind. The reinforcements promised by General Botsch had not arrived and there was no organized opposition on the west bank. Unbeknownst to Bratge, Botsch had been transferred to command LIII Corps earlier that day without having the chance to brief his successor, Major General Richard von Bothmer. Soon Bratge ordered thirty-six men onto the Victoriasberg Heights to watch for signs of American troops. Early on March 7 the German Fifteenth Army informed LXVII Corps that it had been given direct responsibility for the bridge. General Hitzfeld was told that he must send a staff officer to establish a bridgehead. Major Scheller, Hitzfeld’s adjutant-general, was instructed to take command of the troops already there, picking up any straggler troops heading towards the river. He was also appointed to take overall command, organize the defenses, and if necessary, personally supervise the destruction of the bridge—with no knowledge of the bridge, its demolition systems or defenses. Major Scheller, accompanied by Captain Vasel and one other, drove off into the night at 3:00 AM. The 40-mile journey would take more than eight hours as they navigated the crowded roads. Back in Meckenheim, Brigadier-General Hoge called together his officers. 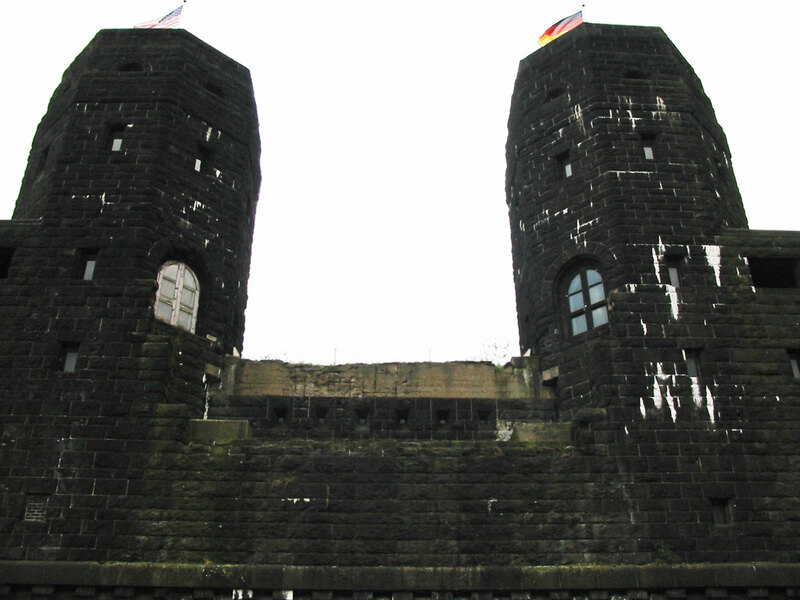 With the knowledge that most of the retreating Germans would be heading for the bridge at Remagen, Hoge sent out two spearheads; the northern column, commanded by Colonel Leonard Engeman of the 14th Tank Battalion, would head east, bypassing Birresdorf, before entering the woods covering Scheidskopf, one of the hills overlooking the Rhine. The left flank of the column would be covered by the 1st Battalion of the 310th Infantry Regiment. The final objective would be town of Remagen. Lieutenant Karl Timmermann was called to a meeting at 14th Tank Battalion headquarters. Company commanders were informed by Lieutenant Colonel Leonard Engeman of the imminent push to Remagen and the Rhine. Timmermann’s company halftracks would be heading up the advance accompanied by a platoon of new powerful M26 Pershing tanks. The 52nd Armored Infantry Battalion, under the command of Lieutenant-Colonel William M Prince, would lead the southern column. Tasked with securing bridgeheads over the Ahr River at Westum and Sinzig, the 52nd moved out shortly after 7:00 AM. Because of heavy rubble in the roads from the bombardment, the planned route had to be altered with Prince’s column re-routed south via Gelsdorf and Eckendorf, and then rejoining its prescribed route at Fritzdorf. However, Engeman's 14th Tank Battalion was forced to wait while engineers had cleared the road to Adendorf of rubble. Both columns progressed at a steady pace making good time. As they approached each town with care, they were happy to find no signs of German rearguards. Each village and town was entered with no opposition. 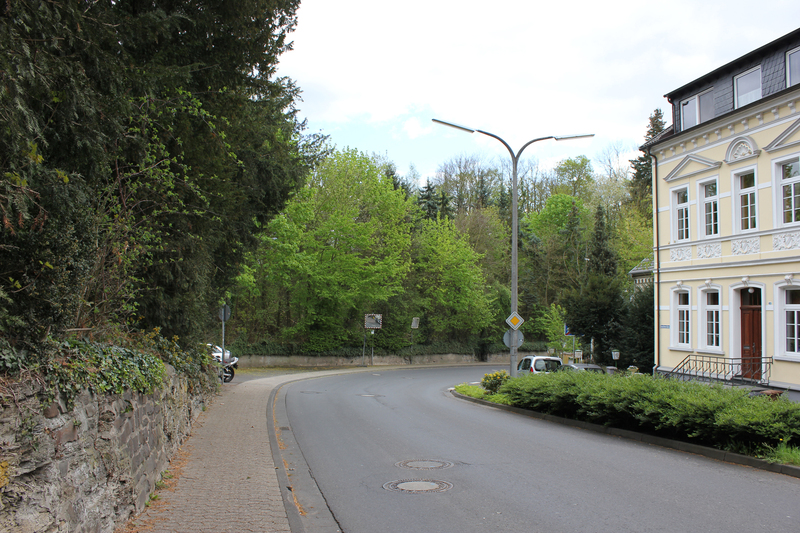 By the time the 52nd Armored column reached Fritzdorf, the recce element was able to begin scouting ahead. By 9:00 AM the column had reached Oeverich and then Kirchdaun, where some of the lead vehicles became stuck in the mud. Lieutenant-Colonel Prince decided to reroute the rest of the column through Gimmingen to the south. Resistance came from Germans in the local church tower, but was soon silenced. 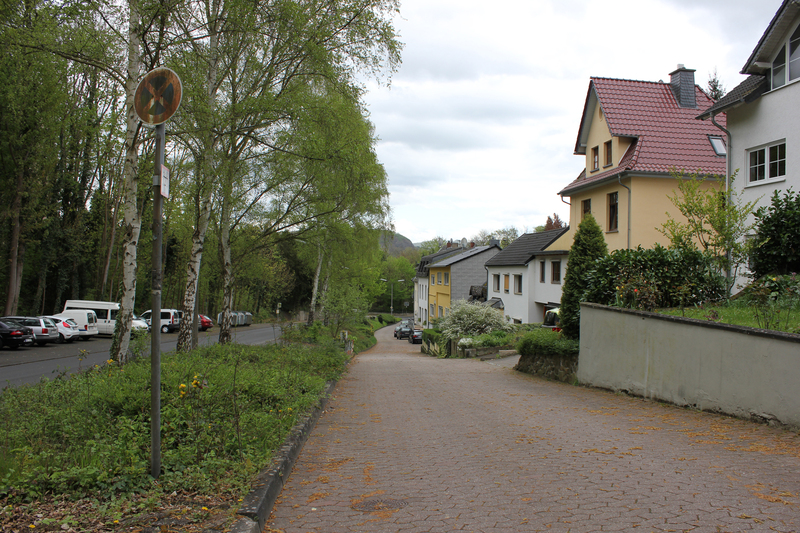 The 52nd continued through Heppingen, Bodendorf, and towards Sinzig. 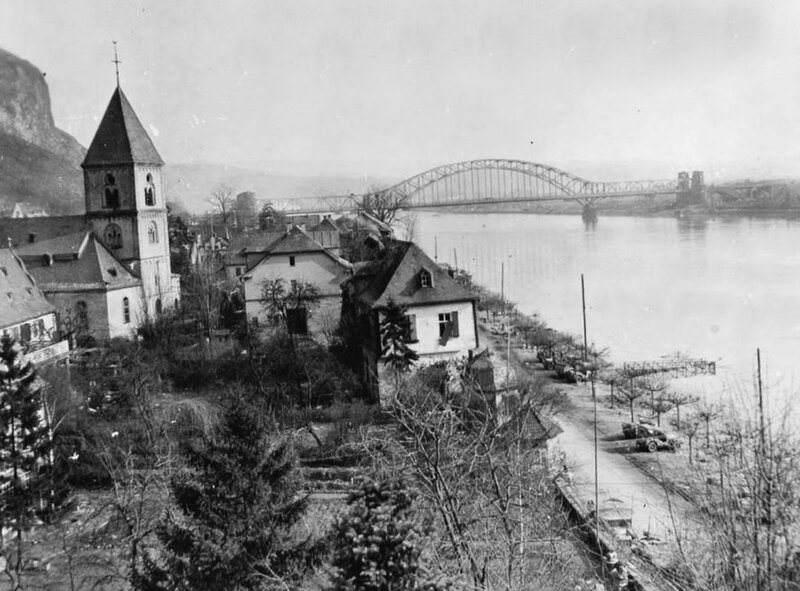 It was in Sinzig that the 52nd Armored captured a bridge over the River Ahr. As the columns approached the town they were met with enemy fire from prepared emplacements. The 75mm guns of the Sherman tanks took care of this and the American halftracks and infantry pushed into town. 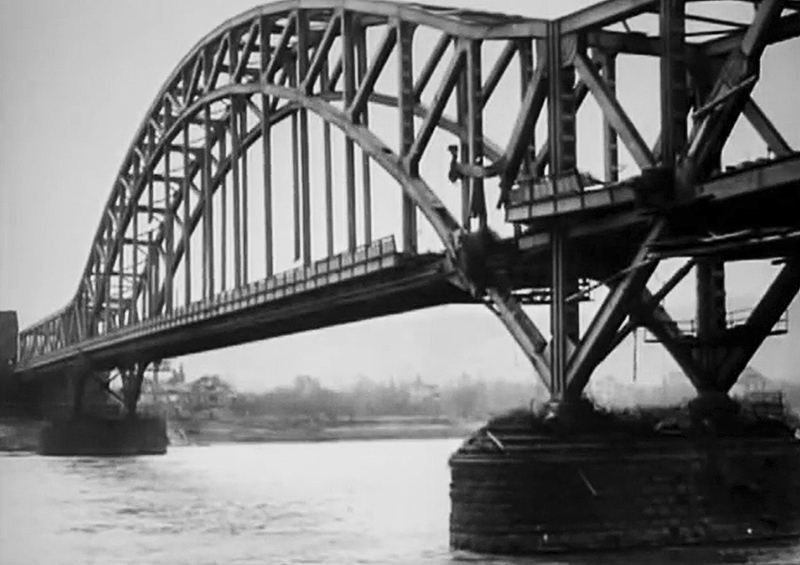 German engineers attempted to blow the bridge, but the demolition charges failed. The Americans were quickly over the bridge and captured the town. By 1:00 PM Lieutenant-Colonel Prince's columns had taken all of their objectives. He reported 75 enemy killed and close to 400 captured. Under a drizzly gray morning sky, Timmermann’s advance had started at 7:00 AM. Making their way through roadblocks and ambushes, the force drove through one village after another, each town decorated with the white linen of surrender from windows. Later that afternoon Timmermann’s jeep emerged from a forest road onto a curve and ahead and below of him was the Rhine wine valley. 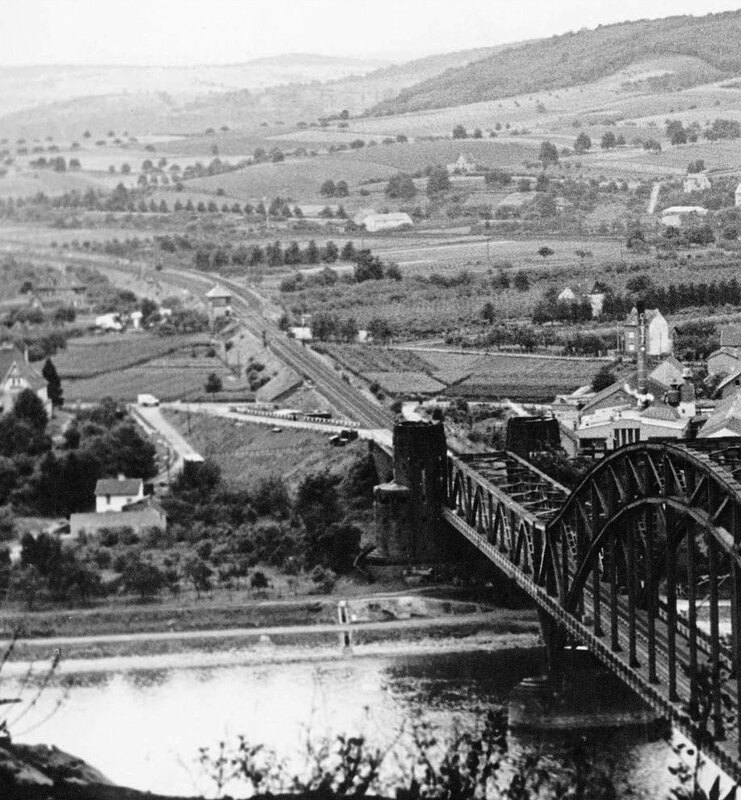 He also saw the incredible sight of the Ludendorff Bridge, still standing. 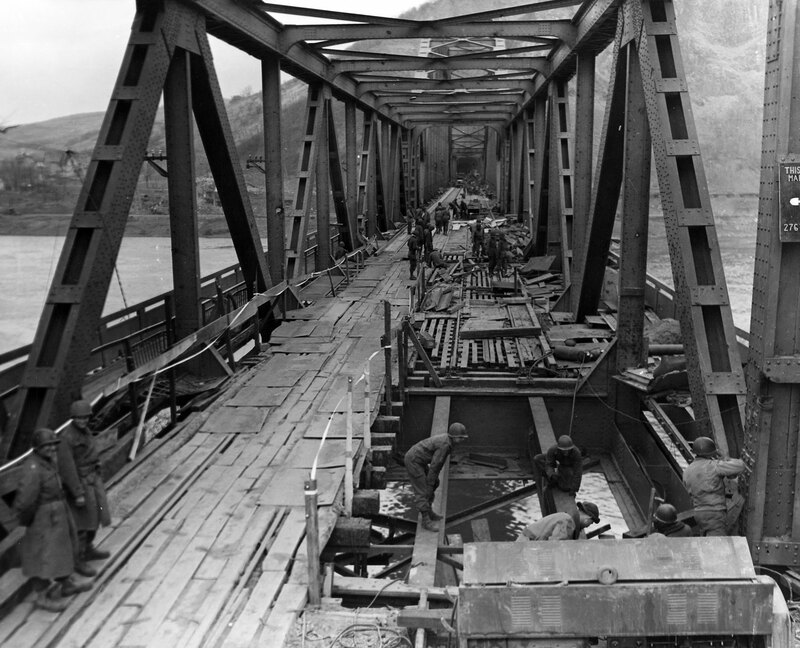 A few days before the Americans reached Remagen, German troops had been hurriedly laying wooded planks between the railway ties on the bridge to form a smooth roadbed for motor vehicles to cross. 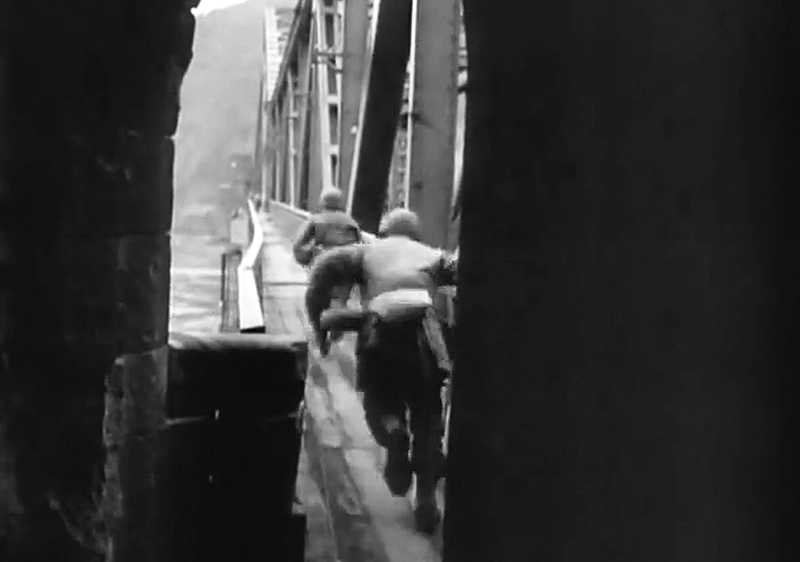 Remagen's streets were clogged with what was left of the German motorized army, all fleeing over the bridge. On the morning of March 7, Captain Bratge was on the western approaches of the bridge attempting to sort out all of the traffic congestion. He really should have been tending to matters of defense of the town. The Americans were only a few miles away. 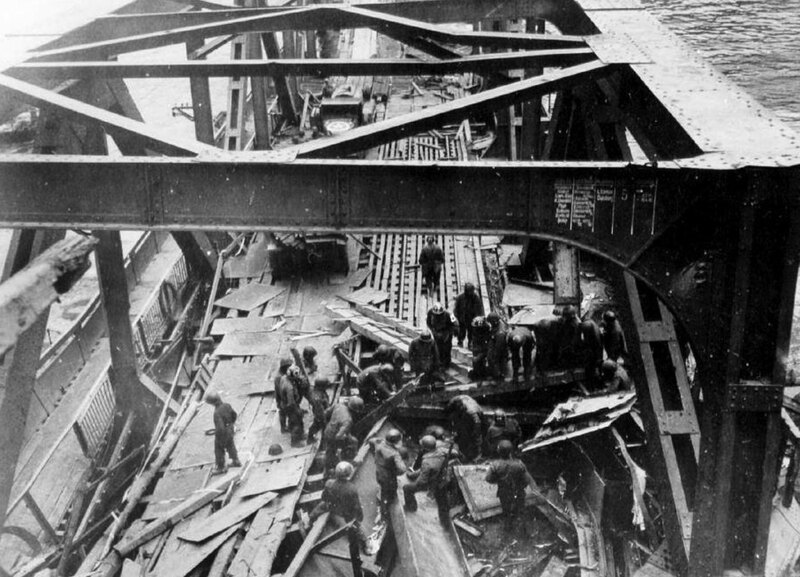 While the fleeing traffic hummed over the bridge, the German engineers under Karl Friesenhahn were on the bridge finalizing the placement of demolition charges and checking the electric circuits. Mines and barbwire were in place. A large explosive charge was installed under the arch supports of the rise on the western approach to the bridge. It was hoped that this would, at least temporarily, slow down American vehicles and armor. With the sounds of guns and shellfire getting closer, Major Hans Scheller arrived on this scene around 11:00 AM. He found Captain Bratge still directing traffic. He immediately informed Bratge of his orders to assume command of combat troops. Bratge was at first relieved, because he thought this was the long-awaited assistance Remagen had been waiting for. But his hopes were dashed when Scheller informed him there were no reinforcements coming. Smashing their way through half-hearted resistance, the Americans were only a few miles from the bridge. At the front of the advance, Timmermann could see through his binoculars the bridge cluttered with soldiers, civilians, vehicles and even livestock. Timmermann sent a runner off to Col. Engeman with a request for tanks and artillery, but the request was turned down. Instead, the battalion was ordered to keep moving forward in attack. 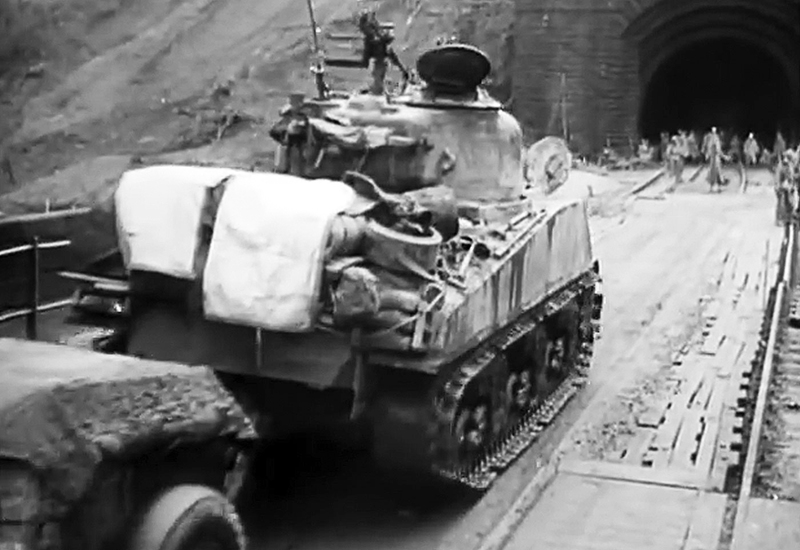 Coming down through the hills over-looking the northwest of Remagen, Timmermann’s company and a handful of tanks steered their way cautiously through the narrow streets of the old city. The infantry cleaned out the town in 2 hours. As the Americans approached the western side of the bridge, a deafening explosion sent earth and rocks skyward. Captain Friesenhahn had just set off his first charge that took out a 30-foot section of the stone archway that connected the approach embankment with the steel bridge. Through his binoculars, Timmermann could see the German engineers scurrying about making final preparations to bring the bridge down. The Americans moved on up, so as to have a good view of the pyrotechnics show. Just then, orders came down on the radio from General Hodges to take the bridge. Hoge had a report from captured German soldiers that stated the bridge was to be blown up at 4:00 PM. Hoge informed Engeman to speed up attack, it was then about 3:30 PM. At the same time, Captain Friesenhahn was making final adjustments and could blow the bridge at any moment. The battalion commander asked Timmermann, "Do you think you can get your company across that bridge?" Timmermann responded, "Well, we can try. What if the bridge blows up in my face?" The battalion commander didn't answer, he just walked away. When Friesenhahn blasted the approaches, it was a sign to Captain Bratge that the Americans were close to crossing the bridge. When Friesenhahn made it back to Bratge, and reported the Americans were at the steps of entering the bridge, Bratge said, "Blow up bridge now!" Friesenhahn said, "I cannot, only Major Scheller can give the order!" At that moment, Major Scheller was on the other end of the Erpeler Ley tunnel, more than 1,000 feet away from Bratge. Bratge dashed off and ran to the other end of the tunnel where he told Scheller, "If you don't give the order to blast the bridge, I will do so myself!" Scheller quickly replied, "Then go ahead and blast the bridge." Minutes past before Bratge could run back to within earshot of Friesenhahn. He yelled out to him, "Friesenhahn, blow the bridge!" 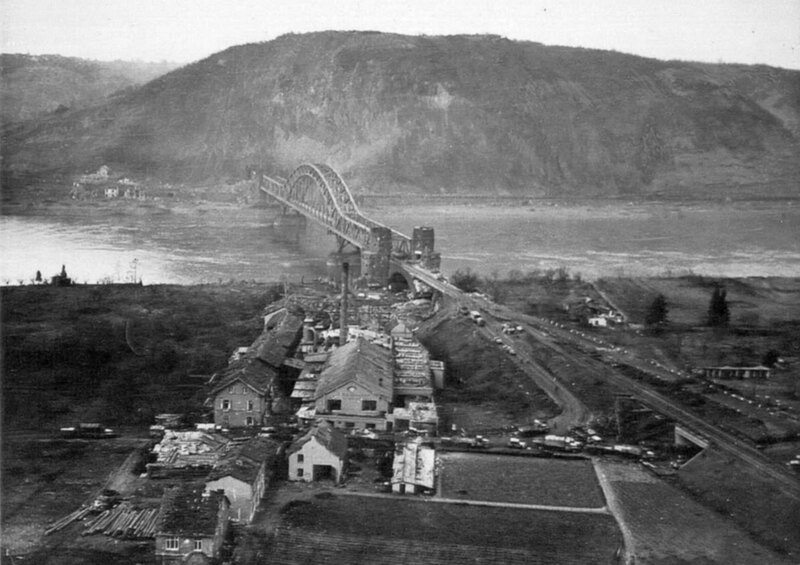 Photos below: Views of Remagen and the Ludendorff Bridge in March of 1945. Gen. Hoge made decisive decision to take the bridge. From the west bank the available tanks and artillery began shelling the entrance to the Erpeler Lay railway tunnel on the opposite side. Timmermann shouted to his men, “Alright, we’re going across!” His men, although leery of their suicide mission, rose to their feet and moved forward. Friesenhahn could see the American soldiers approaching. Friesenhahn shouts, "Full cover, full cover!" Everybody in the tunnel lies down on the ground in order to escape the tremendous blast that is about to occur. On Major Scheller’s order, he took hold of the firing mechanism, made last connections, and twisted the handle. Instead of an explosion, the bridge sat motionless; there was nothing—nothing except the sounds of American shells bursting around the tunnel entrance. Maybe shellfire broke the connections? Whatever it was that caused the demolition failure, there was no time to investigate. While in the tunnel several hundred German soldiers and civilians huddled in fear, Friesenhahn had one of his men run out and light the primer cord fuse. This was possible because of the haze caused by smoke shells sent over by the Americans to blind the Germans during the bridge assault. A few seconds more, then a tremendous explosion shook area. The Americans witnessed the bridge rise into the air from the piers. Timmermann and his men were only seconds away from assaulting the bridge when this detonation occurred. Seconds later, after the smoke dissipated, witnesses on both sides of the river were shocked to see the bridge still standing. The charges had blown large holes on the roadbed planking on the bridge and twisted some of the girders at the pier connections. Timmermann looked down the 1,000-foot length of the bridge and noticed the pedestrian catwalks on each side were still in place. He could also see German engineers running about, presumably preparing a second blast. Just as Company A started towards the bridge again, machine gun fire from one of the stone towers on the west bank pinned them down. American tanks close by quickly obliterated that threat. Timmermann and his company rushed onto the bridge. A platoon of Pershing tanks provided cover against German machine gun fire coming from towers on the east end of the bridge, the infantrymen rushed forward, zigzagging from girder to girder. 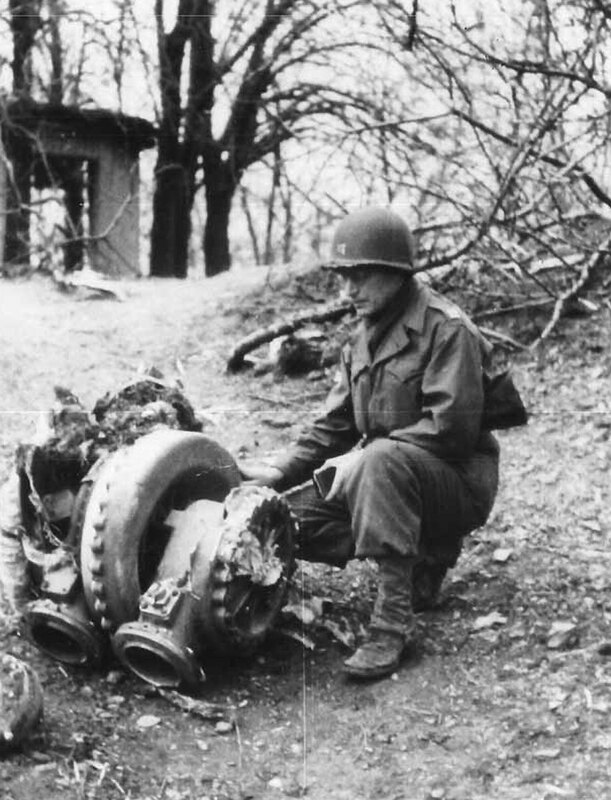 They were joined by American engineers from 2nd Platoon, Company B, 9th Armored Engineer Battalion (Lieutenant Hugh Mott, Staff Sergeant John Reynolds, and Sergeant Eugene Dorland) who were locating and severing the wires to additional unexploded charges. All the while, small arms fire from the Germans was glancing off the girders around them. 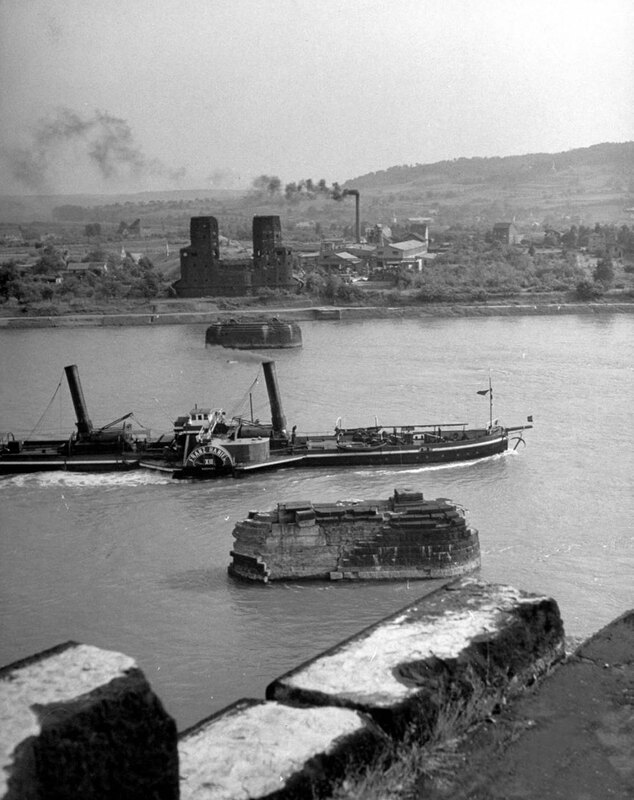 American tanks on the west bank opened up on a German barge that was submerged about 200 yards up river off the east bank. Shells quickly silenced the sniper fire coming from the barge. However, the American assault of the bridge had bogged down. A portion of the catwalk had been severed on the upstream side, at the east bank pier, where the bridge demolitions had exploded. The men were very apprehensive of moving forward with lack of cover, all bunched together. One of Timmermann's platoon leaders, Sergeant Joe DeLisio, got moving. Gallantly, DeLisio ran forward in the hail of bullets. Screaming orders, Timmermann followed after him, which prompted the others to keep moving too. Bratge again ran back through the tunnel to Scheller to report the failure of the detonation, but soon calls for Bratge beckon him. He runs again through the huddled masses of men, women, and children, and as he arrives Friesenhahn yells, "Americans on the bridge!" Bratge calls out, "Counterattack! We must throw them back, there can't be many of them!" The shell fire at the entrance to the tunnel prevents this. Bratge looks for more men, any soldiers in the tunnel. Bratge wonders why Major Scheller's Lieutenants are not coming forward to help in the fight?" He soon discovers that Scheller and the two lieutenants have fled the area from the opposite end of the tunnel. Across the bridge, DeLisio made it to the base of one of the stone towers on the east bank. He kicked in the door and ran up the stairs, surprising three Germans huddled around a jammed machine gun. They immediately surrendered and DeLisio threw the machine gun from the window of the tower. Seeing this, the other men rushed the second tower and secured it too. Bratge intended to get all available men out of the tunnel and gather together near Osberg and launch a counterattack. But as they started to leave the tunnel on the far side of Erpeler Ley, gun fire and hand grenades met them. The Americans had crossed over the mountain and found the tunnel exit of the other side. Bratge can hardly believe the Americans crossed the mountain so fast. The Americans were now across the Rhine. Sergeant Alexander A. Drabik of Holland, Ohio, was the first American soldier to cross this bridge. The infantry formed a defensive perimeter while the engineers continued cutting wires and disabling charges. Timmermann and DeLisio concentrated on clearing out any threat still remaining from within the railway tunnel. Making their way from the bridge to the tunnel entrance, and then further inside, they made their way cautiously in the dark to the bend. DeLisio and his men can hear German voices not far away. They threw a few hand grenades and fired a few bursts. Soon a stream of German soldiers and civilians, hoisted a white flag, and exited the tunnel. 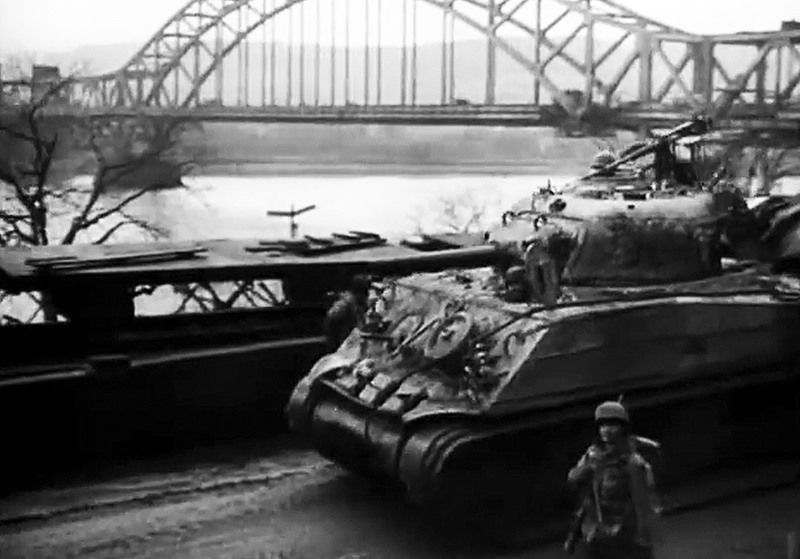 Later that evening, when word of the bridge's capture reach Allied commanders, the US First Army began funneling all available troops towards Remagen. Motorized regiments from the 9th and 78th Infantry Divisions, joined by a number of other units, were routed to the bridge crossing. The Americans were going to secure their hold on the bridge as soon as possible. After engineers had erected a Bailey bridge spanning the section of the blown approaches on the west side of the bridge, a platoon of tanks and tank destroyers were sent over. However, by midnight, only 5 tanks had made it across, this was because one of the tank destroyers had fallen through a hole in the planking. At 03:00 hrs it was pushed through the bridge into the river and vehicles began to cross again. As soon as the news came that the Americans were over the Rhine, Hitler ordered the immediate destruction of the bridge using any and all means possible. German counterattacks that night were fierce. Reserves were brought up to at least try and destroy the bridge. The American tank crews, in some cases, were throwing hand grenades from their hatches as the German infantry were right on top of them. Their orders were to hold their ground—even if their tanks were shot out from under them. By daybreak the counterattacks were beaten back. Even so, on March 8, the Germans attacked with two (under-strength) panzer divisions. The 9th and 11th Panzer Divisions hurried to engage the American 9th Division—the objective being to push the Americans back across the Rhine and destroy the bridge. These efforts were stopped by the units of the 9th and 47th Infantry Regiments. Nearly 1,000 troops, along with tanks and artillery, had crossed the bridge by nightfall. Company A of the 14th Tank Battalion, using the new 90mm guns of the M26 Pershing tanks, had the range needed to take on the counterattacking German armor on the east bank. That same day ten Luftwaffe aircraft, including eight Ju-88 Stuka dive-bombers, attacked the bridge, scoring two close hits. However, three of the Stukas were shot down and probably most received damage. Luftwaffe chief Hermann Göring had asked for volunteers to fly a suicide mission against the bridge. Many volunteered, but the idea was dismissed when it was explained the bombs could not be armed while attached to the aircraft. The Stukas approached from the south along the river around 3,000 feet. 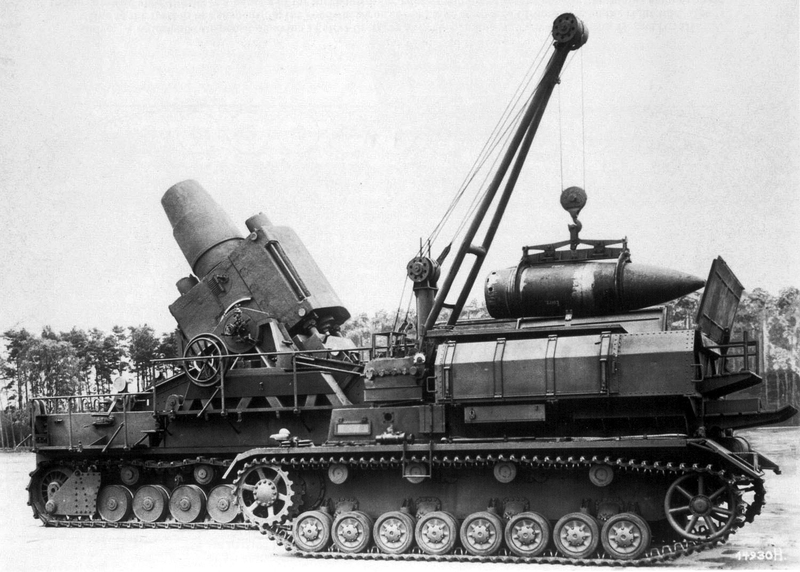 The radars easily acquired them at that altitude, and 90mm anti-aircraft guns fired away. Despite the AAA fire, the bombers took no evasive action. Some jettisoned their bombs before reaching the bridge, and one or two bombs did fall on the western approach to the bridge. This would be as close as the Luftwaffe would come to the bridge that day. 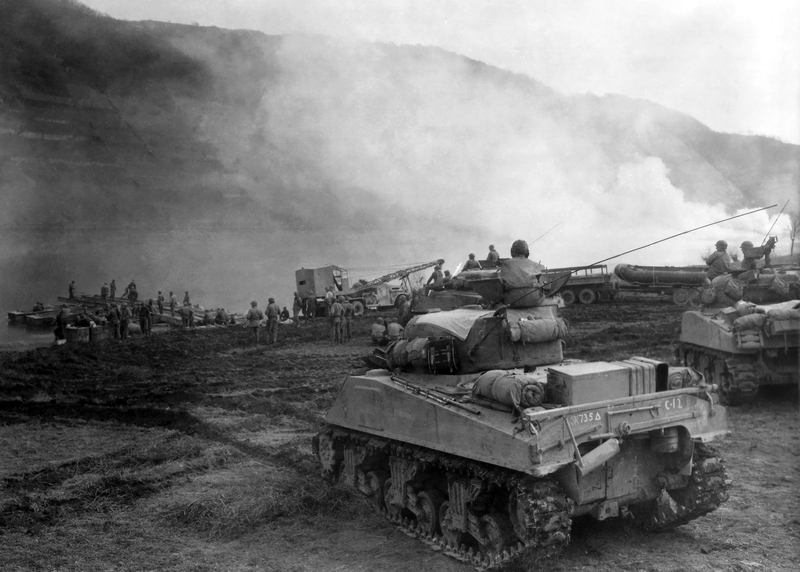 This action started a great rush of anti-aircraft artillery to the Remagen area. In a few days, the whole area was a giant mass of anti-aircraft units. 37mm, 40mm automatic cannon, and 90mm anti-aircraft guns ringed the area. 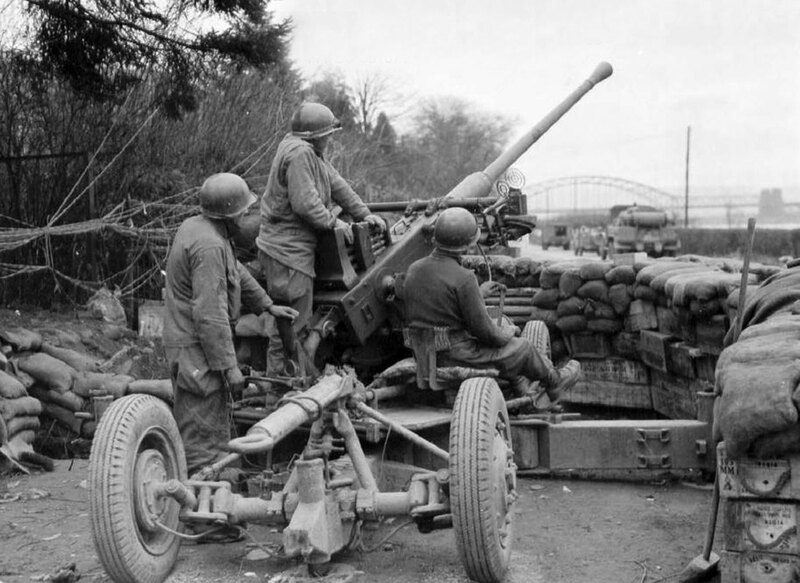 Although the presence of hundreds of antiaircraft guns and machine guns ultimately ensured the bridge's safety, the full strength of the anti-aircraft buildup associated with Remagen did not occur until March 10, 1945. However, before this buildup, the Luftwaffe launched air strikes that had an excellent chance to destroy the bridge. 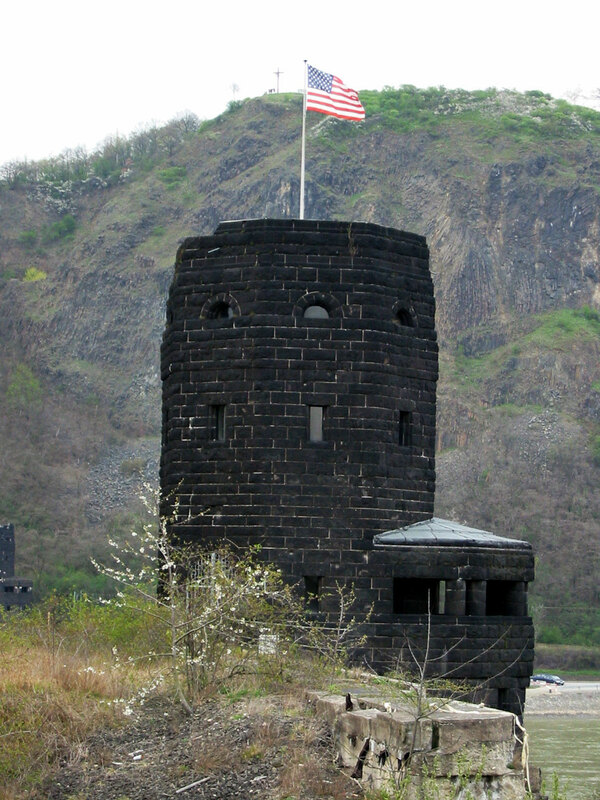 The remarkable story of Remagen defense was the establishment of the initial defenses around the bridge in the first 72 hours, not the huge buildup that followed. The battalions added to the defense after March 10 were a statement of resolve, rather than necessity. The Luftwaffe's response to counter with quick air attacks was the right one. Even the use of the outdated Ju-88 dive-bomber was the correct decision. Despite heavy losses, the Stuka was probably the one aircraft that could have brought the bridge down early on. Given the weakened state of the bridge, just one 500-pound bomb delivered against a girder or weakened truss could have caused the entire structure to collapse. But after the unsuccessful mission of March 8, the Luftwaffe decided to use its most modern aircraft to attack the Ludendorff Bridge. On March 9 an assortment of German aircraft were sent to attack the bridge. Early that morning, these included the Fw-190, Bf-109, and Me-410. 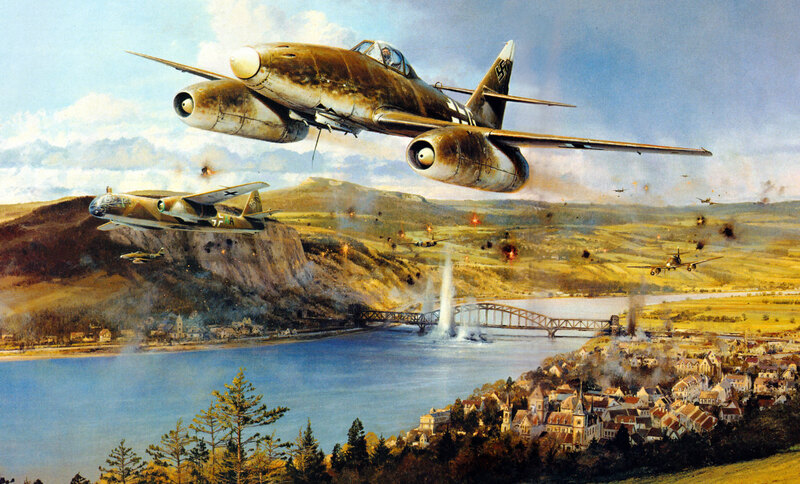 Later in the day, III./KG76 flew sorties against the Remagen bridge. 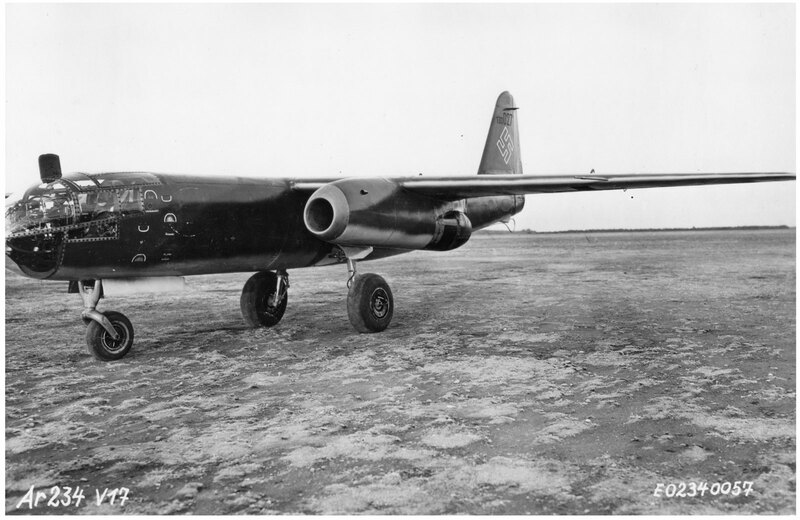 Three Arado Ar-234 jet-bombers were sent, along with some Me-262s flying cover. 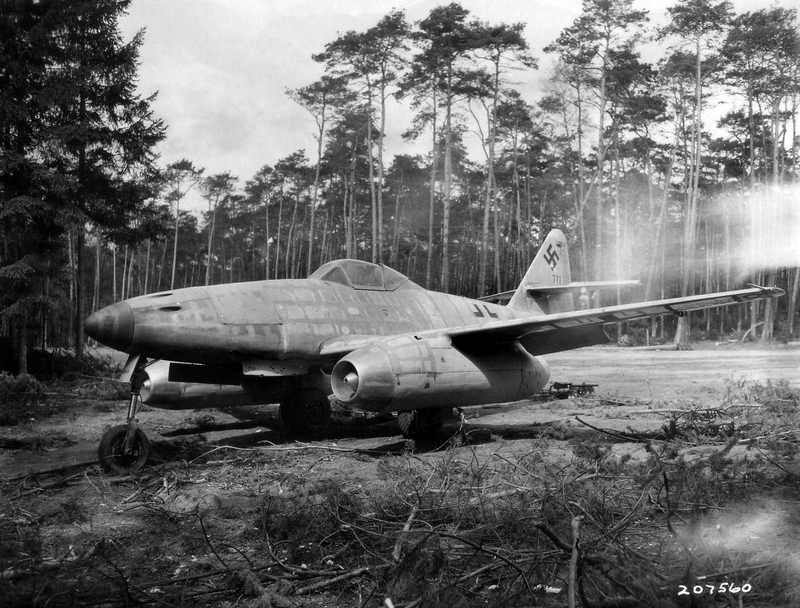 But the AAA was very heavy and one Ar-234 was shot down, one other reported missing. On March 11 two more Ar-234s from III./KG76 attacked the bridge. On March 12 four Ar-234s came over at noon, followed by twelve more, escorted by Me-262s flying cover, later that day. The next day nineteen Arado jet-bombers attack again without success. On March 10, 1945, a decision was made to build two temporary ponton bridges spanning the river. 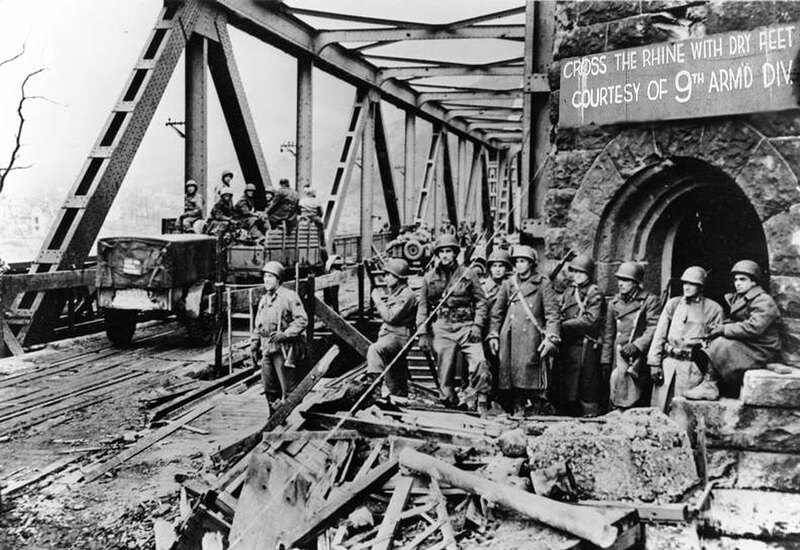 Repairs were needed on the Ludendorff Bridge, but the Allies did not want to slow the movement of thousands of troops and supplies over the Rhine and into Germany. 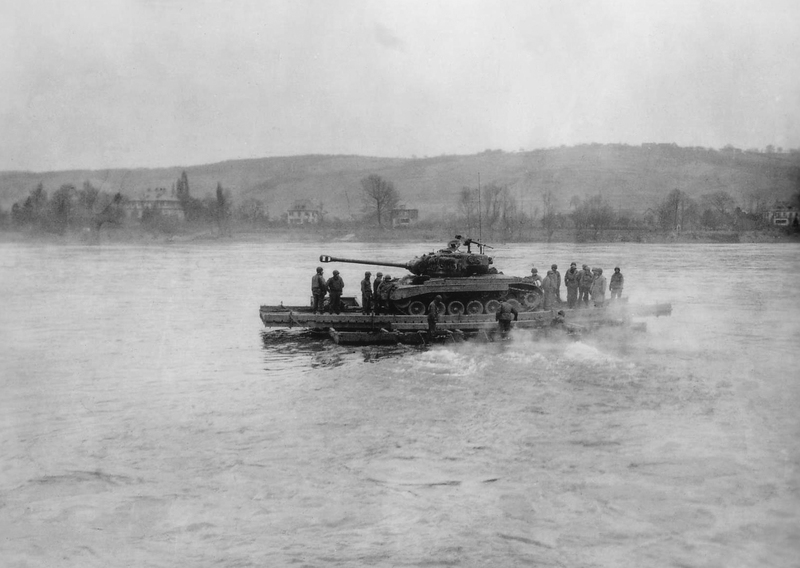 Under German fire and Luftwaffe attacks, the 51st and 291st Combat Engineer Battalions began constructing a ponton and tread-way bridge, as well as a ferry system with pontons and landing craft to put even more Allied troops, tanks, and weaponry over the Rhine. 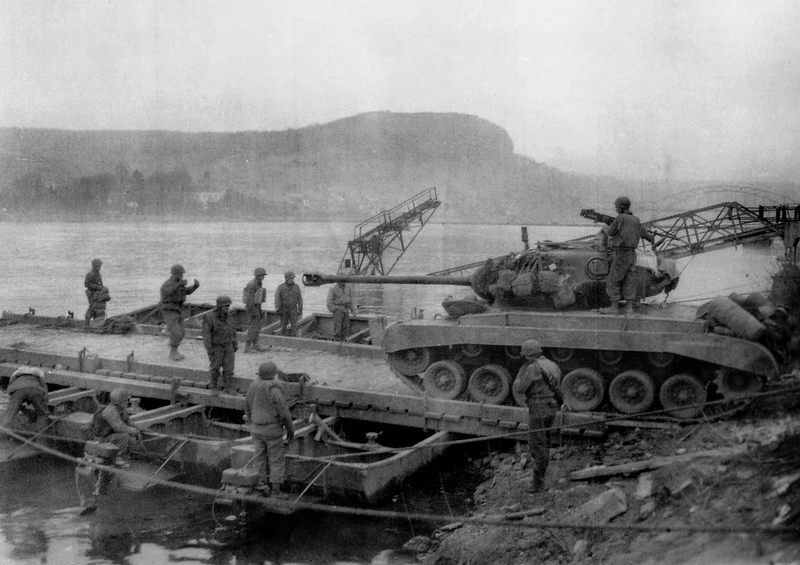 While the M26 Pershing tanks were too heavy to cross the bridge, they were soon across using the new ferry system. During the following days several divisions were ferried across the river. 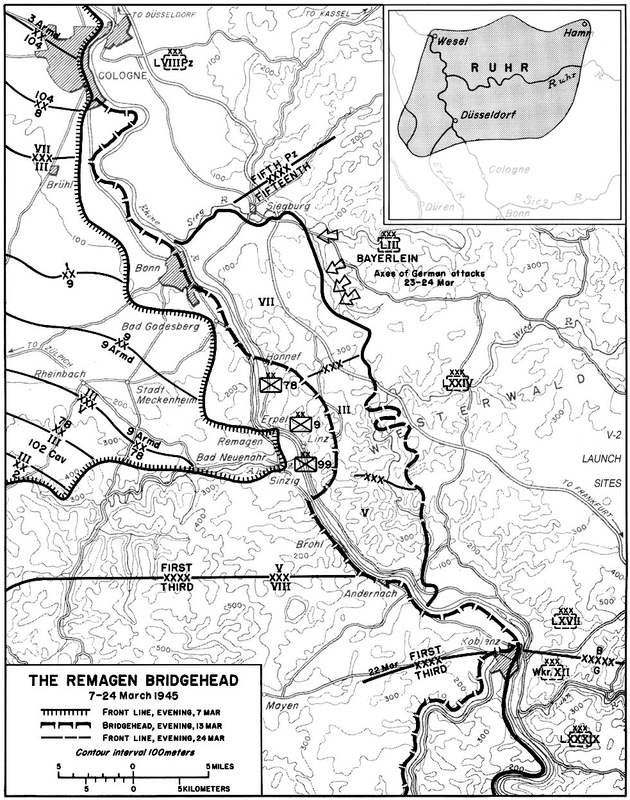 The area of the bridgehead was expanded with the 99th Infantry Division, the 9th Armored Division, and 78th Infantry Division all crossing to the east bank of the Rhine River—a tremendous victory for the Allies and a devastating development for the German defenders of the Ruhr. The Americans had been simply too swift for any potential Nazi counters. 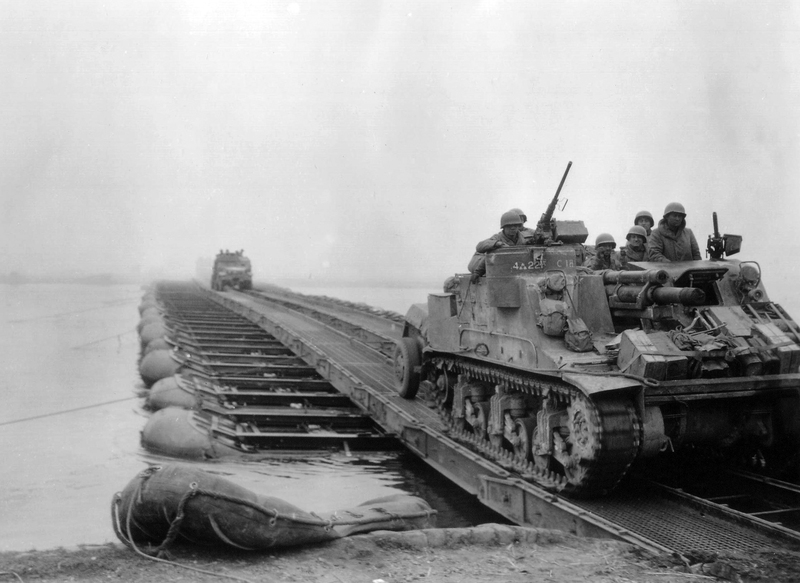 On March 14, eleven Ar-234s turned their attention to the newly constructed ponton bridge south of the Ludendorff Bridge. The Luftwaffe jets encountered withering flak, and if that was not enough, they were pounced by RAF Tempests and Spitfires, along with long-range US aircraft—P-38s and P-51s. At least 5 German aircraft were downed. On March 15, twenty-one German jet aircraft attacked the bridge with poor results. US anti-aircraft batteries shot down more than half of these fast-moving aircraft. 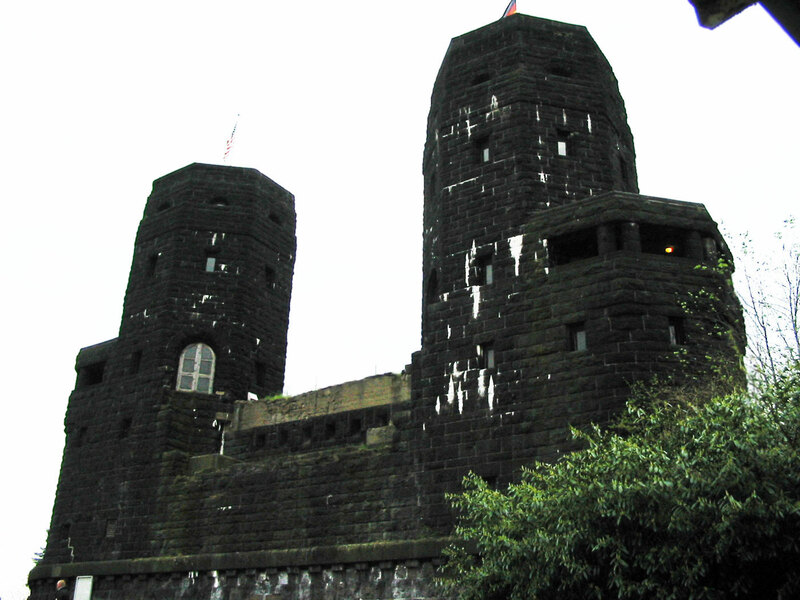 The defense of the Remagen Bridge ranks as one of the greatest Antiaircraft Artillery battles in American history. Engineers of the 276th Engineer Combat Battalion and of the 1058th Port Construction and Repair Detachments were required to make repairs to the bridge. After its capture on March 7th, the steel-girder construction suffered stress from the German artillery fire and from the bombardment by the Luftwaffe. Added to this were the shocks caused by American heavy artillery nearby and the heavy equipment brought onto the bridge. Over these ten days the soldiers billeted in Remagen and on the east bank were not only witness to the German efforts in the sky, but also to the heavy artillery barrage slung by the Germans into the bridgehead. A 17cm rail-mounted artillery gun was drawn up on the southeastern edge of the bridgehead and caused many a G.I. to shudder as its heavy missiles gouged holes west of the Rhine. Its greatest damage was done in the town of Remagen, and the combat troops east of the Rhine in the bridgehead were relatively well-protected by the steep Erpeler Ley. 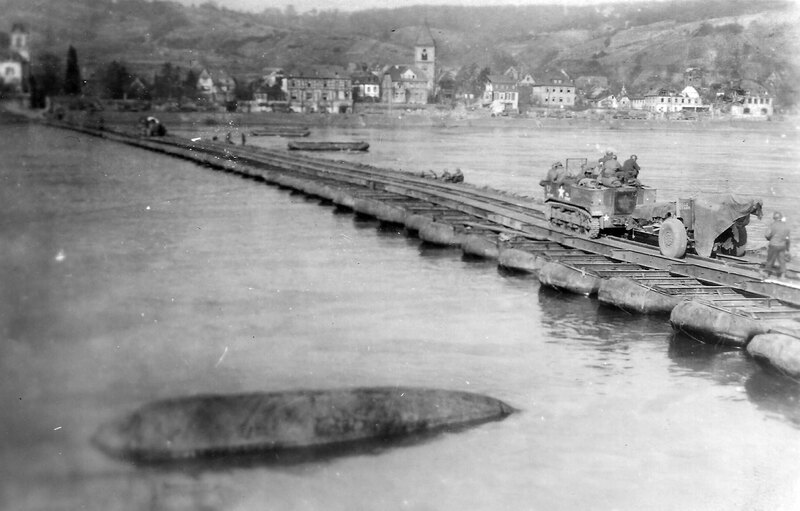 while the lighter-weight Sherman tanks could cross over the planking laid on the Ludendorff Bridge. Hitler was incensed that the Americans had not been repelled by conventional forces. He ordered all available means of attack to be directed at the bridge, even the eccentric. The bridgehead was bombarded by a 17-centimeter railway-mounted artillery gun (drawn up on the southeastern edge of the bridgehead); new jet aircraft such as the Arado AR-234B and the Messerschmitt ME-262 fighter-bomber; the use of underwater scuba men (they were to swim down the Rhine in an attempt to place demolitions on the piers); and finally V-2 rockets to strike the bridgehead area. Even though the bridge was probably the aiming point for the V-2 attacks, Hitler’s objective was not to strike the bridge so much as it was to disrupt the whole area with the rocket attacks. Hitler was sure that his V-2s would cauterize the whole bridgehead area. He envisioned 50–100 missiles over a two- to three-day period, but at this point in the war there was no way the rocket troops could muster such an effort. On March 14, 1945, German General Bayerlein received an urgent communiqué from the Führer concerning the American bridgehead at Remagen. 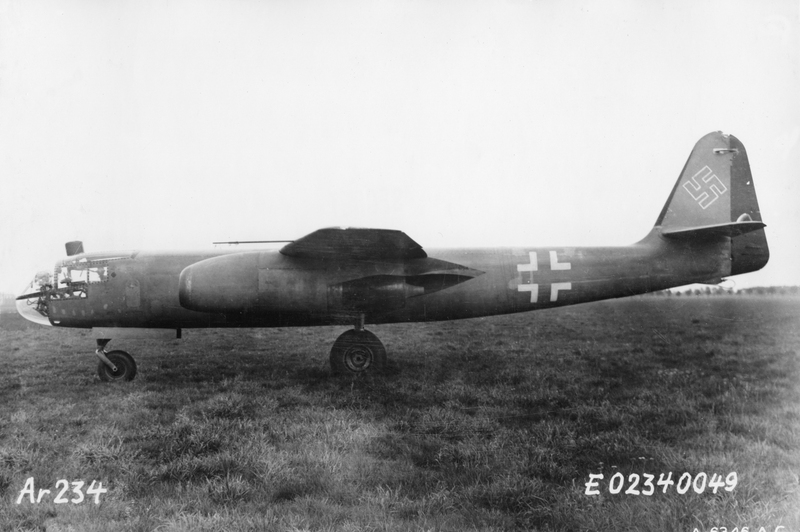 The General Staff was shocked when they learned Hitler was ordering the use of V-2s against targets on German soil. When the Führer was reminded of German civilians living in Remagen and the surrounding areas, he demanded the rocket attacks go forward regardless of casualties to civilians. Bayerlein commented, when the troops heard of Hitler’s fantastic plan to use a highly inaccurate weapon as a tactical weapon close to the front lines, "the knowledge of this possibility did not increase the German soldiers’ will to resist on that particular piece of ground." Late that evening, because of the accuracy problems with the V-2, the German soldiers fighting in the bridgehead were pulled back about nine miles from the front lines. This move puzzled some of the Allied commanders at first. However, contemplation of a coming V-weapon attack on the bridgehead had been discussed. A security blackout hushed the news of the possible threat to the bridge posed by German V-bomb attacks. The US commanders decided to keep any talk of this possibility quiet and not spread among the troops. The V-2s were a far more deadly form of the "pilotless aircraft" which had pounded London ever since the invasion of Normandy. The "buzz-bomb," or V-1, packed less of a punch, traveled more slowly, was easy to shoot down, and always gave an advance warning, The V-2 announced its presence with a sudden rush of air, a tremendous supersonic impact, and gave no warning. 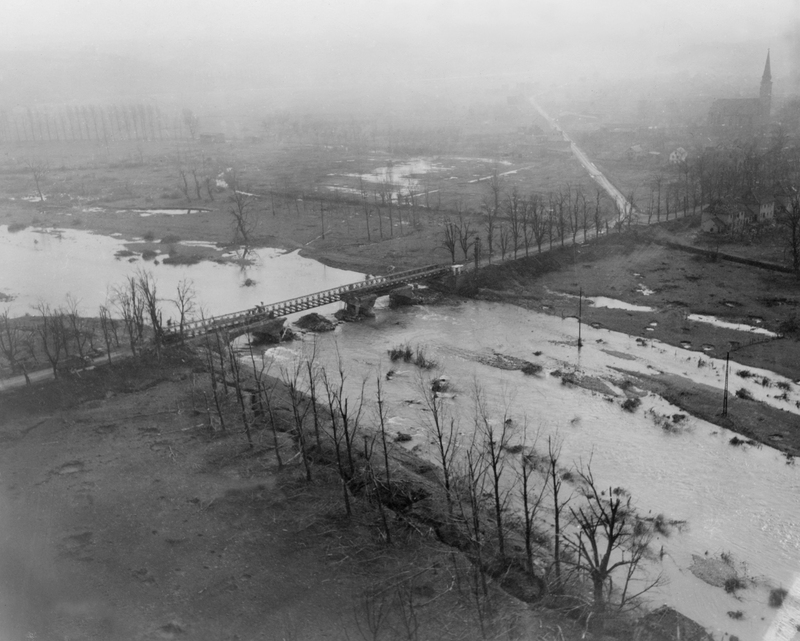 On March 16 the Germans began their strongest effort yet to bring down the Ludendorff bridge. 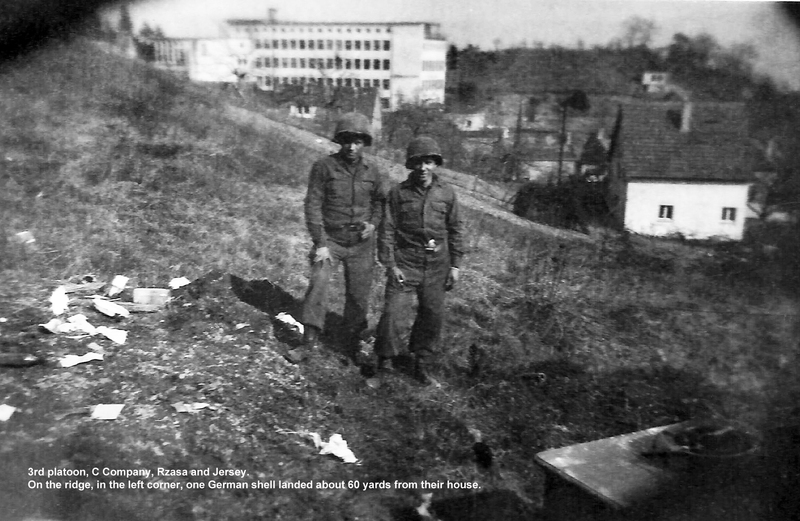 That morning shells larger than 88mm came over and on March 17 several giant projectiles from the tank mounted piece called the Karl howitzer landed in Remagen. 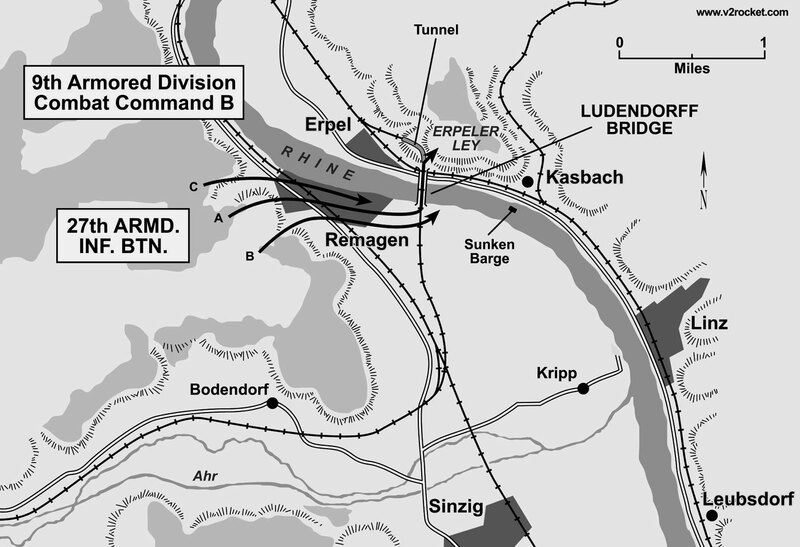 Commander of the German rocket forces, SS General Kammler, received orders to attack Remagen and immediately issued commands to the SS 500 crews at Hellendoorn, 130 miles to the north of Remagen, to fire on the American bridgehead. The SS 500 had been firing since March 8 from the older launch sites at Hellendoorn in the Netherlands. Despite fuel supply problems, the troops were able to muster 11 rockets for the attack on March 17, 1945. If the unit was given the assignment because of their new employment of the guide-beam equipment, the decision was erroneous. The new Leitstrahl apparatus could not be used for the attacks on Remagen because the installation was already situated for semi permanent operations in the direction of Antwerp; it could not be moved on such short notice. Nonetheless, the crews began firing at 9:45 AM and continued throughout the day until the eleventh round tilted toward Remagen around 9:45 PM. 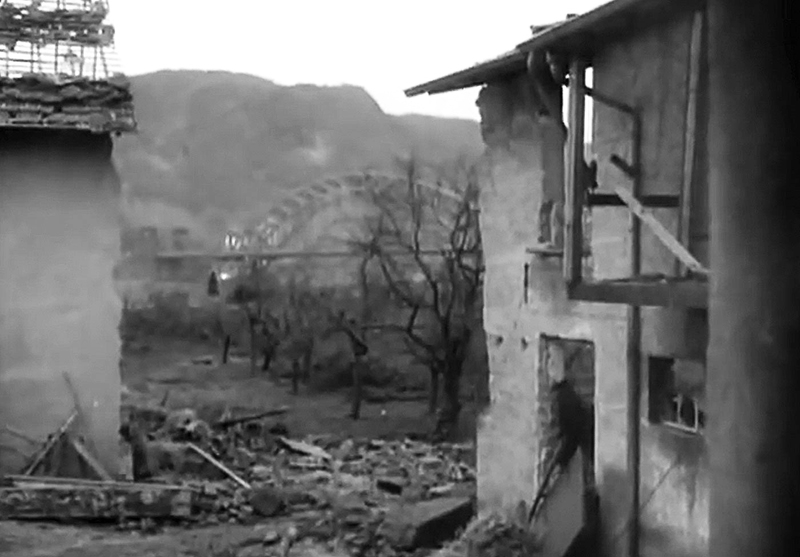 All hit near Remagen except for one, which came down some 40 kilometers away near Cologne. For the Americans fighting in the bridgehead, the sight of V-2s rising in the distance wasn't uncommon. 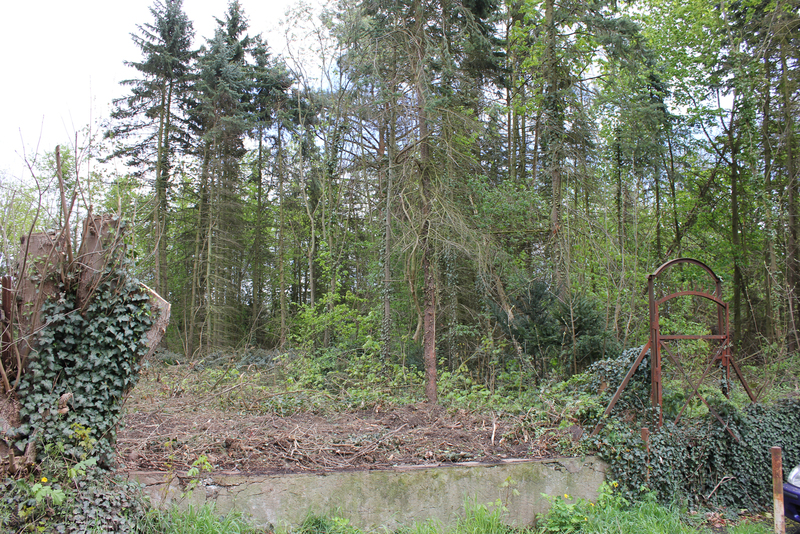 The difference being, these rockets were being fired at Antwerp from rocket troops positioned in Westerwald forest to the east. Anti-aircraft observers scanning the skies for enemy aircraft over Remagen had been able to spot the V-2s rising from Battalion 836 (Art. Reg. 901) at Hachenburg and watched as the rockets passed overhead on the way to Antwerp. 413th AAA battery's observer spotted two more being launched on March 16 and watched as they tore out of sight into the atmosphere: "At approximately 6:15 AM a vapor trail, rising vertically from the ground was observed through a director telescope, while a net message was being run. Around 6:45 AM the same was observed again. It was believed that the trails were from V-2s." 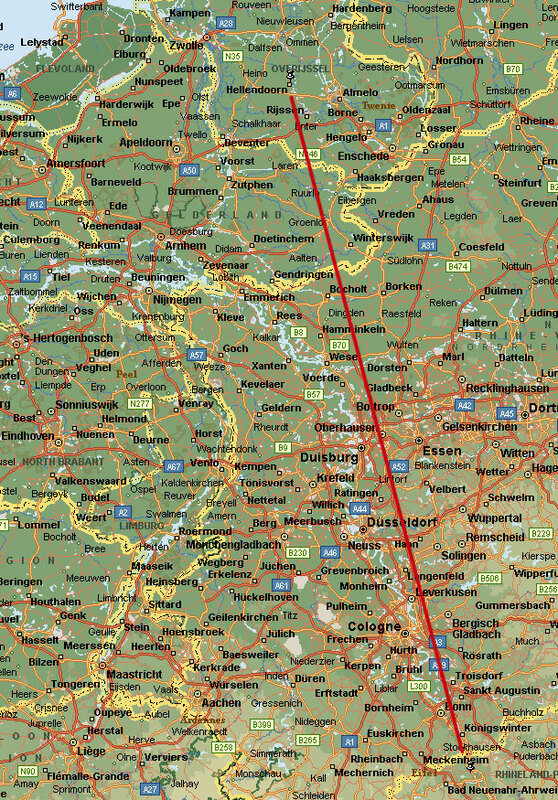 The last rocket from Hachenburg area was launched around 3:00 PM on March 16, 1945. 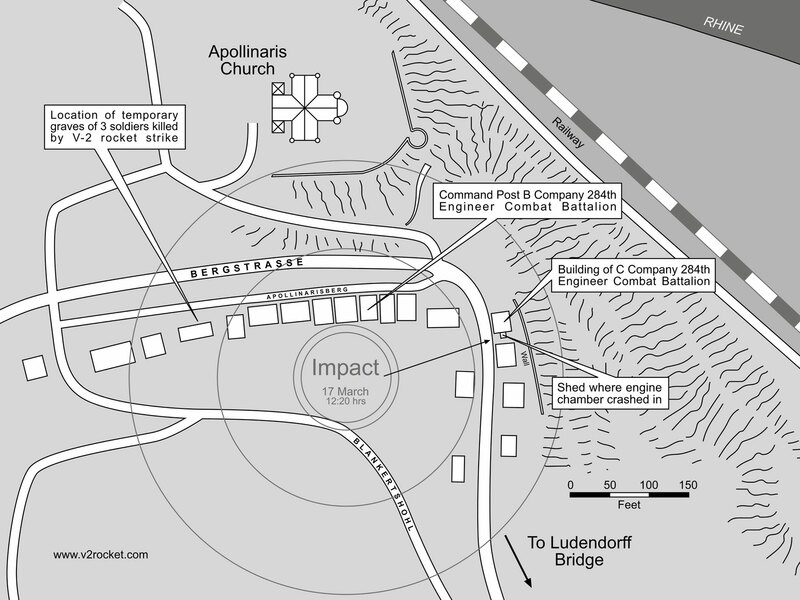 The failing supply of rocket fuel and Allied advance at Remagen, caused Battalion 836 (Art. Reg. 901) to be the first V-2 launching unit to halt operations. Of the eleven rockets fired from Holland on March 17, 1945, the first round ended up landing closest to the bridge. Just before impact the missile broke up (air-burst) over Kasbach (just southeast of bridge) and scattered rocket parts over a wide area of the town. Parts of the rocket motor crashed through the roof of the house belonging to Kasbach resident Christian Schützeichel. Debris smashed into Erpeler Ley and the combustion chamber was buried in the hillside. The warhead came down around 9:54 AM in the backyard of a house belonging to a farmer named Herman Joseph Lange. This farm was 500-800 yards south/southeast of the Ludendorff bridge. A dozen US soldiers were billeted in this house; three of them were killed instantly. In the short time the Americans had been staying at the home of Joseph Lange, the family had already become close to the men, some who were now dead. The rocket impact, so close to the bridge, shook the ground with a tremendous boom and mini-earthquake. In the explosion 18 farm animals were also killed. The incoming missile had been seen and tracked by anti-aircraft observers near the bridge -- "At 09:55 hours, while tracking two German planes, at 9500 ft, flying west to east, AAA units observed an object resembling fast-moving bomb pass across the track of telescopes. The object fell in a direction east to west with large explosion, producing at least two loud booms. Several pieces of aluminum scrap fell, some in our battery position." At about 10:34 AM the second rocket launched from Holland impacted approximately 8km west/northwest of the bridge near the town of Birresdorf. 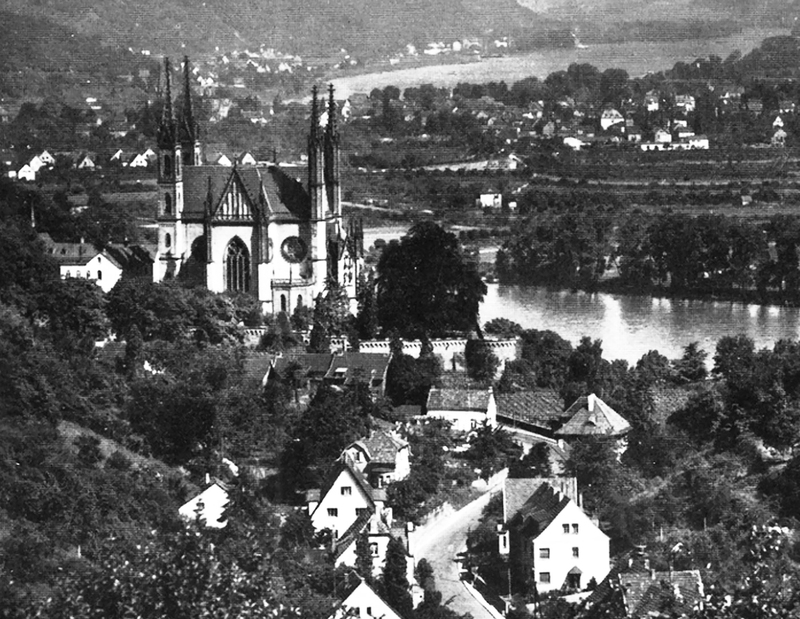 Around 12:20 PM, a third V-2 fell about a half a mile from the bridge, close to the Apollinaris Church in Remagen. This round destroyed several buildings near the church including the command post of B Company 284th Engineer Combat Battalion (1159th Group), killing another three men and injuring 31 others and causing collateral damage to buildings within 1,000 meters. The impact shook every structure in the city. This impact was witnessed by airspace observers of the 413th AAA Gun Battalion. Later, while examining the railroad bridge, men at a 40mm gun section were questioned and they told of a double explosion at about 12:30 hours. They had a piece of aluminum with ice on it which had fallen near them immediately after the explosion. 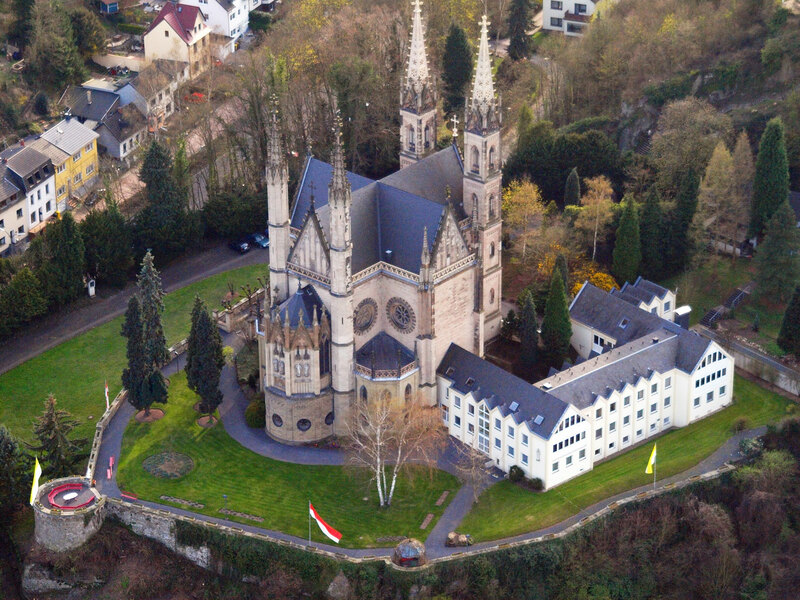 At 3:18 PM, the fourth rocket impacted about 300 meters north of the parish church in the town of Nierendorf, 7km west/northwest of the bridge. The diary of the Priest recounted much damage to the church, nearly all windows were destroyed and parsonage building was strongly damaged. At 3:44 PM a fifth V-2 came down about 7km northwest of the Ludendorff Bridge in the town of Oedingen. The rocket hit in middle of street Johannisstraße, destroying several houses and dug out a huge crater. Three houses along that street were swept away by the explosion. According to Oedingen city records, six people died and numerous citizens of Oedingen and American soldiers were wounded. 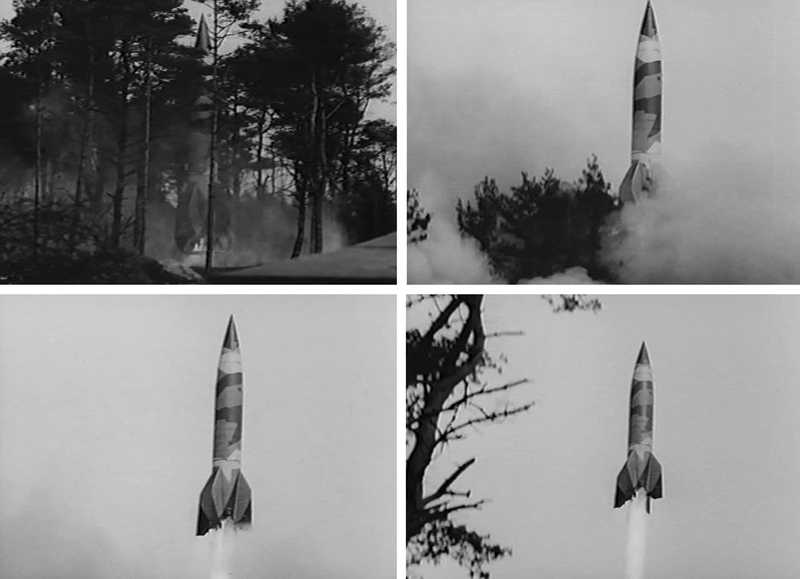 Further into the evening, six more rockets fell in the surrounding countryside. The launching times of the eleven V-2s from Hellendoorn are accurately listed in the war diary of the SS Werfer Abteilung 500, also in two teletype messages of the army. 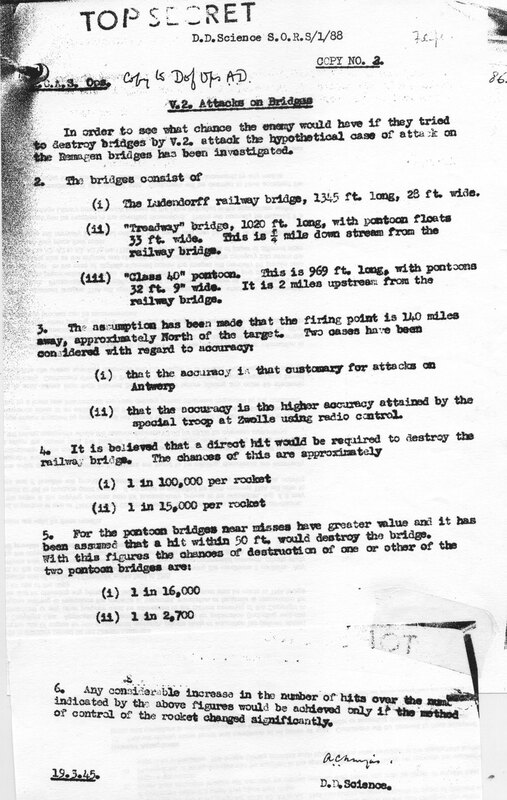 Even before the last of the 11 rockets had been launched, General Kammler sent a request to Army Group B for a report on explosions observed in Remagen bridgehead. He wanted details of place, time and effect. Kammler had also assigned an observation officer from the rocket division to the main front. Any observation was made difficult because of the American advance in the area. Because of the size of the target area and the features of the terrain, accurate spotting from troops and artillery observation posts was extremely difficult—only one report was given. The Volks Artillery Corps 409 described some strikingly loud noises of explosions and reported a powerful detonation at about 9:50 AM near the river. The Americans had established a powerful radar system in Europe for the detection of launching sites as well as impact sites of V-weapons. 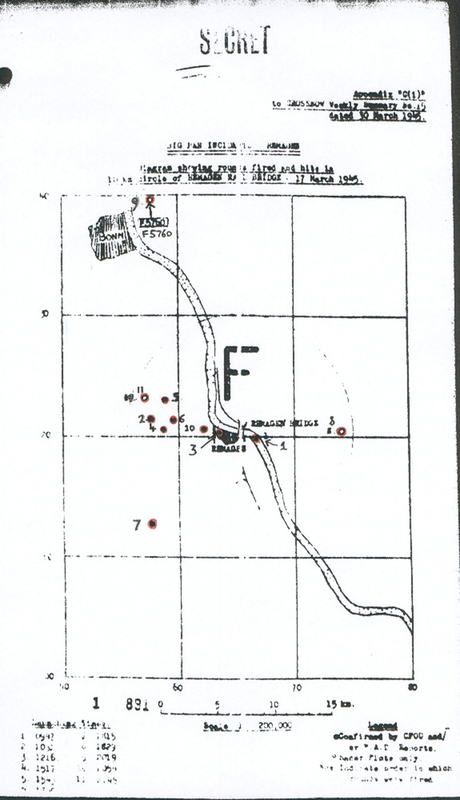 The report "Big Ben Incidents Remagen" notes eleven V-2 impacts and impact times. The impact sites were either observed by soldiers on the ground or by units in charge of the identification of hostile artillery positions. The report also notes the positioning of the above-mentioned radar stations. Furthermore six of the impacts were confirmed by reports of contemporary witnesses or by discovery of V-2 remains. Some 200 engineers from the 276th Combat Engineer Battalion and 1058th Bridge Construction and Repair Group were working on the Ludendorff Bridge, attempting to strengthen its weakened framework. Just after 3:00 PM, the engineers began to hear popping rivets and screeching steel. A few seconds later the structure began to shake. Those that could, dropped their tools and sprinted to get off the bridge. The medium part toppled downstream into the current of the Rhine, while the side-frames glided down the pier into the river. Many of the engineers working in the middle of the framework had no chance to flee the long, 1,000-foot structure. With a wretched, sickening crash, and the screams of doomed men, the structure collapsed into the icy, fast rushing waters of the Rhine. The final casualty toll was 28 dead and 63 injured. 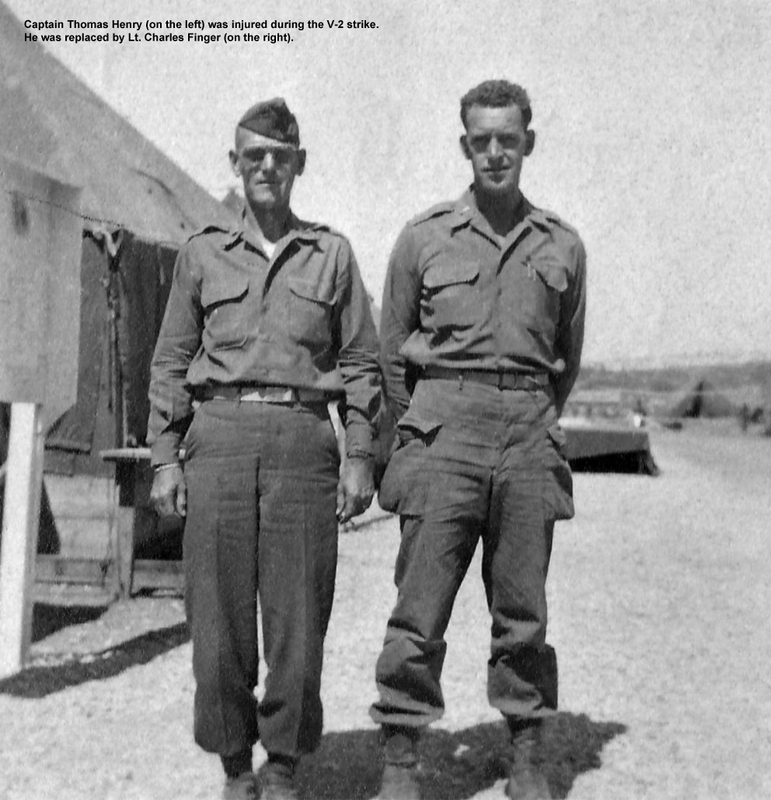 Engineer John Morgado of 16th Armored Division remembers—"I was out on the bridge, but only at the near edge. When it came down, the noise and the sight of the falling soldiers was very frightening. I was afraid that the rest of the bridge would go, and all of us would meet the same end. I looked down to see the men, several of whom I knew, trying to keep their heads above the water, but because they had on heavy gear and the river was flowing so swiftly they couldn’t. All 28 of those engineers drowned, and 93 more Americans were wounded, right there in front of me. 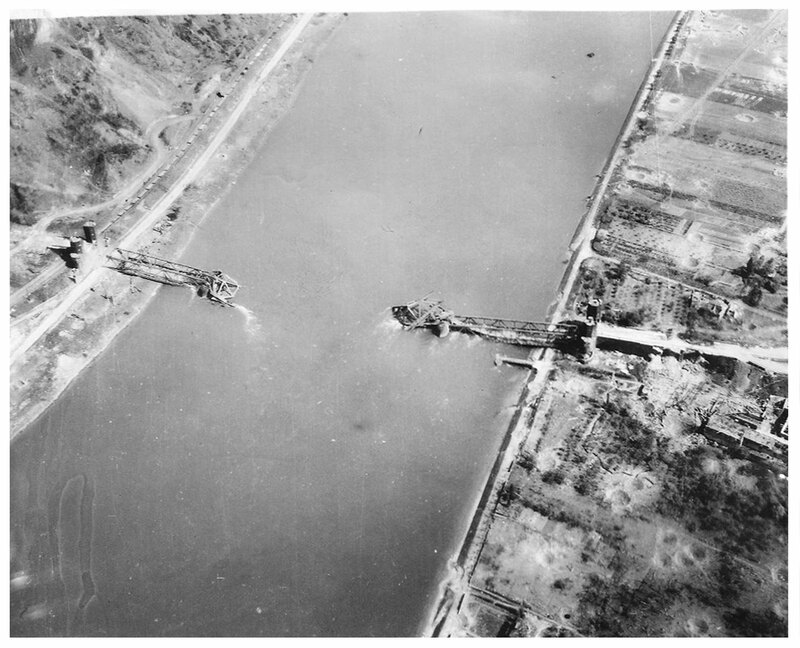 Patton then ordered us to build a new bridge for the tanks to cross the Rhine. Our engineering group tied together pontons and tread-ways one at a time next to the span and floated them across the river, no mean task with the river flowing so rapidly. It was dangerous work. Once we successfully constructed this bridge the tanks could cross again. Over the next 10 days 25,000 troops, 2,500 vehicles and tons of equipment swarmed across that and several other ponton bridges into military history. 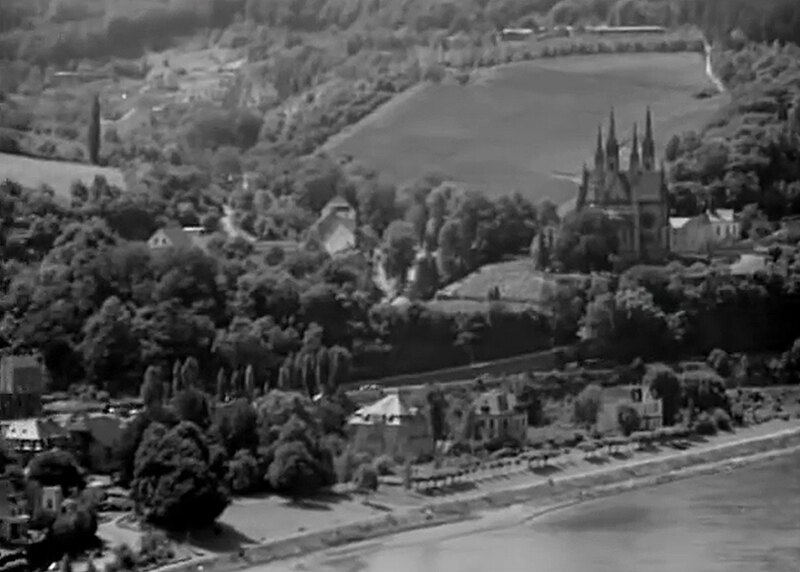 It was known as the 'Miracle' of Remagen." If the earth-shaking rocket attacks did not substantially contribute to the collapse of the bridge, it is certainly a strange coincidence that the bridge fell into the river the same day. In describing the 1.4 billion foot-pounds of force created by a single V-2 hitting the earth at 3,000 mph, General Dornberger touted it equal to “fifty locomotives, each weighing a hundred tons, impacting the ground at 60 mph.” However, the majority of the V-2’s energy is converted to heat on impact—much of the shock-wave goes up and in the soil much more energy is converted to frictional heat. In a dense city the blast wave from the speed of impact could cause considerable damage to nearby buildings, but steel bridges are generally very difficult targets to bring down. During WWII, there are almost no examples of bridges destroyed by anything else than a direct hit or demolition charges. Even the atomic blasts in Hiroshima and Nagasaki had amazingly little effect on bridges. Considering the constant shelling over the past days, the tons of equipment crossing the river, and the enormous weight of wooden planking added to the bridge, the force exerted by the V-2s crashing in the bridgehead simply added to overall stress on the already weakened bridge. Friesenhahn's demolition so damaged the upstream truss that it was useless. In the end, it was too much for one weakened downstream truss to withstand these "earthquakes." The following day, even though he could have only assumed the rocket attacks had been the catalyst, Hitler sent his personal congratulations to the crews at Hellendoorn for the destruction of the Ludendorff Bridge. The firing crews boasted of their accomplishment to Dutch civilians the next day. However, by that time two ponton bridges had already been constructed by the American engineers—one 700 meters downstream previously mentioned, and the other between Kripp and Linz. On March 16 the ponton bridge between Rolandseck and Honnef became operational. Photos below: Twisted remains of the bridge after collapse. Later, Hitler turned his wrath on anyone deemed to be responsible for allowing the Ludendorff Bridge to be captured by the Americans. Hitler sacked Gerd von Rundstedt, commander in chief in the West, replacing him with Field Marshal Albert Kesselring. A hurried Nazi court-martial chaired by Lt. General Rudolph Hübner found five officers guilty of cowardice and dereliction of duty and sentenced them to death. Four of these, Maj. Scheller, Lt. Karl Heinz Peters, Maj. Herbert Strobel, and Maj. August Kraft, faced the firing squad on the day of their sentencing in the Westerwald (two in Rimbach, two in Oberirsen). A sixth officer, Capt. Friesenhahn was exonerated, as the court found that he had done everything within his powers to destroy the bridge, not that it mattered as he had been captured by the Americans. Their families' pension rights were revoked, but then they were reinstated after the defeat of Nazi Germany. The fifth officer, Captain Bratge, was convicted and sentenced in absentia, since he had been captured by the US Army by that time. For their part in the battle, Timmermann and DeLisio, along with 13 others, received the Distinguished Service Cross. The Silver Star was earned by 152 American soldiers. All units that comprised Combat Command B of the 9th Armored Division received Presidential Unit Citations. US President Eisenhower later said the names of the brave men participating in the battle to Remagen should be in a permanent place in the niche of fame at the seat of the American government. 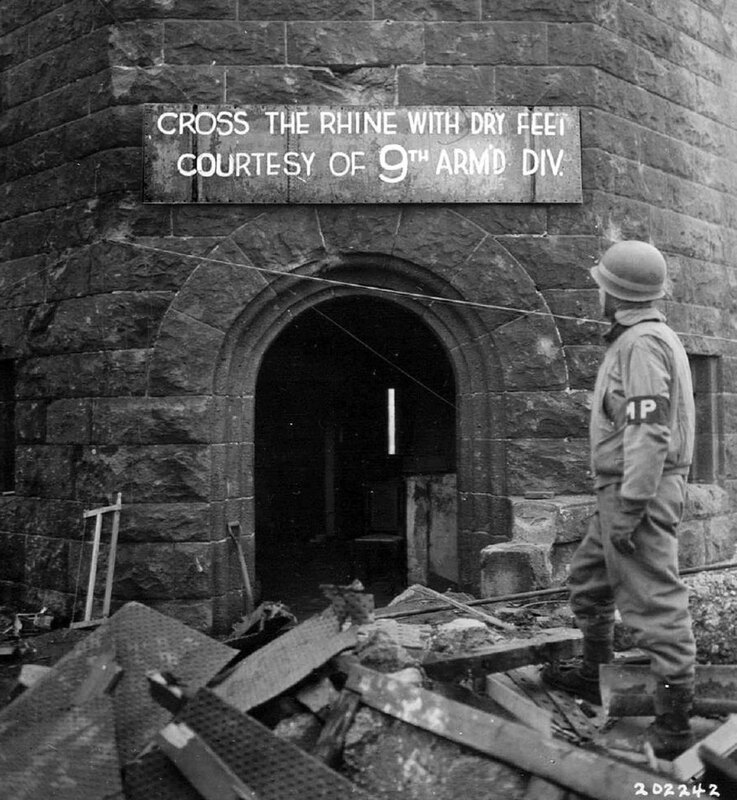 A large sign was placed on one of the stone towers of the Ludendorff Bridge (see photos below) by C Co, 9th Armored Engineer Battalion, marked "CROSS THE RHINE WITH DRY FEET COURTESY OF 9TH ARM'D DIV". The sign is now on display at the George Patton Museum of Cavalry and Armor, at Fort Knox, Kentucky. Center of Military History Washington D.C. "US Army in World War II, The Technical Services, Corps of Engineers: The War Against Germany,"
MacDonald, The Last Offensive, p 228, quoting SHAEF Air Defense Division, Summary of Casualties and Damage from V-Weapon Attack, Report for the Week Ending March 19, 1945. 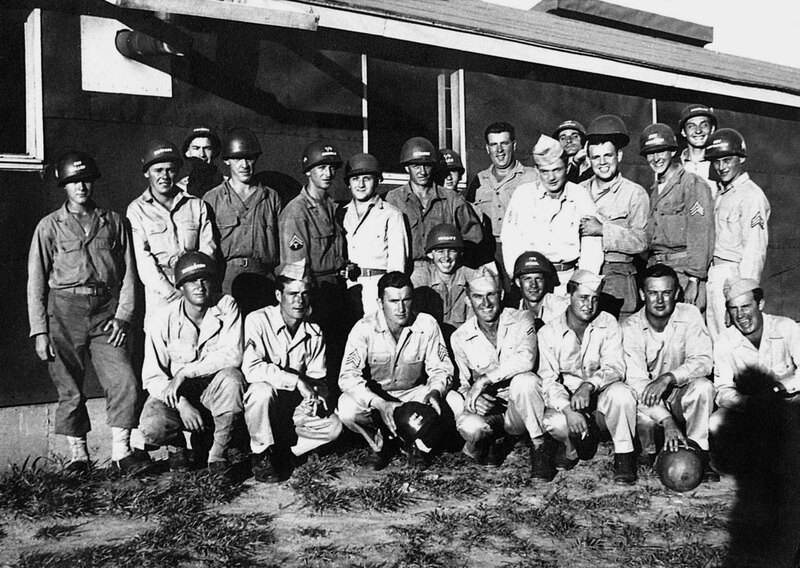 History of the 284th Engineering Combat Battalion, February-March-May 1945, and the 1159 Engineering Combat Group, June 26 to August 20, 1945. Photos below: Some of the unconventional German weaponry thrown into action against American bridgehead at Remagen. Caught up in the race to the Rhine was one American engineer battalion that would become embroiled in V-2 rocket lore on March 17, 1945. The 284th Combat Engineers Battalion had been in England since November of 1944 completing their training on bridge, road repair, and construction. In early January 1945 the battalion left Camp Delemere Park in England and arrived at Camp Twenty Grand, located approximately forty miles east of Le Havre. This camp consisted of thousands of six-man pyramidal tents set up as a staging area, where, newly arrived GIs would be assigned their duties in the ETO. 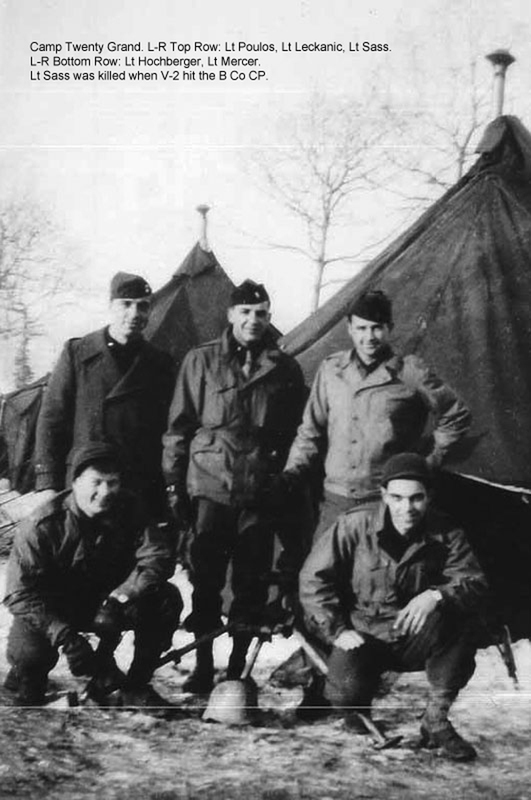 On January 25, 1945, the battalion traveled to Moutfort in Luxembourg for infantry training. Although the 284th was part of the 3rd US Army, in Luxembourg the battalion was transferred to 1st Army's front line near the Hürtgen Forest, which was then resting on the flooded Röer River. 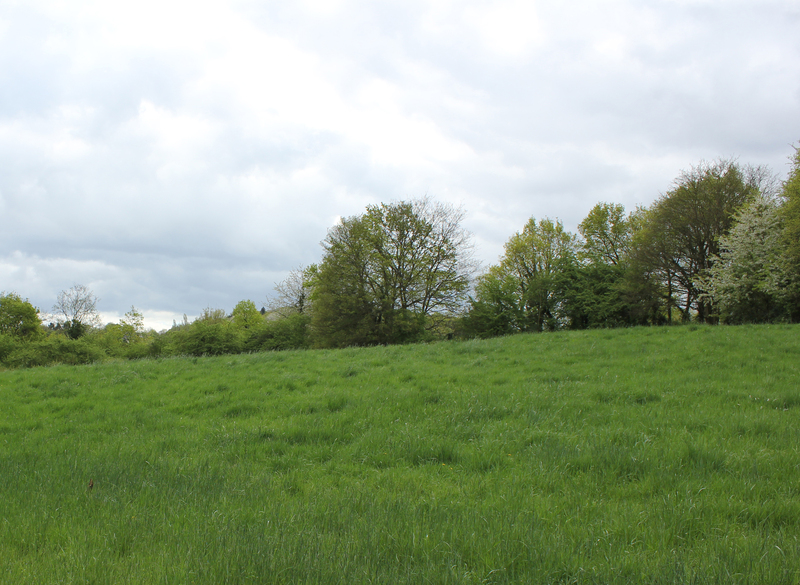 From February 4-15 the battalion occupied defensive positions along Moselle near Remich (used as infantry by 2nd Cavalry) and then later, positions along Our River guarding Skyline Drive near Kocherey (used as infantry by 6th Armored Division). Once the waters of the flooded Röer River subsided, the Lumberjack offensive was launched. On February 26, 1945, 284th Company C built a Bailey bridge at Kreuzau, under artillery and small arms fire, that put the 9th Armored Division (Combat Command B) rolling onto the Rhine Plain. This was the longest bailey bridge in the ETO to date. It was 254-foot-long, built on the remnants of arches from a bridge that the Germans had demolished. The Germans had blown the dams in the river upstream so the engineers had to wait for the water to recede and they soon discovered the area littered with mines. During this drive the 284th was also assigned as infantry to support the 9th Armored. 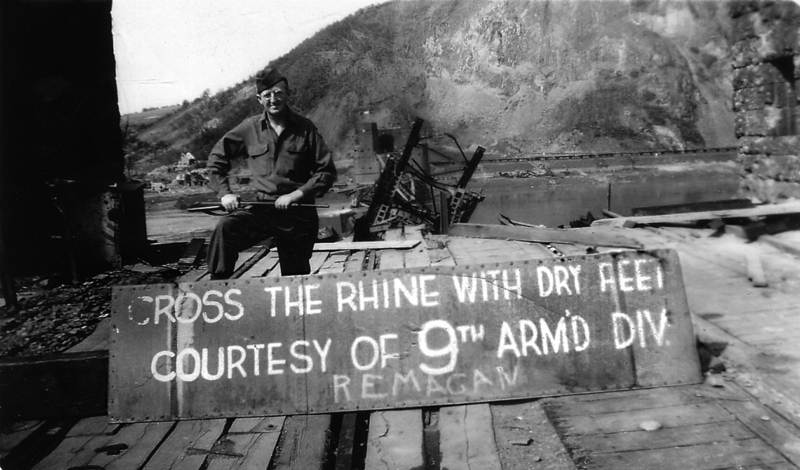 B Company and C Company of the 284th stuck with the 9th Armored all the way into Remagen. The recon portion of 284th had been with CCB the afternoon before they reached the Rhine and took the bridge. 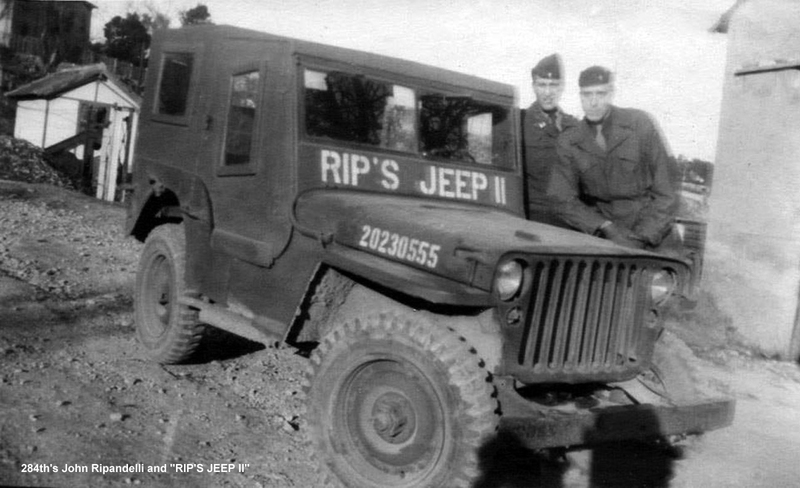 Two jeep loads of 284th headquarters officers crossed the bridge late in the morning on March 8 to examine its condition, considering the blasts it had suffered. 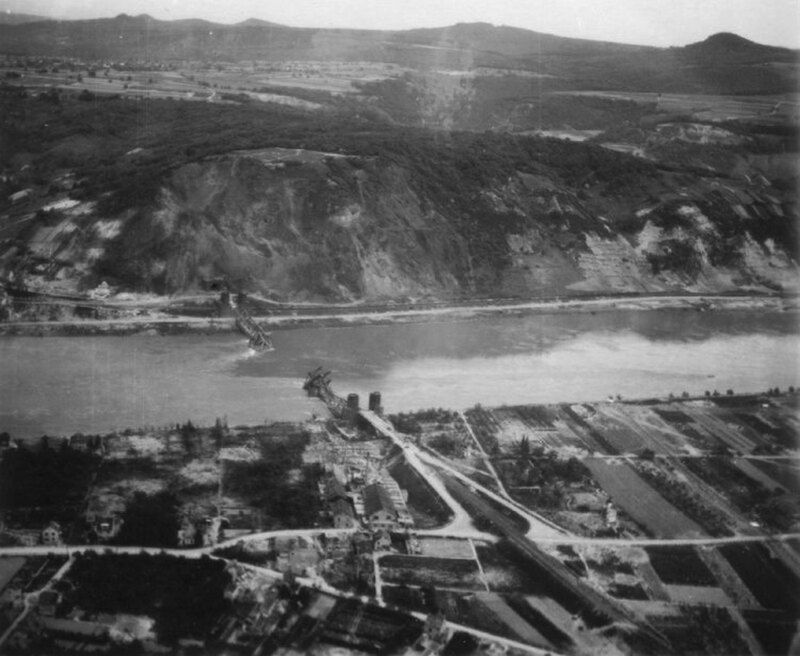 Sometime after March 8 the 284th engineers took up positions on Apollinarisberg (road) overlooking the Rhine River on the west bank. The 284th was billeted in the houses next to the ancient Apollinaris Church. 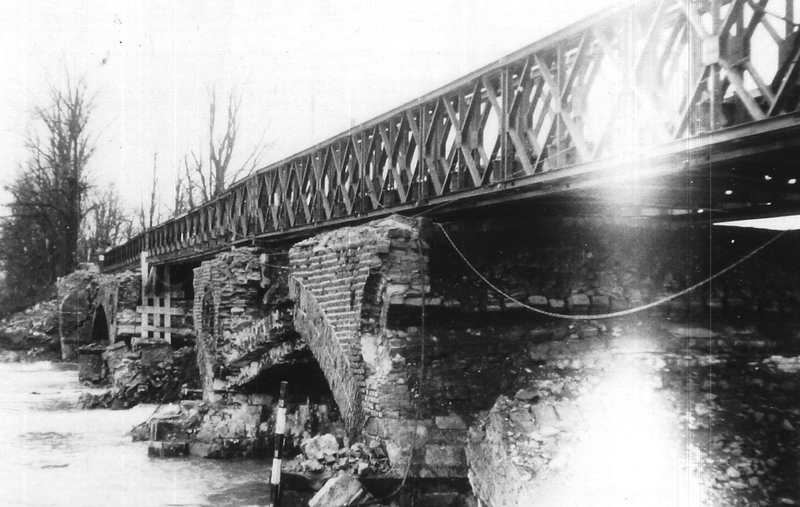 Photos below show the Bailey bridge constructed by C Company 284th Engineer Combat Battalion over the Röer River. 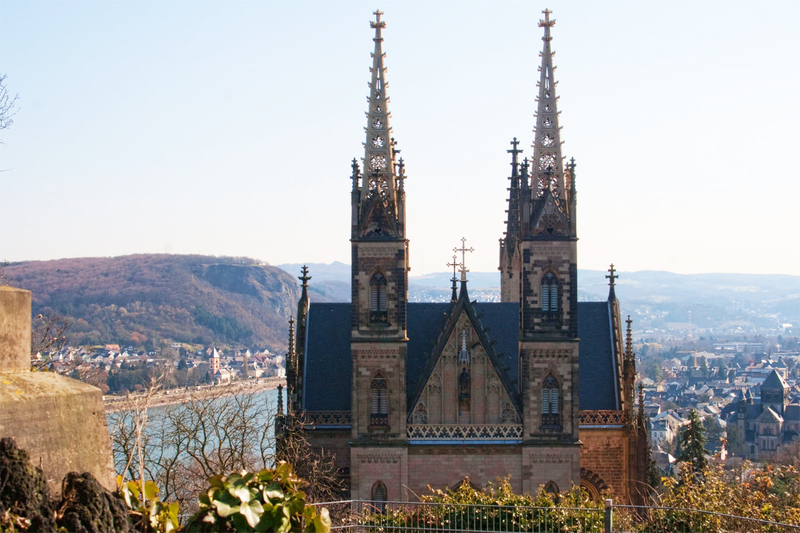 Located on a hill over-looking the Rhine River on the west bank was the centuries-old church, Apollinariskirche. Built on the site of a former Roman temple, the great spires of the church were visible for miles. 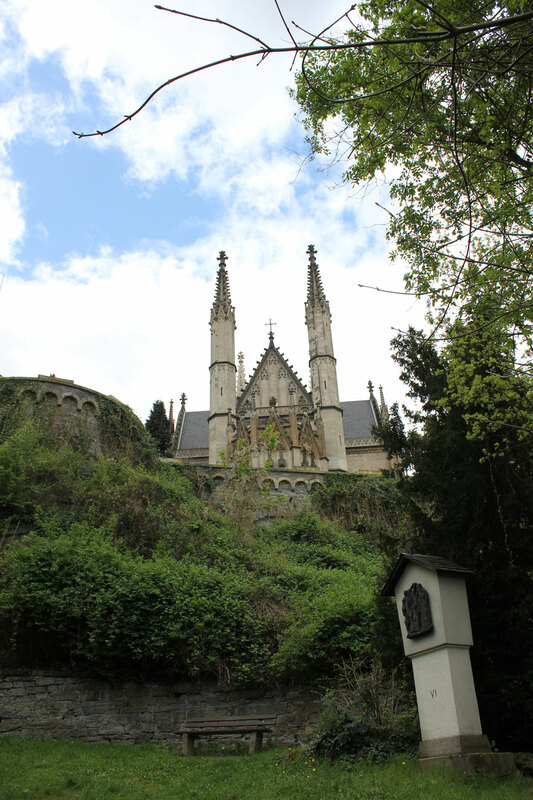 The hill above the town of Remagen was known as the Martinsberg in the 5th and 6th centuries, presumably after a Frankish chapel there dedicated to Saint Martin, patron of the Franks. In the 9th century this chapel was replaced by a Romanesque church. 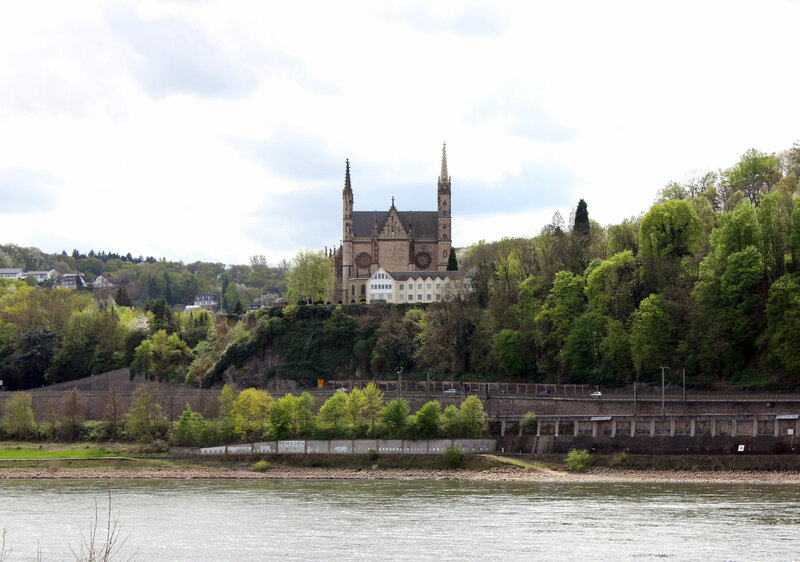 In 1110 the Benedictines of the Michaelsberg Abbey, on the initiative of the people of Remagen, set up a provost there. The relics of Saint Apollinaris of Ravenna probably arrived on the mountain at the end of the 14th century, since a pilgrimage to the Apollinarisberg is recorded in 1384. The sarcophagus is the main relic in the 14th century crypt of the church. 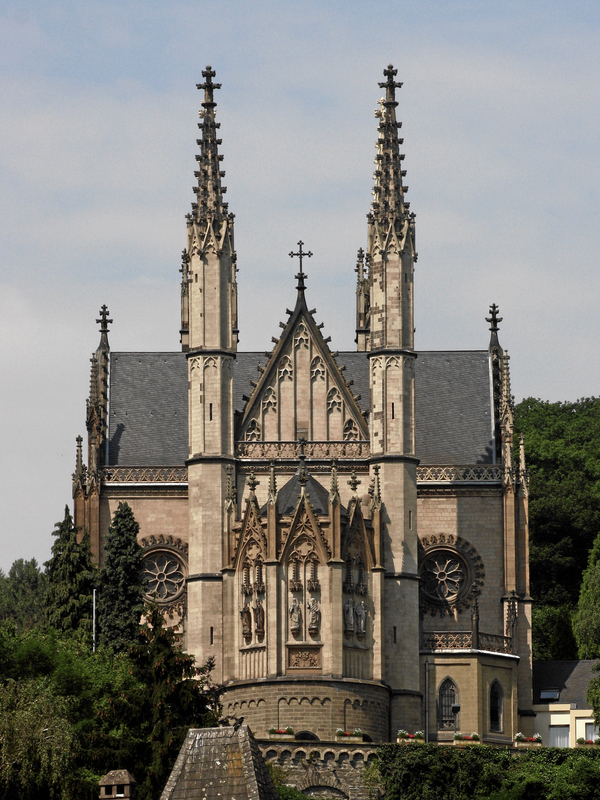 A new Neo-Gothic church was built on the site from 1837 to 1852. Relics of St Apollinaris were brought to this city in the 12th century. In 1383 all of these relics, except the skull, were stolen by Duke Wilhelm I and brought to Düsseldorf, Germany. The skull was kept for the next few centuries in several different locations including for a time in Düsseldorf; however, in 1857 it was returned to Remagen where it remains to this day. It rests within a magnificent reliquary bust placed within a large sarcophagus in the crypt of this church. Twice a year this bust is removed for the blessing of pilgrims. 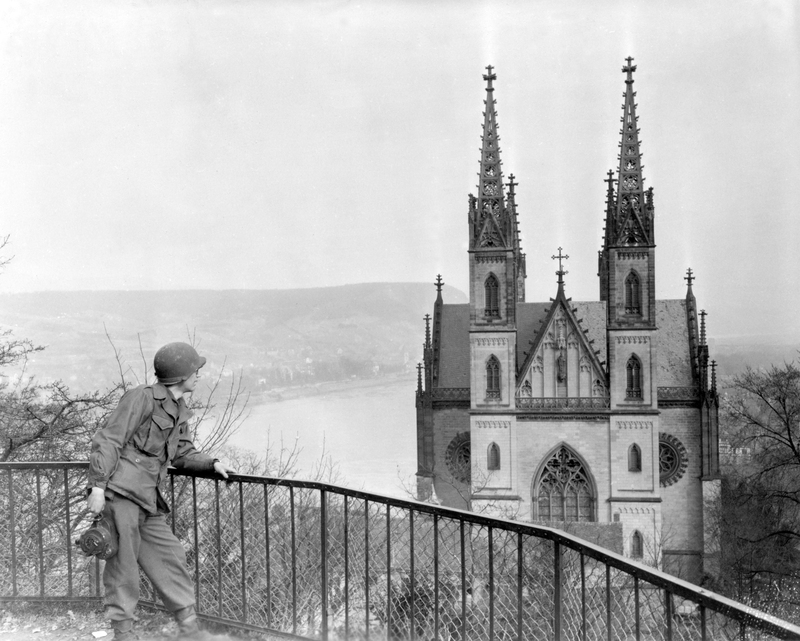 The old church, with its four spires rising high into the air over Remagen, was an obvious landmark for the flood American troops funneling towards the bridge. 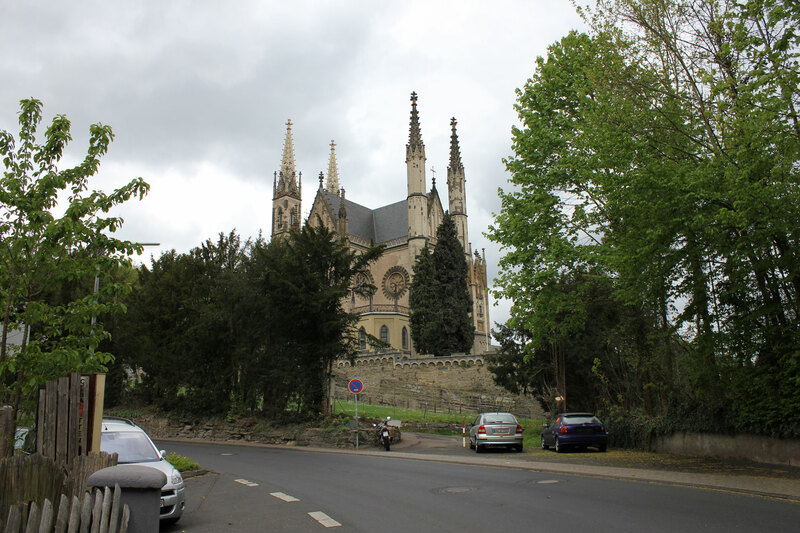 The engineers of the 284th were billeted in the houses below the church. There, they would maintain the roads leading down into Remagen for the thousands of troops and vehicles heading for the Rhine crossing. 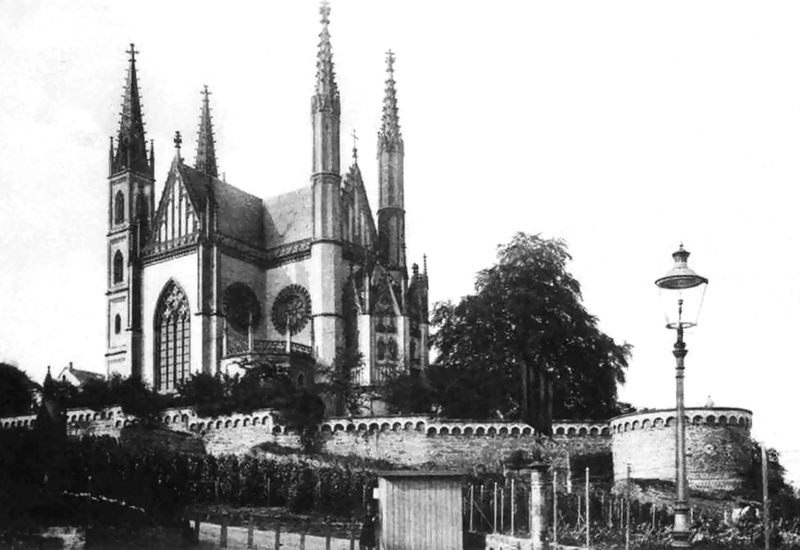 Below: Period photos showing Apollinariskirche. 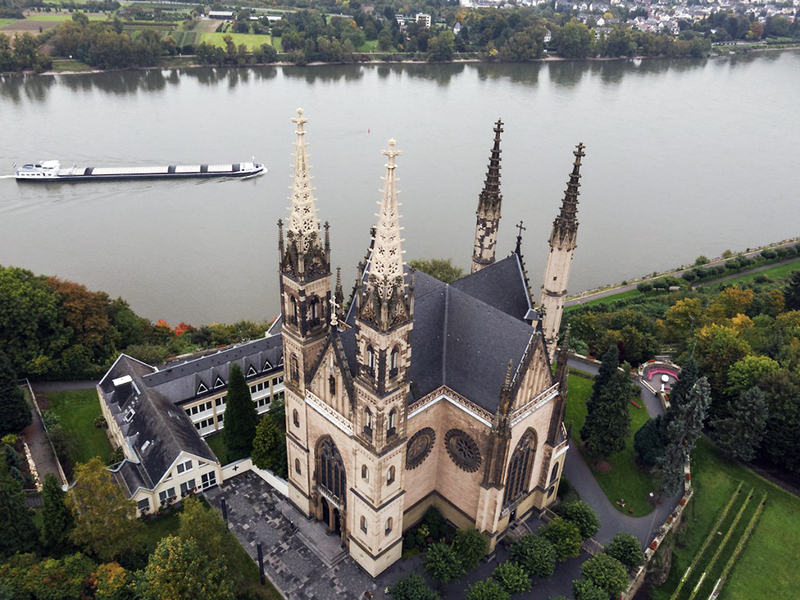 Click here to view a modern panoramic 360-degree image of the Rhine River as seen from Apollinaris Church. This is the same vantage point as the men from 284th Combat Engineers Battalion had in 1945. 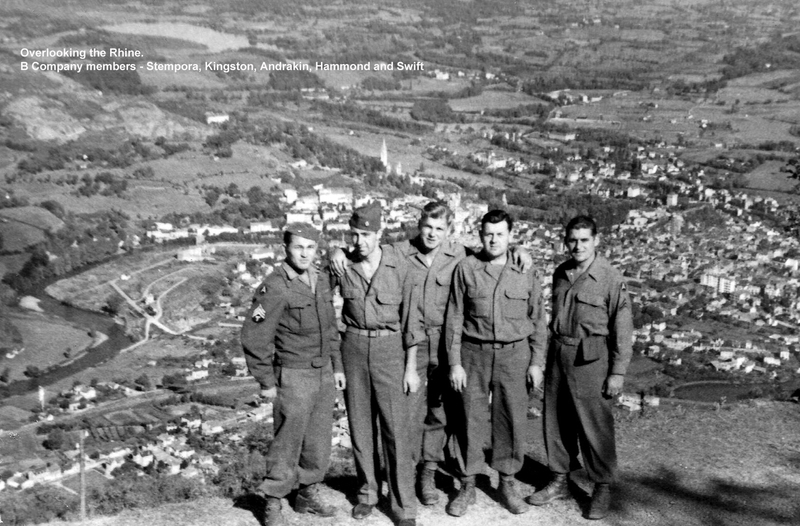 B and C Company Command Posts of the 284th Engineer Combat Battalion were situated on the Martinsberg Hill just NW of the town. This was the "Rhine Wine" vineyard, lower slope, not yet in bloom because it was early March. 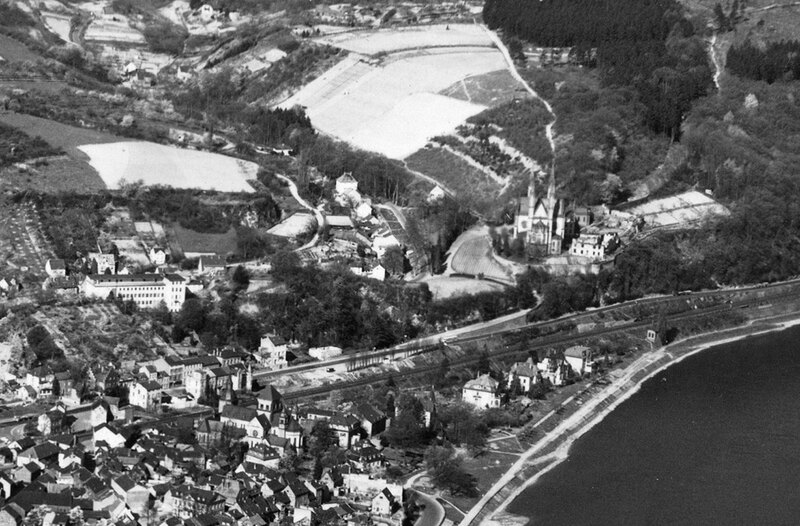 The 284th's location was not inside the town of Remagen proper, but just outside, above the railway line on the west bank next to the church. B Company set up their Command post in a building at Apollinarisberg No. 7, situated directly across from the church. The building had long been an old inn named "Gasthaus zum St. Josef A. Schlich." The guest house served as a meeting point over the years for the faithful making pilgrimages to Apollinaris Church. The building was multi-storied, and as most houses of that period, it had a basement. 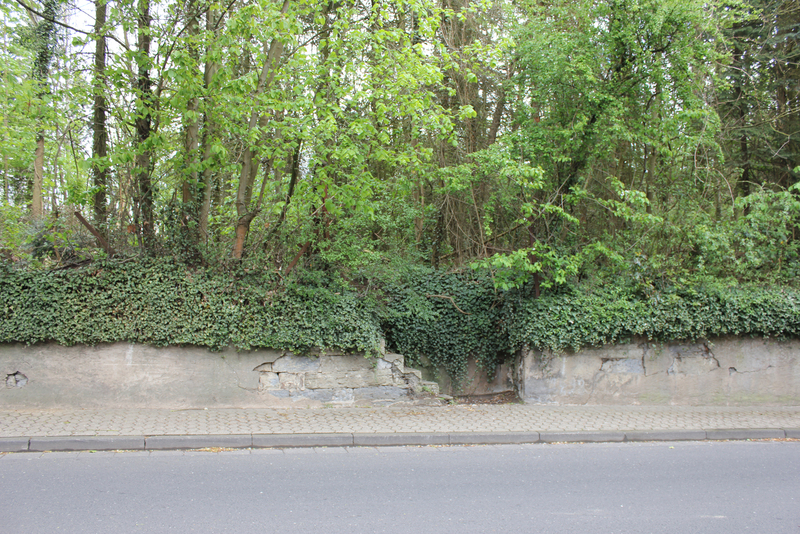 C Company's command post was located at the east end of Apollinarisberg, near the curve of the road Birresdorfer Strasse. 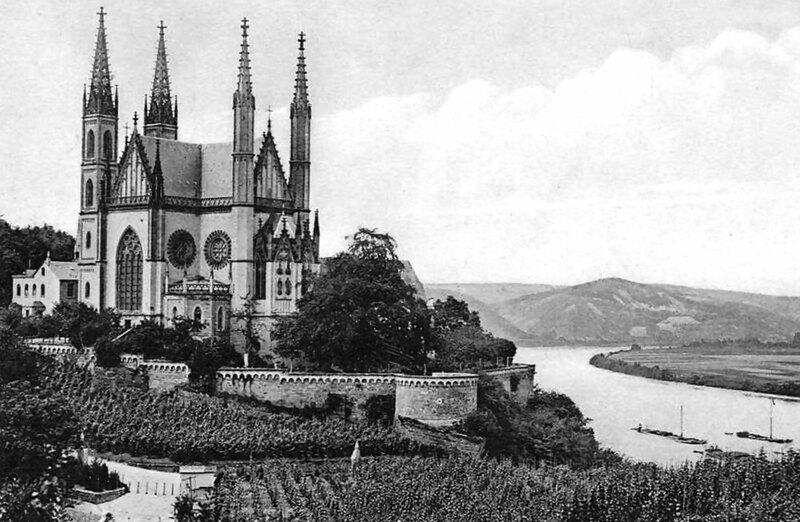 The building was next to a large vineyard, that was below the church, on one of the last hills before the river bank. 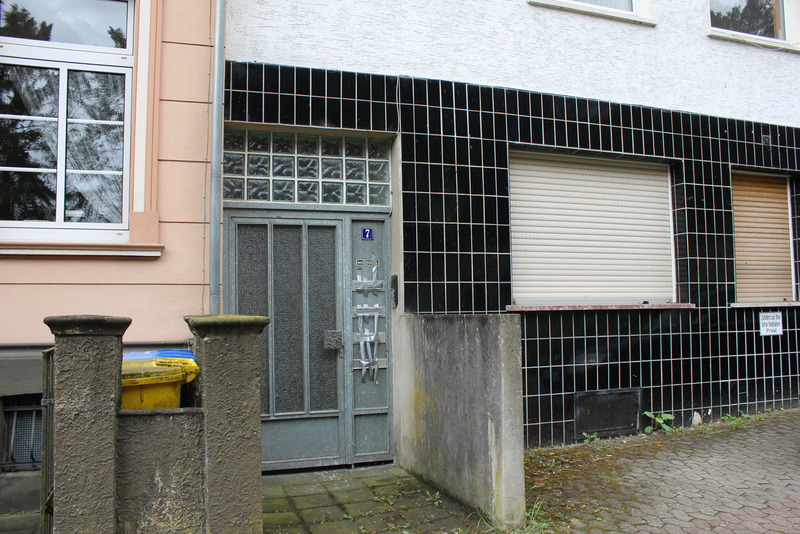 The 3rd Platoon of C Company was staying in a house further down Birresdorfer Strasse. This was called a house of "mystery" as there were supposed to be caves that stored military secrets, in the cellar or the grounds nearby. A certain Lt. Col. Holtz, an SS Trooper, had formerly occupied the house. 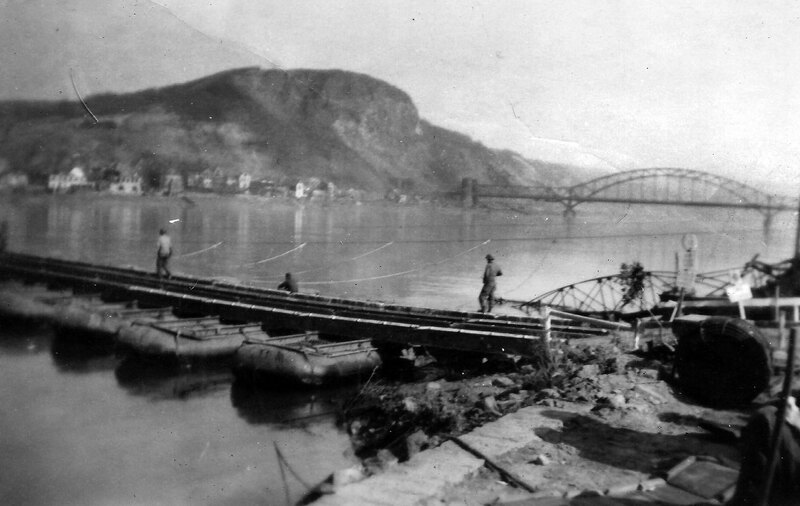 Since the capture of the Ludendorff Bridge on March 7, the men of the 284th had been busy maintaining the roads on the west bank of Remagen for the thousands of vehicles moving towards the Rhine crossing. They had been subject to artillery attacks from the Germans and had witnessed the desperate Luftwaffe air attacks in the days following the capture of the bridge. 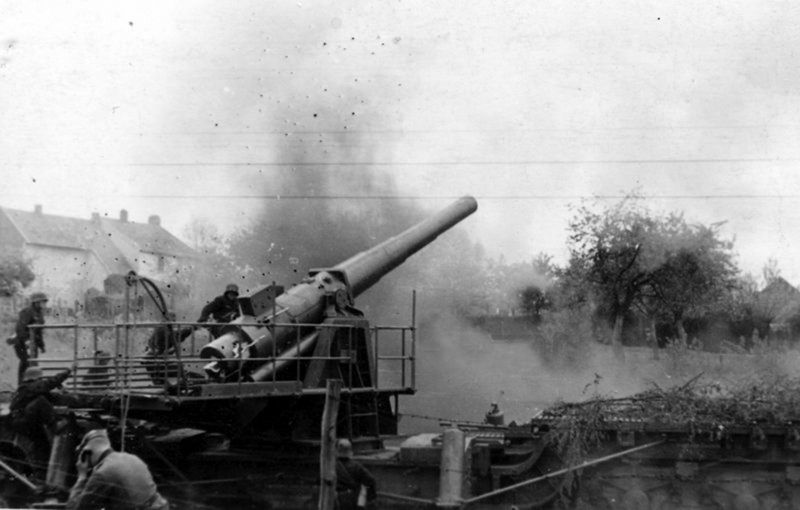 On the morning on March 17, 1945, the Germans fired even larger shells than the usual 88mm. Several rounds of giant 60cm projectiles from a tank-mounted piece called the Karl Mörser (howitzer) landed in Remagen. From their positions higher up by the church, the soldiers of the 284th had a clear view of the river, the bridge, and the town of Remagen. They could see the engineers of the 51st and 291st Combat Engineer Battalions below and had watched the construction of the ponton bridges across the river. 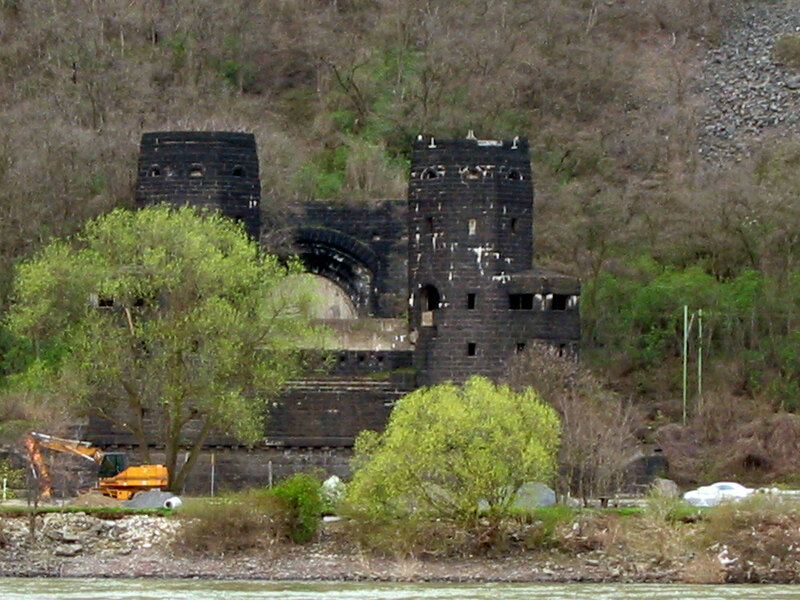 The German artillery could be seen landing near the bridge and in Remagen. Later that afternoon, the men of the 284th Combat Engineers Battalion would soon meet the largest piece of German artillery. Below: Pre-war photos. 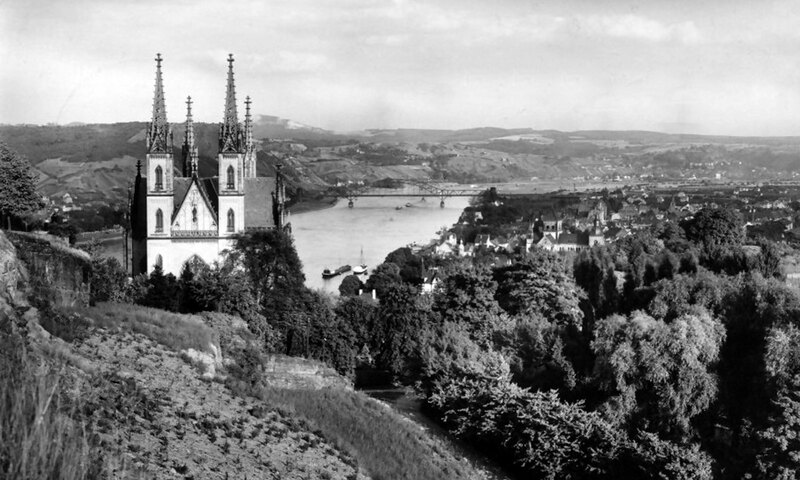 View from Apollinaris Church of Rhine River, Ludendorff Bridge, and town of Remagen. 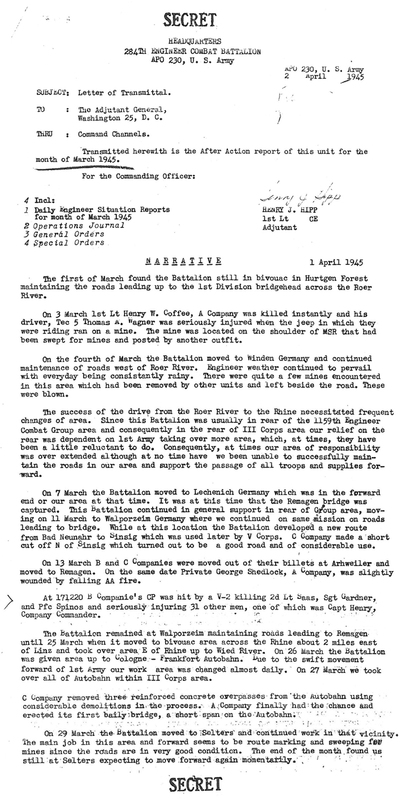 Edmund MacNeil Jr., Headquarters and Service Company of the 284th, wrote about the V-2 strikes of March 17, 1945, near the river. He explained; on that morning he was in a jeep with Lt. Hochberger on the hill up by Apollinaris. They were looking out towards the river at all the activity near the bridge. One of the men snapped the photo on the left. At 9:54 AM, the first V-2 strike came down on the Erpeler Ley hillside on the east bank. The two men watched it bring up quite a bit (soil) of the hill, like an expansion of earth. 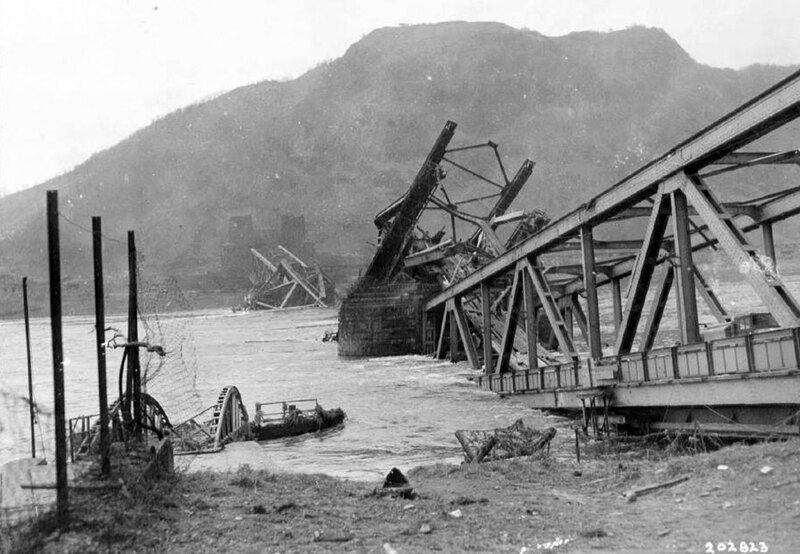 They then drove down into Remagen, crossed the ponton bridge, and climbed the hill to observe the damage. They found the rocket motor in an upright position with reddish liquid (alcohol) dripping from it. The two men looked it over, but soon MP's, who came quickly, seemingly from nowhere, closed off the area. MacNeil and Hochberger returned to their jeep and crossed back to the west bank. They drove back up near Apollinaris church to finish some battalion business, and when completed, they drove further down the river and west to Arwheiler. It was only minutes after they left the area, B Company CP was hit by another V-2. Probably what MacNeil witnessed was a V-2 "air-burst," which is, an explosion of the fuel tanks just before impact. This would have scattered the rocket parts over a wide area (assuming the rocket was at a sufficiently high altitude) and would have allowed the warhead to impact in a conventional manner as it did. Parts from this rocket were found all over the area near the bridge and Kasbach. The V-2 that hit 284th Combat Engineers Battalion B Company Command Post came down around 12:20 PM. Some of the men were gathering at this location for lunch. 1st Lt. John Ripandelli was a Staff Officer with S2 section of the 284th. He was a Reconnaissance Officer (with his own jeep) and saw a lot of the bridgehead area as he traveled ahead of the battalion. Ripandelli had been invited by Captain Henry, if ever on a recon in the area, to drop in for lunch some day. When Ripandelli arrived the Captain said lunch wasn't quite ready. He suggested that Ripandelli should take a hike up the hill to see a famous old Church while waiting. Just as "Rip" had just reached the top of the hill, the V-2 struck farther down, right on the command post while lunch was being prepared. Ripandelli remembered, "I saw a very faint, almost unnoticeable, fast-moving contrail as it came in. 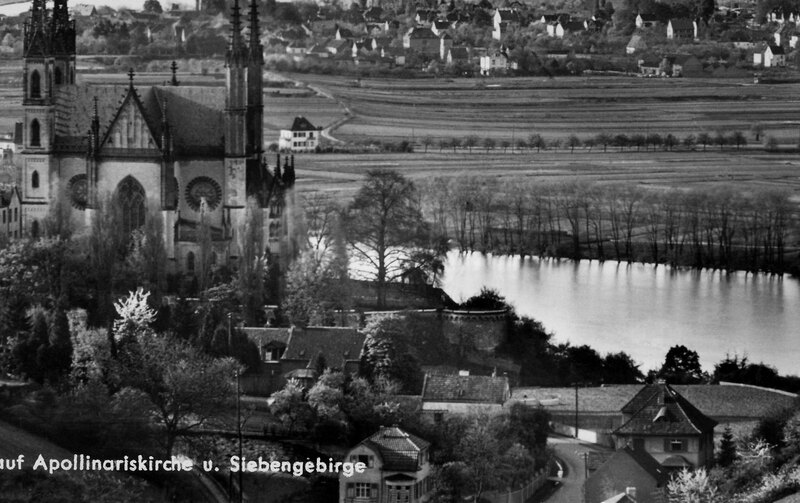 I had just reached the top of the hill to visit the lone church up there and had turned to catch my breath and looked over my shoulder at the Rhine far below when I saw this movement in the air. It lasted only a second before the area of the command post farther down the slope went up in a cloud of smoke, thrown up soil and building debris. Then, I simply don't recall a damn thing." At the moment of impact the "Gasthaus" at Apollinarisberg No. 7 collapsed upon itself. The occupants on the first floor were thrown down in the basement. This V-2 strike also destroyed several other buildings near the church and caused collateral damage to buildings within 1,000 meters. The impact shook every structure in the city. The heavy rocket motor combustion chamber bounded 300 feet eastward and crashed into a shed near the cottages where C Company was billeted. A soldier was in the shed reading at the time, but was not injured. 19-year-old 284th soldier Elliot Rose was a member of B Company. On the morning of March 17, Rose was stationed in the back of a truck while manning a .50 caliber machine gun in the courtyard of the Apollinaris church. Looking out at the Rhine from this vantage point Rose remembered a sudden flash. At the moment of impact on the B Company CP he was knocked from his feet. Rose, who was a few hundred yards away from the impact, said the blast left him stunned and unable to speak for several hours. He and the others from his unit went through the motions of cleaning up while dazed. He remembers the shock wave was so tremendous, every house in Remagen shook and took damage. Rose commented, saying in his opinion, the thunderous V-2 impacts that morning were responsible for the Ludendorff collapse a few hours later. Many of the men from the 284th were not altogether unfamiliar with V-bomb strikes. Before disembarking to ETO many had experienced the sounds of V-2s hitting London. However, this was different—these were their buddies. Members of first and second platoon of C Company, who were billeted several houses down to the east, near the curve of the road, immediately came to the aid of their B Company brethren. Soon help was arriving from various units and heavy lifting equipment was brought in to remove the debris. Photo above is from Apollinarisberg 1935: Located on Apollinarisberg No. 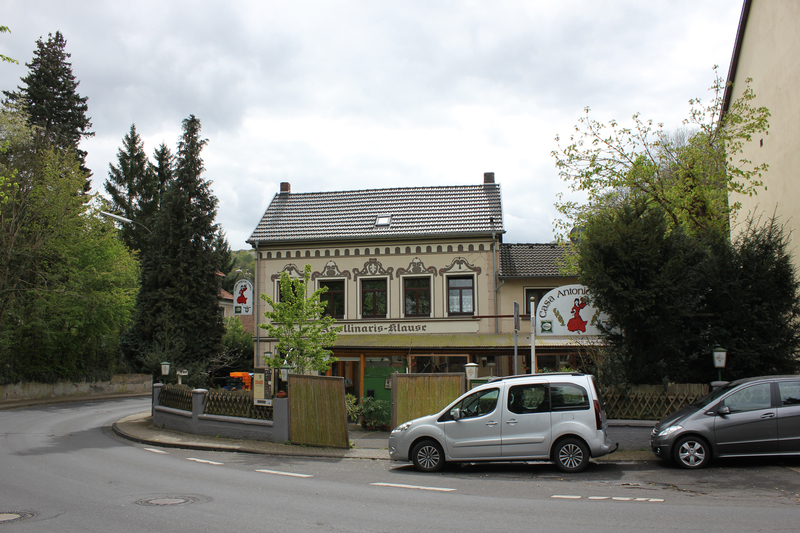 7, parallel to the road Birresdorfer Strasse, stood the old inn named "Gasthaus zum St. Josef A. Schlich." It was a meeting place for the faithful, especially during the St. Apollinaris pilgrimages. B Company US 284th Engineer Combat Battalion was billeted here when a V-2 strike destroyed the building on March 17, 1945. Eight men were inside the building when the V-2 struck and others were milling around outside before lunch was served. Two of the men recovered from the debris were dead, another died en-route to a hospital. Killed in the blast were 2d Lt. Sass, Sgt. Gardner, and Pfc. Spinos; 31 other men were seriously injured—one of which was Captain Henry, B Company Commander. Although seriously hurt, Captain Henry was able to dig himself out from the building and direct the efforts to find the others. Henry was replaced by 1st Lt. Charles Finger. 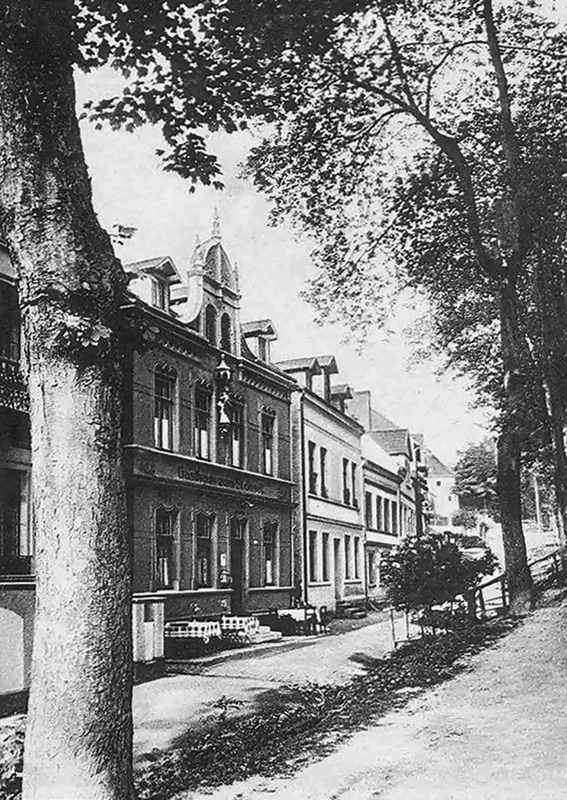 The three men killed were temporarily laid to rest in the garden of a home up the street to the west on Apollinarisberg. The following day a special group of British investigation teams came to the impact site and asked questions and took many measurements. 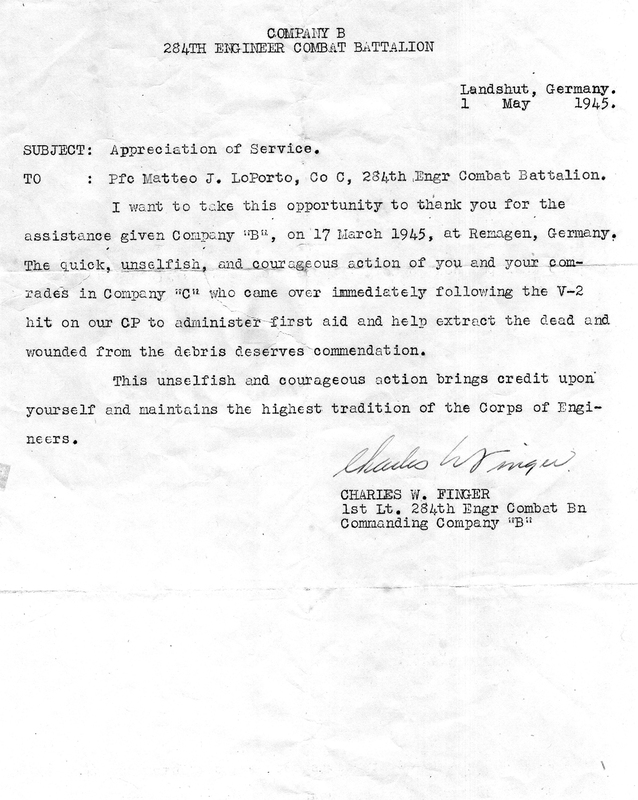 Lt. Charles Finger, commander of B Company 284th Engineer Combat Battalion, later recalled the incident in a letter of thanks to the men of C Company; "I want to thank you for the assistance given to Company B, on 17 March 1945, at Remagen, Germany. The quick, unselfish, and courageous action of you and your comrades in Company C, who came over immediately following the V-2 hit on our CP to administer first aid and help extract the dead and wounded from the debris, deserves commendation. This unselfish action brings credit upon yourselves and maintains the highest tradition of the Corps of Engineers." There was also damage to the centuries-old Apollinaris Church. The roofs and glazing were partially destroyed, which caused more damage in the coming months to the art frescoes and interior treatments. Repairs could not be carried out until 1947. First Army broke out of the bridgehead and 284th Engineer Combat Battalion, attached to an armored division as supporting infantry, headed north to meet up with the 9th US Army coming south to close the so called "Rhur Pocket." The 1st Army and 9th Army met outside Paderborn on April 1. When the operation was over they had captured around 350,000 German prisoners. On May 1, 1945, they laid Bailey bridges across the Isar and Altmul rivers and assisted with liberating various forced labor camps. At 12:25 hrs, 17 March 1945, a German V-2 rocket struck the Company CP of Hillvale Baker, at Remagen, Germany. Thirty-five persons were injured and three killed. There were five officers and ten EM billeted in the CP building. Eight persons were in the building at the time of the explosion. The second building east was the quarters of the First Platoon, two squads of which were present. As the smoke and dust cleared, it revealed members of the First Platoon evacuating or being evacuated from their building. The junction of the main road and Church Drive was designated as the point for all casualties to gather. A pair of 2.5-ton dump trucks were summoned to the point to remove the casualties. A jeep was sent to Charlie Company to get aid men. At approximately 12:35 one ambulance, a medical officer, and three aid men arrived from 1111 Engineer (C) Group. They immediately began giving first aid. The explosion had brought many soldiers to the scene. They were informed that approximately six men were in the fallen building, and were immediately put to work removing the debris to get to the men inside. Just as they started, the Company Commander, Capt. Thomas C. Henry climbed out. He had dug himself out. He said there were several men inside and encouraged the men to dig quickly. A winch from a 2.5-ton dump truck was used to raise a large piece of the building so they could get beneath it to the men inside. By this time all the men had been evacuated from the First Platoon building, given first aid, tagged and were either on the first 6x6 or in the ambulance. They were escorted to the 102d Evacuation Hospital by an MP officer on a motorcycle. This group of men included the first man removed from the building. The next person removed from the debris was the 1st Sergeant and he was taken to the 9th Armoured Aid Station in Remagen on the jeep of one of the Company Platoon Commanders. This Officer upon his return brought two ambulances from the aid station. As soon as first aid had been given to all the casualties, the medical officer from Group went up to the church to an AA gun position and injected members of that gun crew. He was then escorted to the quarters of zone AA members that were west of and across the road from the explosion. Six members of Baker Company were in that building and had been given first aid. They were all well taken care of, covered tagged and ready to be evacuated. An ambulance was summoned to that building and they were evacuated to the 102 Evacuation Hospital. The Group medical officer then returned to the scene and was ready to give immediate first aid as the men were pulled from the wreckage. A major of the medical Corps was present and up to this time had been caring for the men as they were taken from the wreckage. At approximately 15:30 hrs the eighth and final person removed was Lt. Louis F. Saas, Jr., First Platoon Commander. The Company Commander dug himself out. Seven were dug out. Two were dead, four injured and one died from head wound in route to the hospital. Six of the wounded returned to duty that evening. During the operation a bulldozer was brought up, but was not used since we didn't know the exact location of the bodies beneath the debris. This incident has been the topic of conversation since, and I feel that under the circumstances, the control and caring for the wounded was exceptionally good. Above: Men of B Company 284th Combat Engineer Battalion. 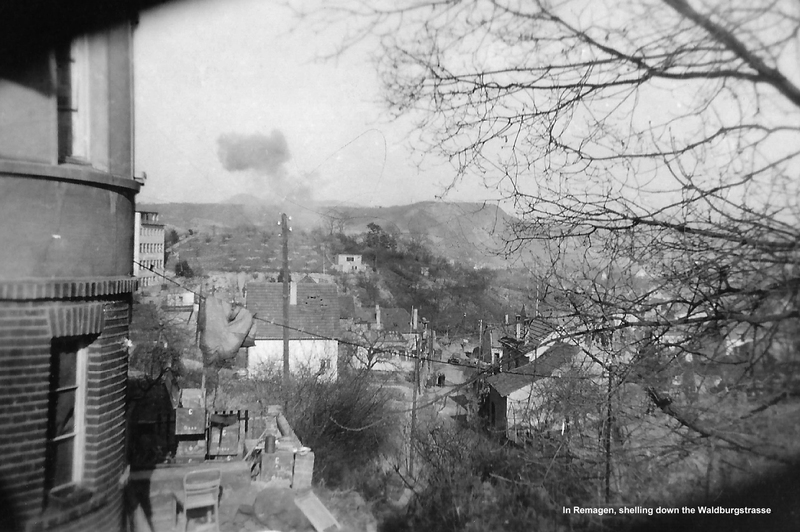 This photo above shows the view behind the house of C Company 2nd Platoon, looking toward the Rhine River. 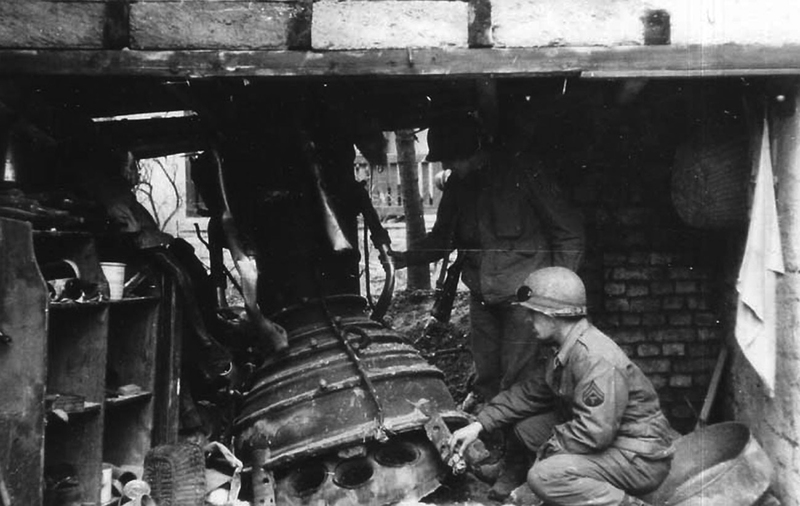 Captain Henry G. Heubach (C Company Commander) is photographed kneeling by the remains of the heavy V-2 high-speed gas-turbine pumps. When it came to rest, part of the pump was covered with ice and another part was red hot. The turbopumps forced 128 pounds of alcohol and 159 pounds of liquid-oxygen into the V-2's combustion chamber every second. Shown above is the V-2 combustion chamber. After striking near CP of B Company, this piece bounded about 50 yards into the rear of the house occupied by C Company, 2nd Platoon. It knocked out this wall of a shed beside the house and ended up in this position. C Company 284th Combat Engineer's Tech 5 Electrician Clarence Bachand (squatting) examines V-2 combustion chamber. C Company 2nd Platoon, 2nd Squad Leader, Vernon Lindholm (standing) examines aluminum tube and pipe. 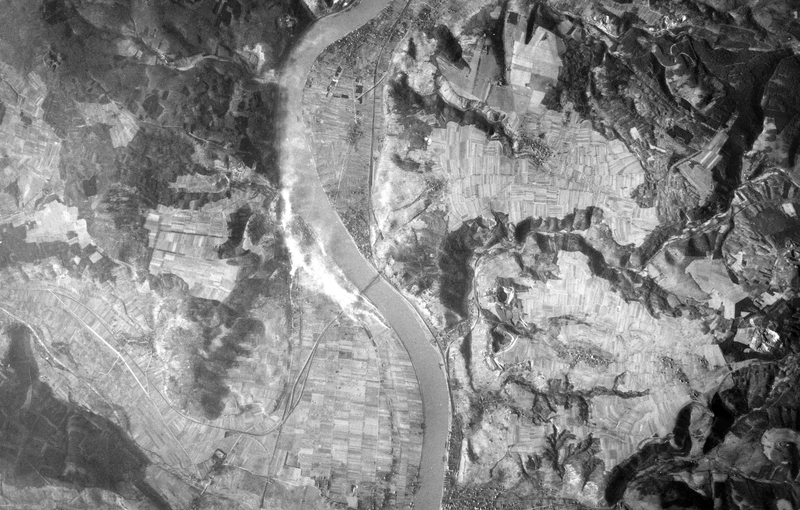 Below: Photos from 284th archives and the area near the V-2 strike. Thanks to Mikel Shilling. "the house with black tiles," Apollinarisberg No. 7, is known as the place where the V-2 came down. 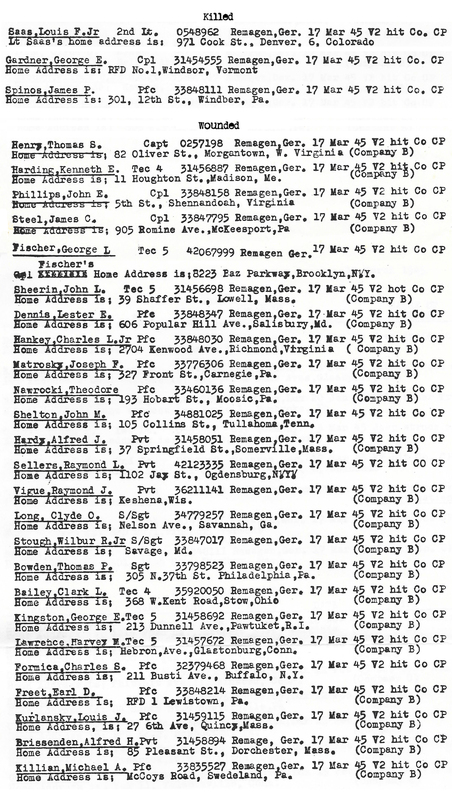 veterans who were there in Remagen in 1945. Below is this film in two parts. Click in lower right corner of each clip to view full-screen.